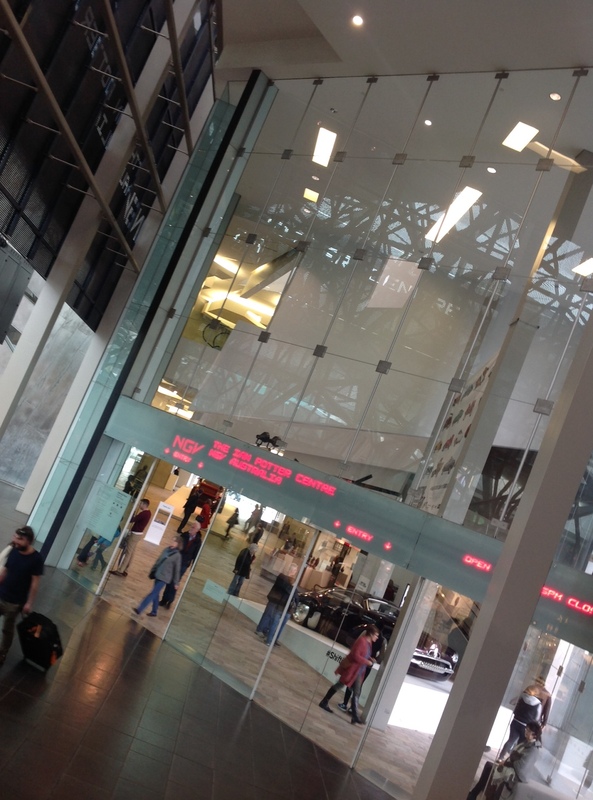 Posted: July 10, 2015 in Features, Who,What,Where & When...? 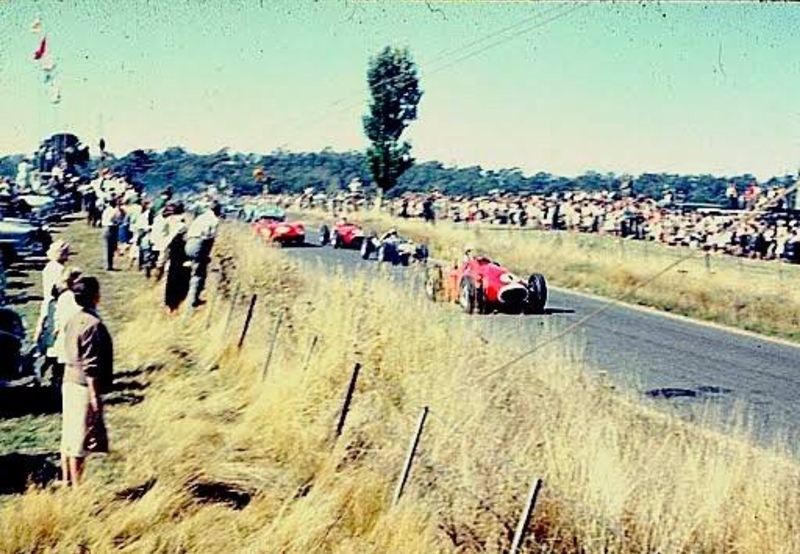 The first post war AGP in South Australia was held in the Barossa Valley, not on the daunting Lobethal road circuit where the 1939 event had been held, but just down the road, the circuit basically a square layout of 3 miles on flattish land. A permit for ‘Loby couldn’t be obtained but one for ‘Nuri was with the intervention of some prominent local businessmen including John Hill-Smith of the Yalumba wine family. 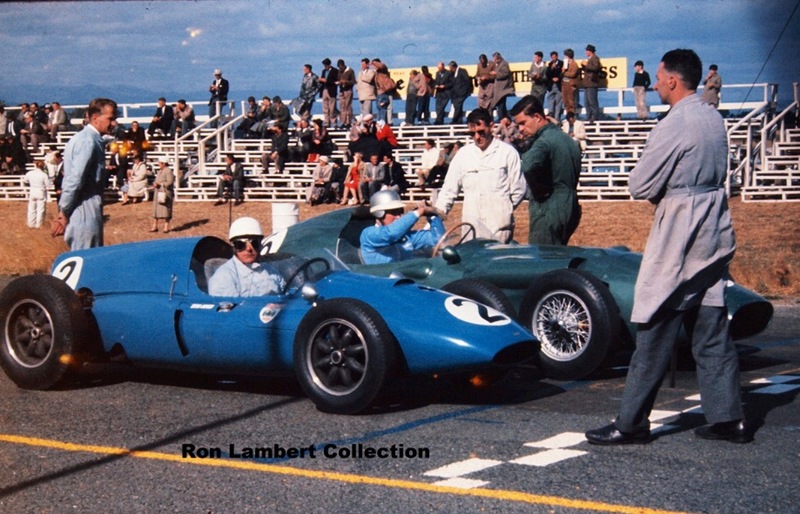 The Sporting Car Club of SA ran the event to the Australian Automobile Associations decree, the winner was the competitor finishing in the fastest time but otherwise in the best traditions of the AGP at the time, the event was a handicap and awards were made on that basis. Geddit? 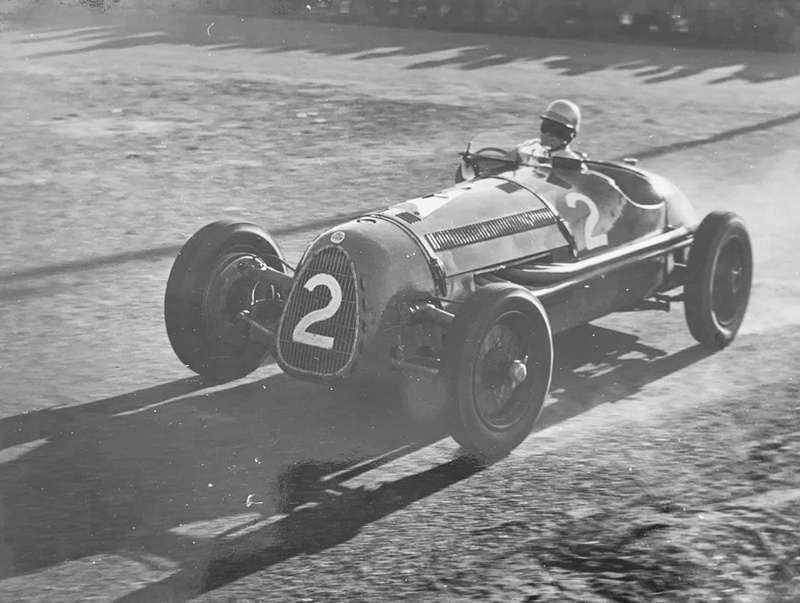 Lex Davison, who would later win 4 AGP’s started his Alfa Romeo P3. 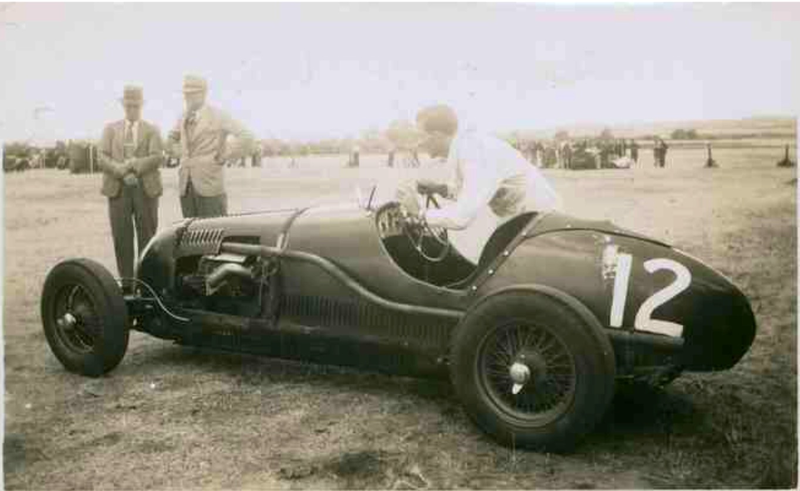 The scratch man was Tony Gaze’ 1935 2 litre supercharged Alta, although he was not to start after dramas in a preliminary race. All these racers were Melburnians. 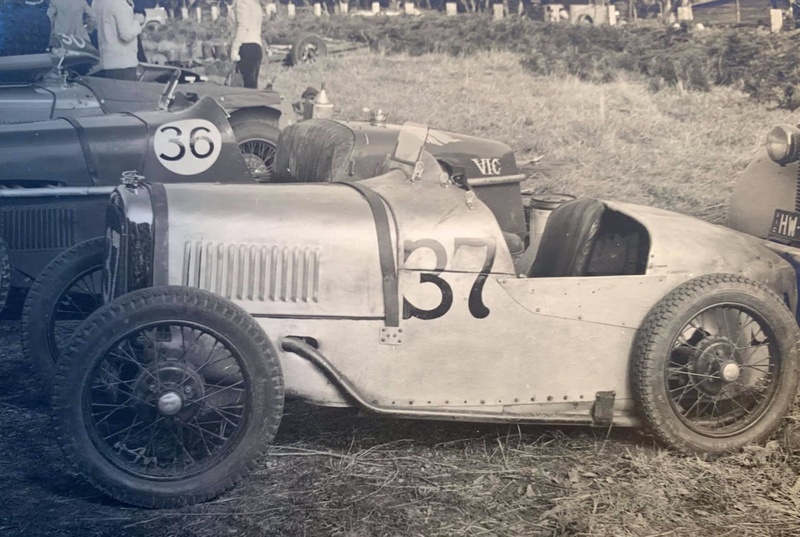 Fastest resident was Harry Neale in Eldred Norman’s, extraordinary ‘Double 8’ which married the chassis of a weapon carrier and a pair of single carb Ford V8’s from army trucks. It had independent suspension on all four corners, 7834cc in total and was rated a good chance on a ‘point and squirt’ course like Nuri with slow corners and long straights. 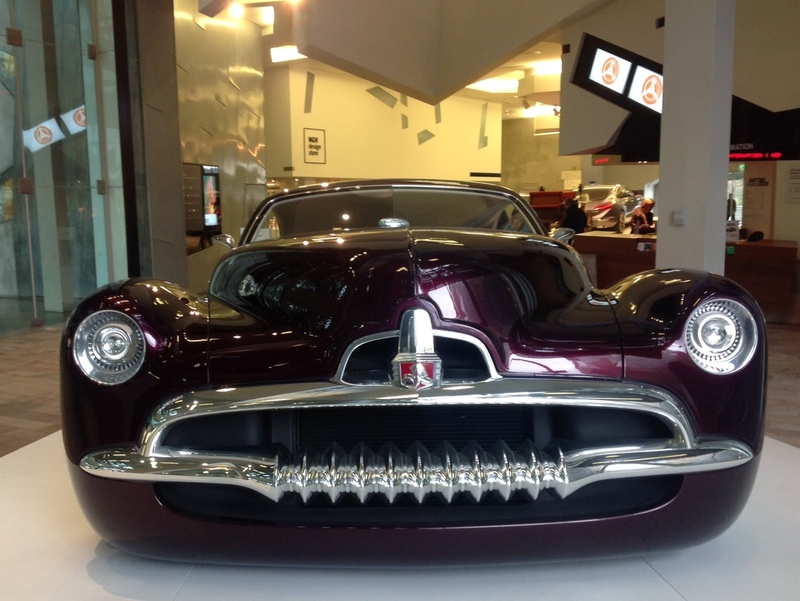 See the section below on this amazing car. 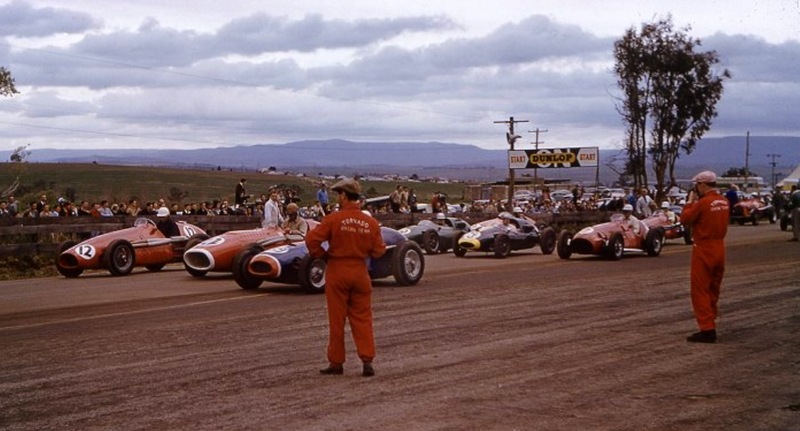 Australian Motor Sport Magazine described the race day scene as follows; ‘Brilliant sunshine made the competitors paddock a colourful spectacle with racing cars in different hues, tender vehicles ranging from furniture vans and in which the Steele cars had been brought from Melbourne to the luggage trailer which Peter Damman had towed behind his racing Hudson the same distance. In a handy position near the course Motors Ltd’s mobile service van was in constant demand with its stock of racing oils, spares and field workshop’. 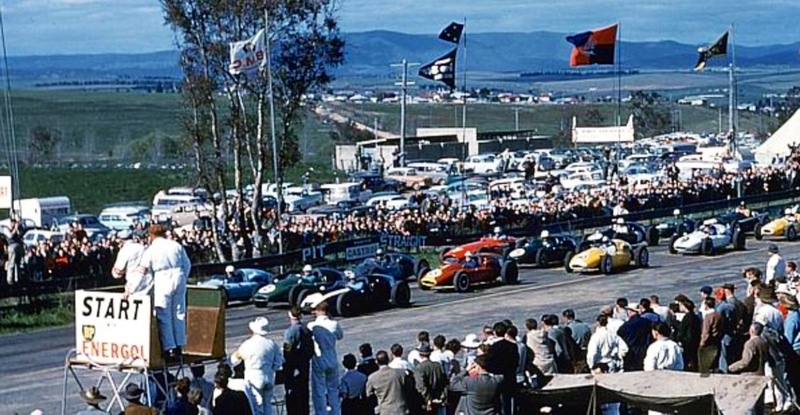 The race itself was diminished by the inability of Gaze to start, Davison’s retirement on lap 1, having lost compression on 2 of the Alfas 8 cylinders and Deans withdrawal on lap 21 with magneto, overheating and braking problems. 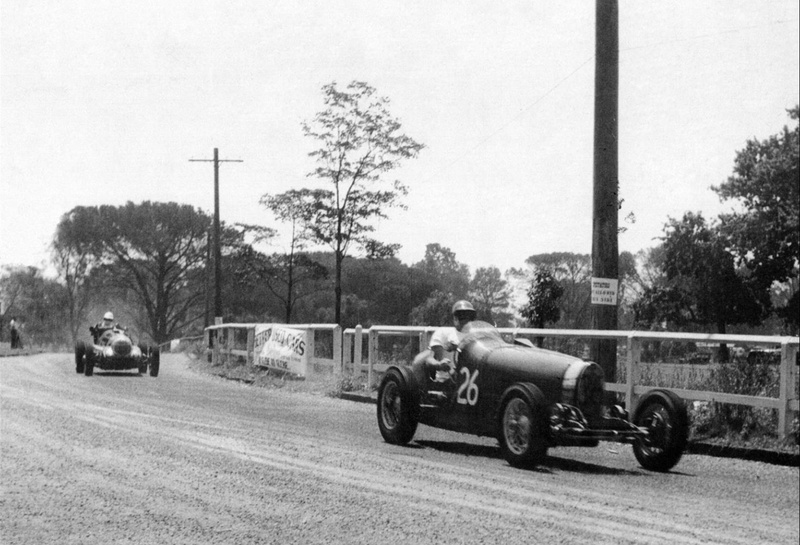 What was absorbing was the battle between the ‘Aussie Battler’ garage proprietor Whiteford in his carefully evolved and very well driven Ford V8 Spl, and the ‘Silvertail’ from Toorak, Rupert Steele in the aristocratic Alfa. The latter had the edge on top speed but the Ford, with more supple suspension was better suited to the South Australian country roads. 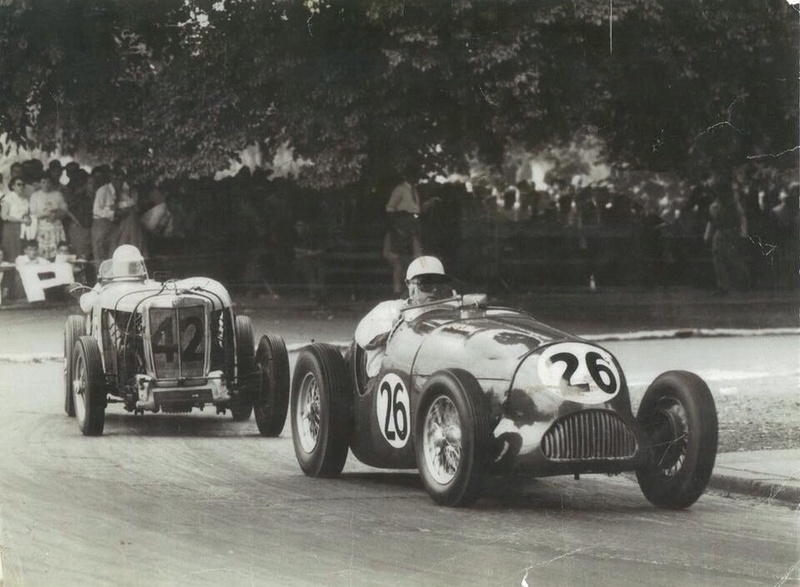 Whiteford was a hard man as a driver, but the novice Steele was no slouch, he must have been ‘a natural’ to adapt to the GP car with experience limited to a few hillclimbs and speed events in a Bentley road car. On lap 13 Steele ran out of road having passed a gaggle of MG’s, spun the big Alfa and stalled. He lost about 1:49 seconds, hand cranking the supercharged straight 8 back into life but his race was effectively run. Whiteford won the race from Steele’s Monza and Jim Gullan’s Ballot Olds, the latter first on a handicap basis from David Harvey and Ron Kennedy, both in MG TC Specials. 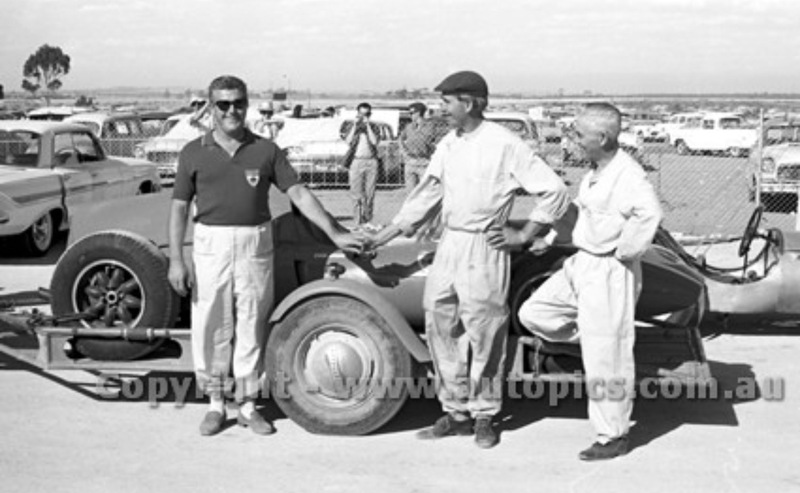 Steele’s sporting focus was on horses for the rest of his life, sad really as his potential as a driver was clear, the Alfa was sold by the end of 1951. 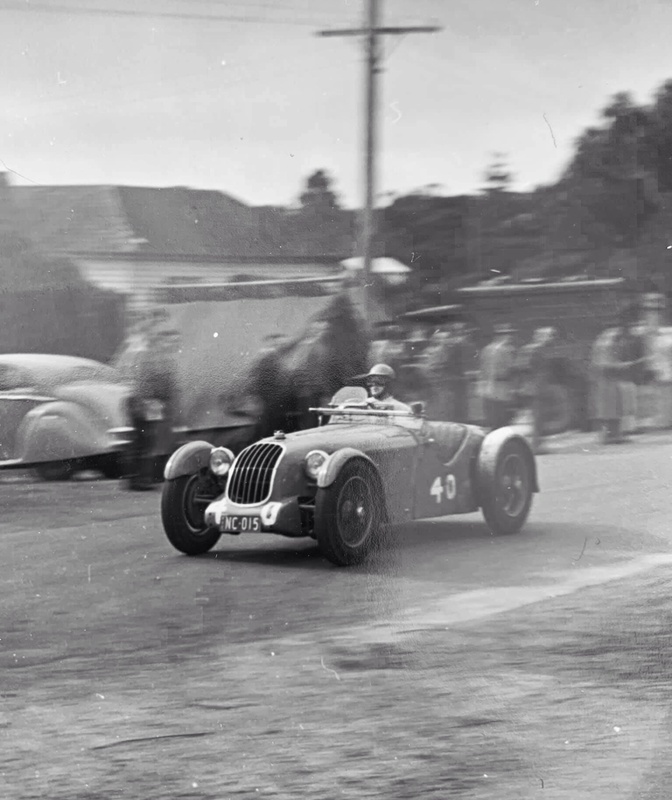 The stimuli for this article were several shots I found in the State Library of South Australia archive of the Dean Maybach, McKenna BMW 328, Jones HRG and other cars. 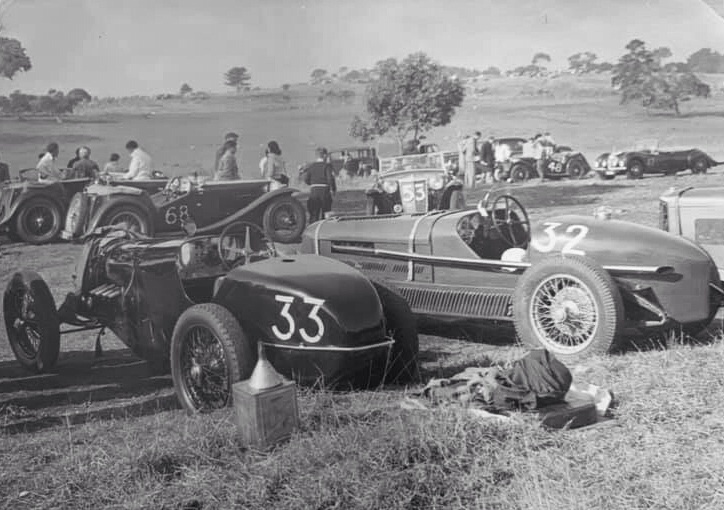 I’ve done the Maybach to death in the Jones article referenced above, here are some notes about the other cars, John Blanden’s ‘Historic Racing Cars in Australia’ has provided some of the detail. 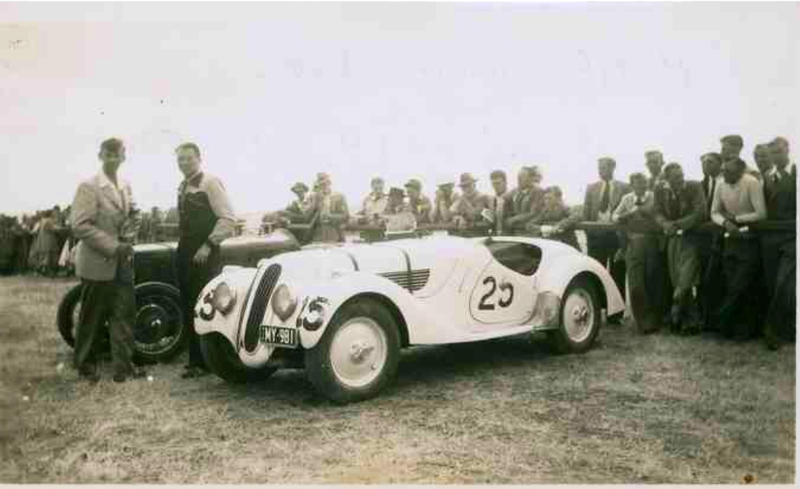 McKenna’s BMW 328 was raced by him all over Australia; Rob Roy, Fishermans Bend, Ballarat, Port Wakefield, Albert Park’s initial meeting in 1953 and as far afield as Southport on Queensland’s Gold Coast for the 1954 AGP, when he overshot a corner and rolled. 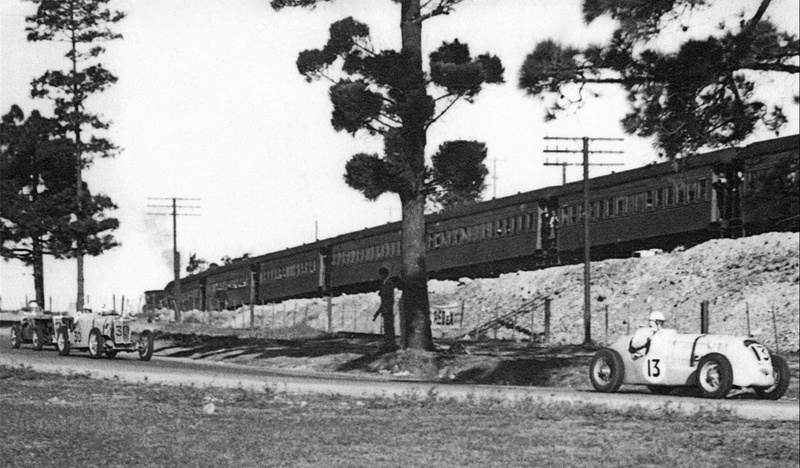 The car passed through many hands before leaving Australia in the early 2000’s, chassis # 85136 was brought into the country by John Snow, who acquired the car on one of his regular trips to Europe in 1937. 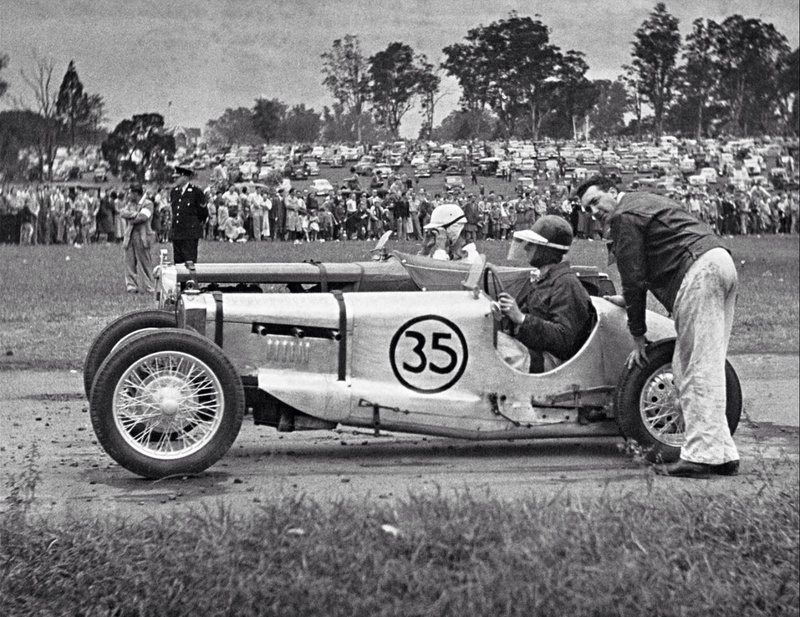 The car was bought from a German General on behalf George Martin, president of the Light Car Club of Australia in Melbourne. 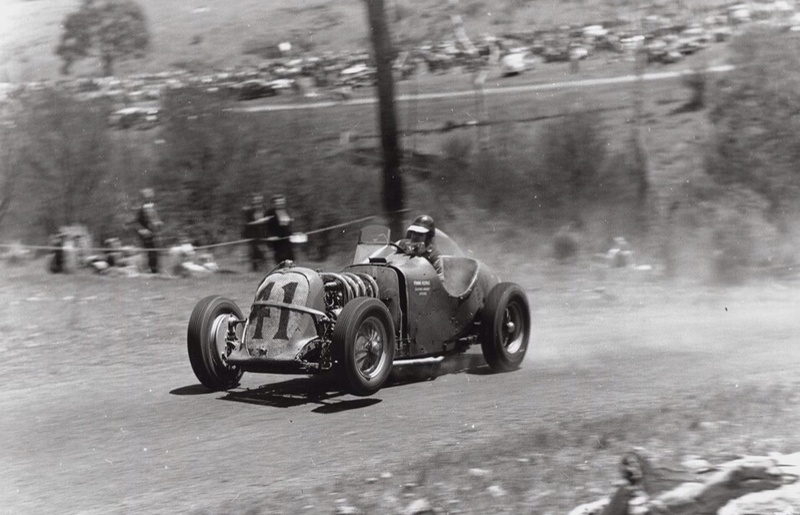 The car finished the 1938 AGP at Bathurst in 10th, see my article on Peter Whitehead’s ERA which covers this race, Martin sadly had a fatal accident in it near Wagga Wagga on the return trip to Melbourne. Their were two ‘racing 328’s in period, and sadly both were involved in fatal road accidents, the other killing very talented racing driver Colin Dunne and his wife Billie at Phillip Island. Not a race accident mind you, an accident which took place on the circuit between motor-cycle events. 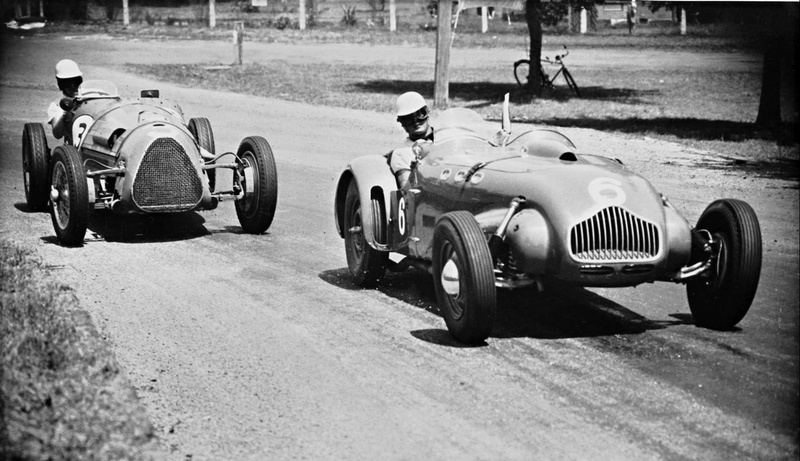 By 1947 the 328 had passed into the hands of champion Geelong motorcyclist and dealer Frank Pratt. 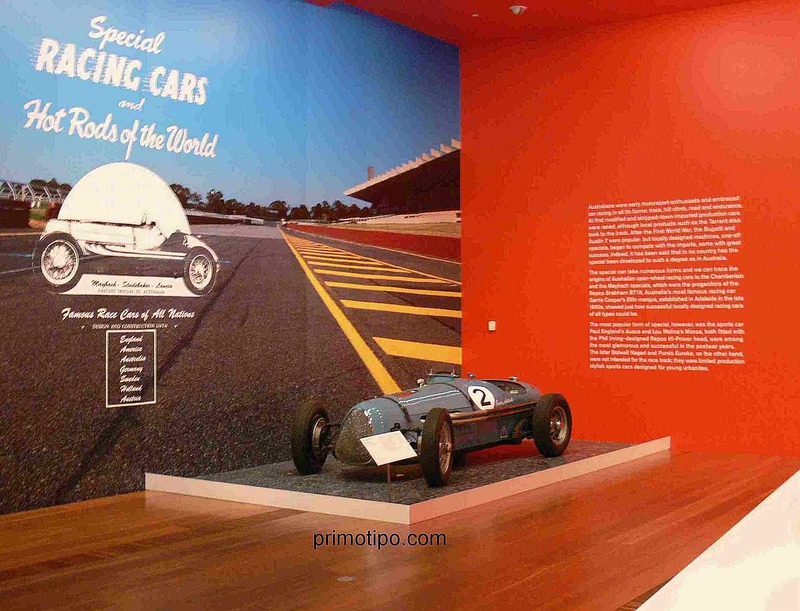 Pratt famously won his first car race, the 1948 Australian Grand Prix held at Point Cook! He was aided by a favourable handicap and excellent driving. 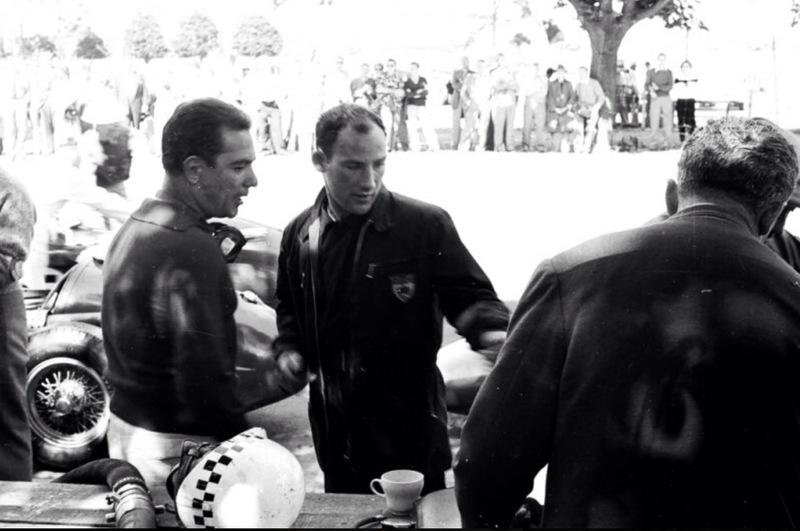 Whilst new to car racing he was well familiar with intense competition. 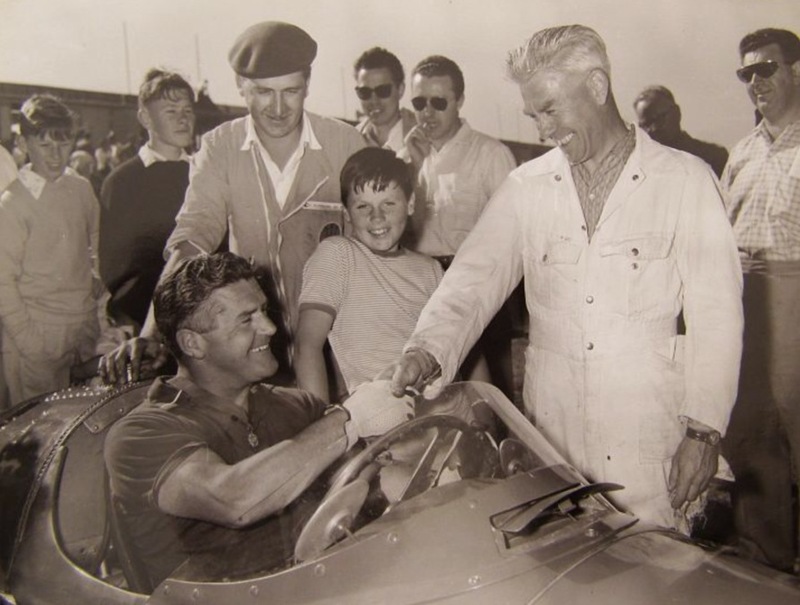 The cars preparation by multiple AGP winner Les Murphy was also a factor…some reports say Murphy was extremely pissed off, he was originally entered to drive the car, and then was supposedly sharing it with Pratt, whose intention to drive the race solo soon became clear to Les once the arduous event was underway! McKenna had a handicap of 9 minutes at Nuriootpa, but was not classified. 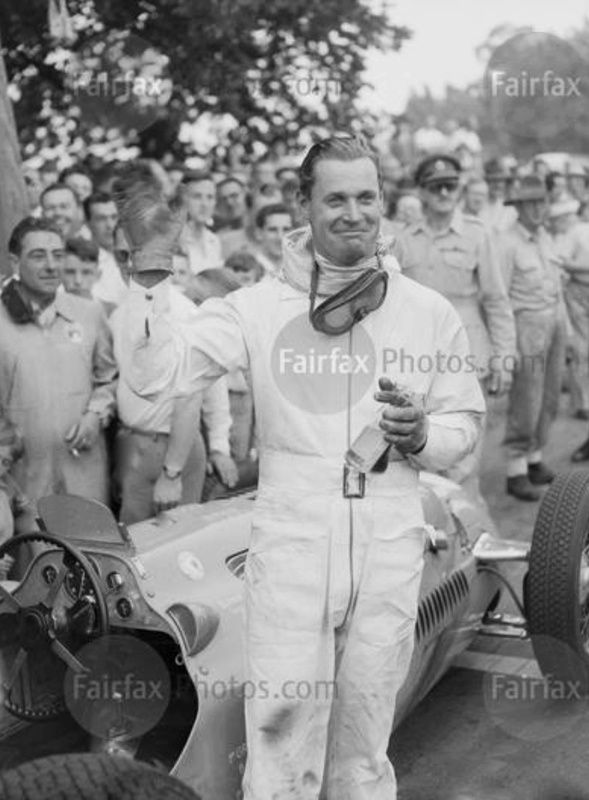 Tony Gaze brought the first HRG to Australia in 1947, the car was uncompetitive. 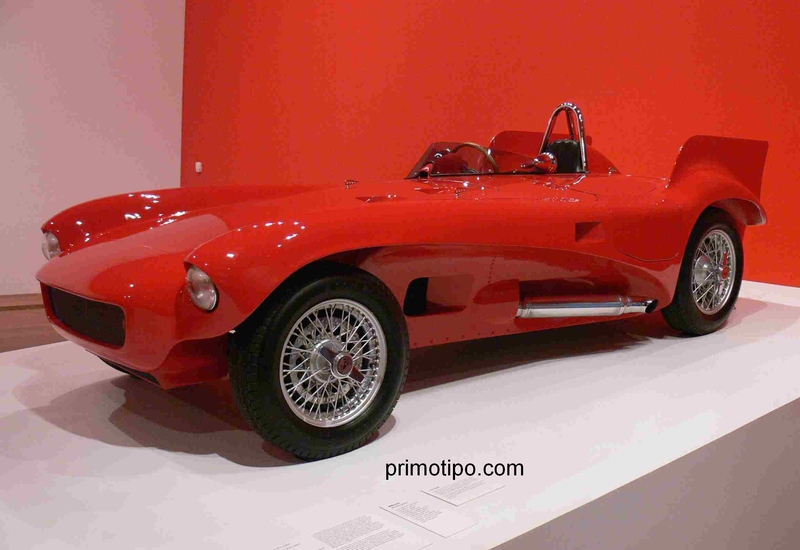 Gaze specified future cars to be light, sports/open wheelers with easily removable lights and guards so the cars could run as sports or racing cars in local events. 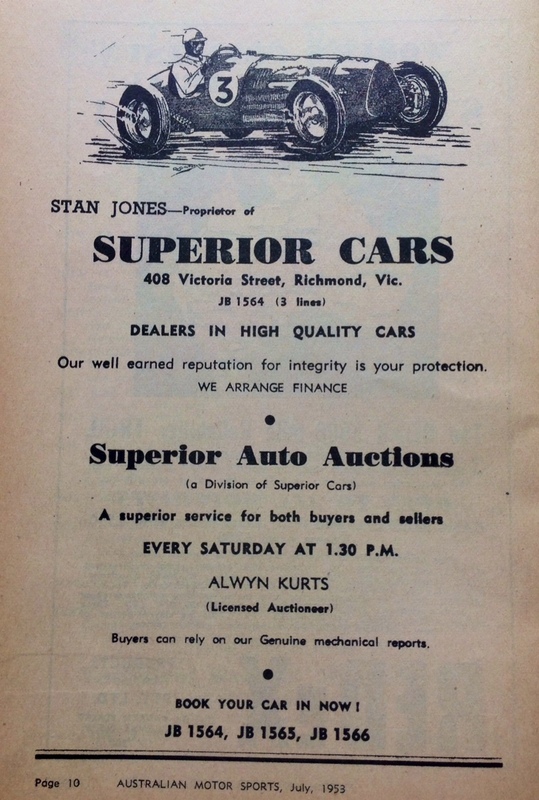 Brown and Dureau, a Melbourne trading firm who ‘Gaze was with’ imported the first car to these specs in 1949, Stan Jones the purchaser of the 1.5 litre, 4 cylinder car. (car had no chassis number). He first raced it at Rob Roy in June, it was soon supercharged running 12 pounds boost, he didn’t race it for long before offering it for sale. He raced it at Corio in late 1949 before entering the AGP at Nuriootpa. 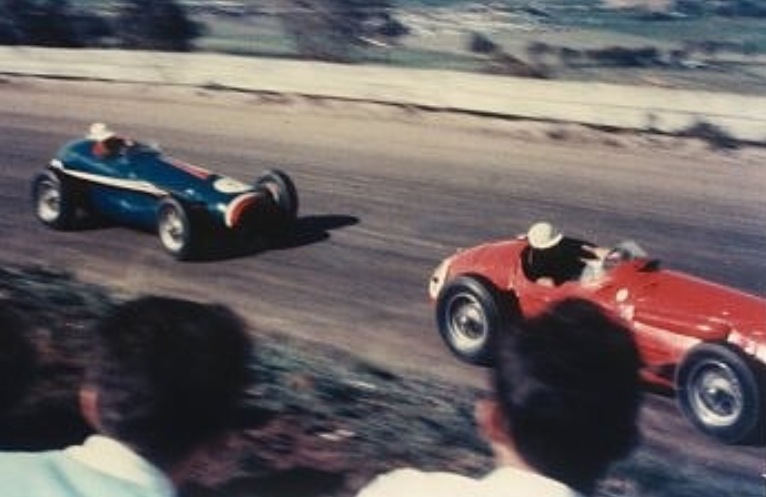 In one of the preliminary races for under 1500cc cars Jones had a furious dice with fellow Melbourne motor trader/racer and later champion Bill Patterson. Bill MGTC Spl mounted, both cars retired with overheating maladies. Jones car didn’t take the AGP start and Patto retired with head gasket failure. Not a successful trip to the Barossa for either of them. 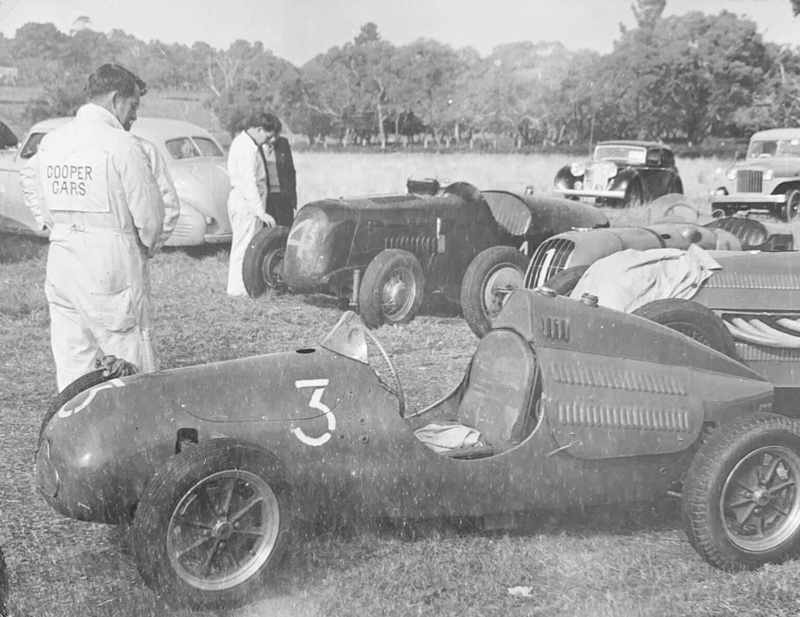 The car was sold later in 1950 to Alan Watson, was badly damaged by him but driven by Sil Massola in the 1952 AGP at Bathurst, and according to the ‘Blanden Bible’ was/is still in Australia. 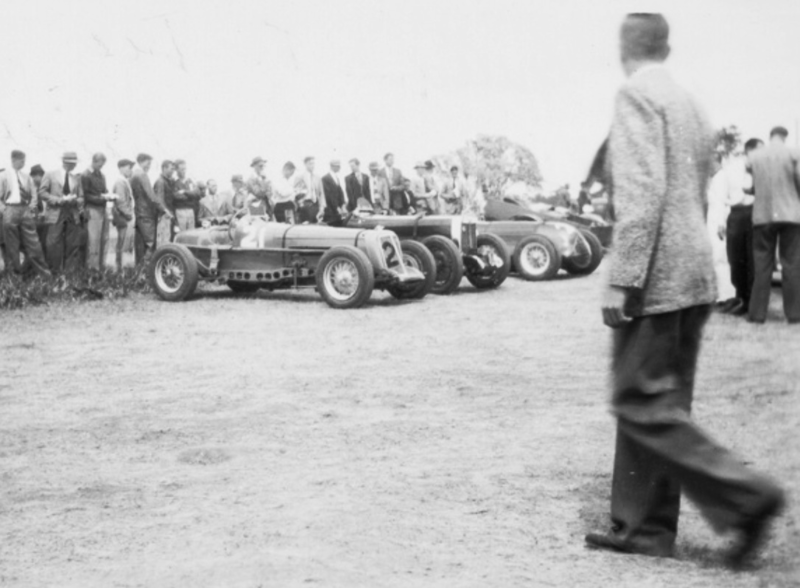 Blurry Maybach in the Nuri Paddock…the shot is a bit fuzzy but still included for the atmosphere it shows, Charlie Dean in the paddock, ‘Copper’ keeping an eye on proceedings, Fiat Topolino behind the Maybach. 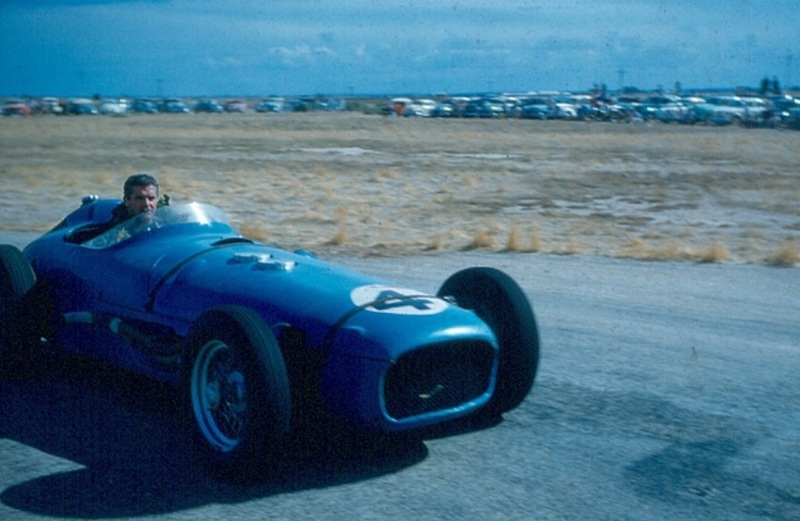 Regarded as one of the most specialised Ford side valve V8 specials built in Australia, Dennis Curran as an apprentice made many of the cars advanced features including its independent front suspension and modified Minerva braking system. 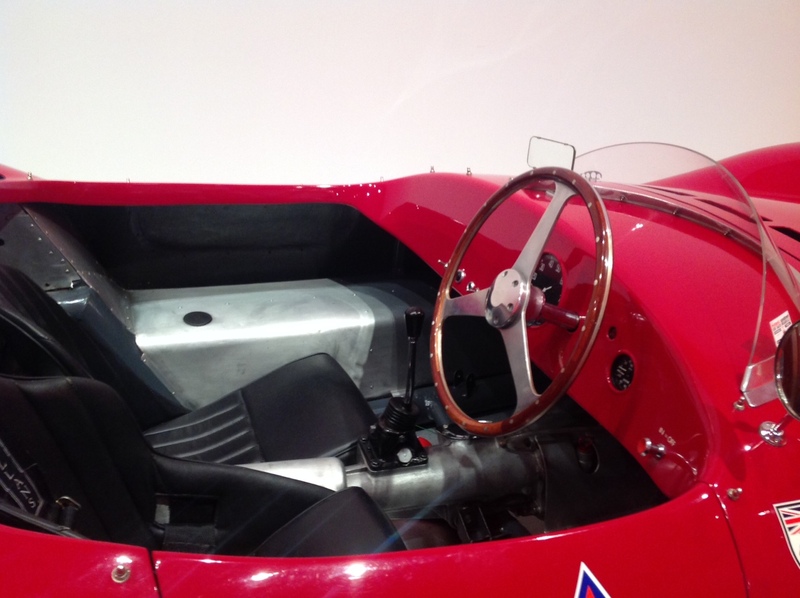 The attractive body appears to be in the style of the Alfa ‘Alfetta’ 158/159 GP cars of the period. 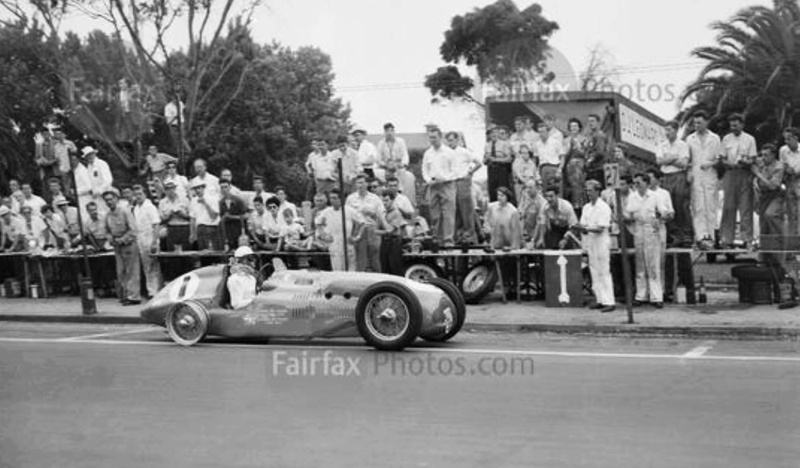 The car was raced by Curran at the 1951 Narrogin AGP in WA, then in Bill Wilcox hands in the 1953/4/5 AGP’s as the ‘FLS’. 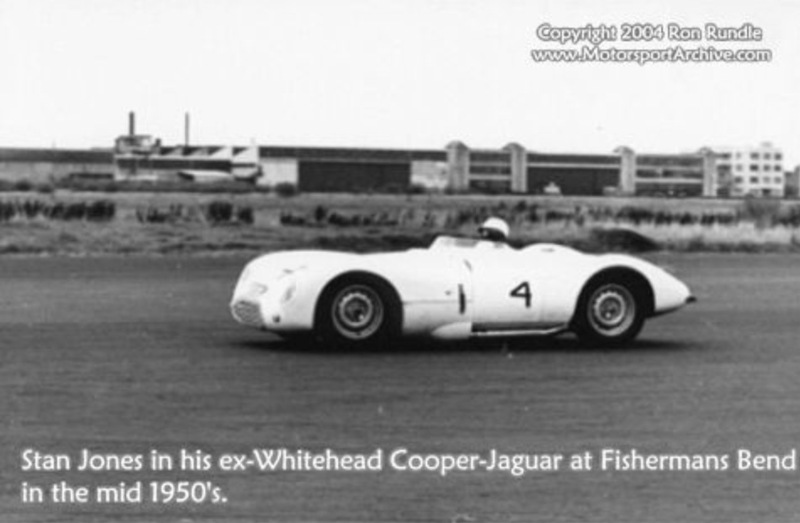 The car was then further modified by Frank Murphy on behalf of owner, Melbourne car dealer Harry McLaughlin by fitment of Lancia Lambda rear end, Jag XK120 gearbox and a new body. 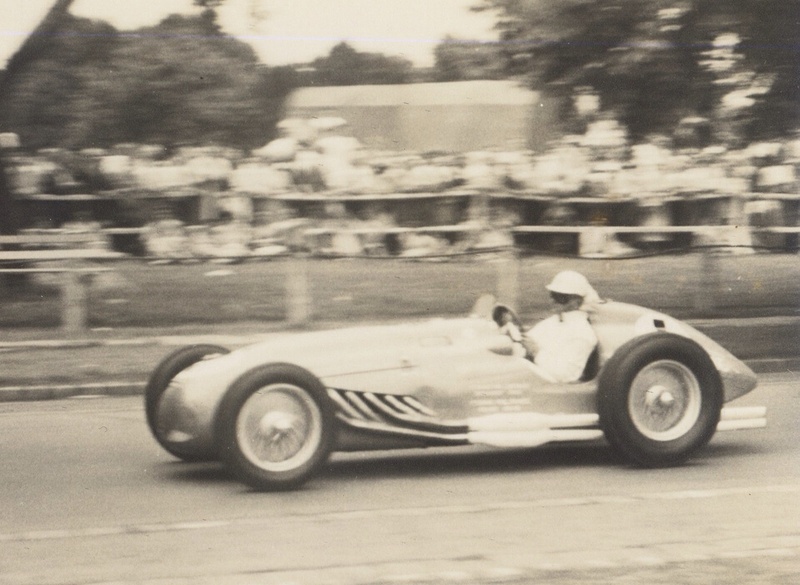 A 5 litre Ford V8 was fitted inclusive of Offenhauser heads and induction manifolds, it competed in this form at the 1956 ‘Olympic’ AGP won by Stirling Moss at Albert Park. 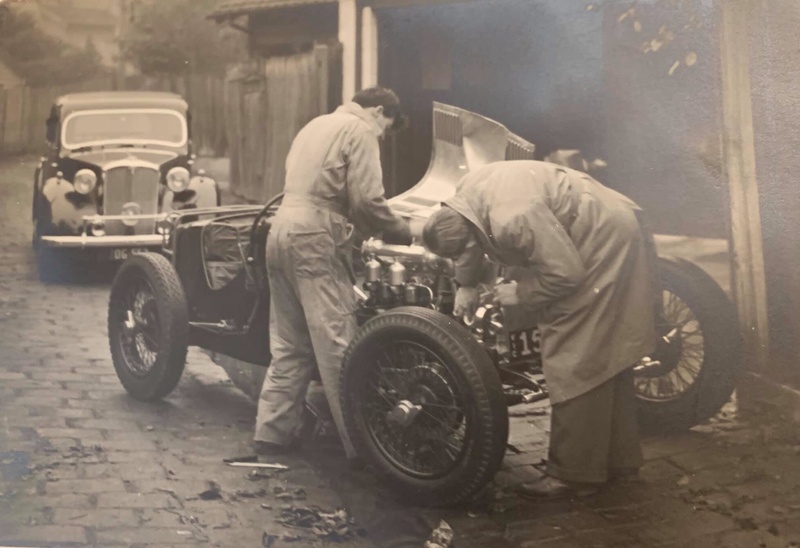 It was then known as the ‘Marchel’, the car disappeared , was found by Noel Tuckey in 1980, restored and is now known as the ‘CWM Ford V8 Spl’ an amalgamation of the surname initials of the contributors to the cars evolution; Curran, Wilcox, Murray. 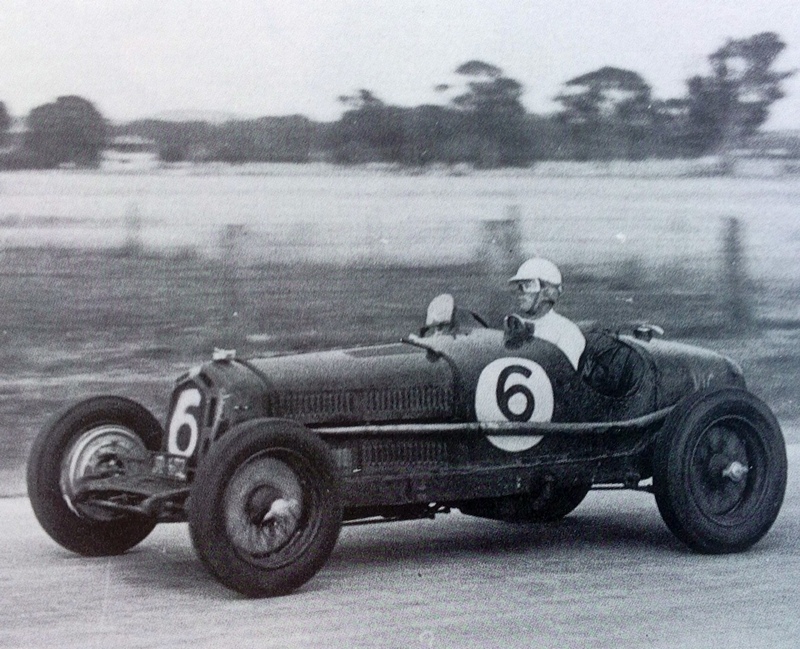 Jim Gullan replaced the Ballot Ford he had been racing in 1944 with a 2 litre Ballot bought nearby to his families garage in South Melbourne. 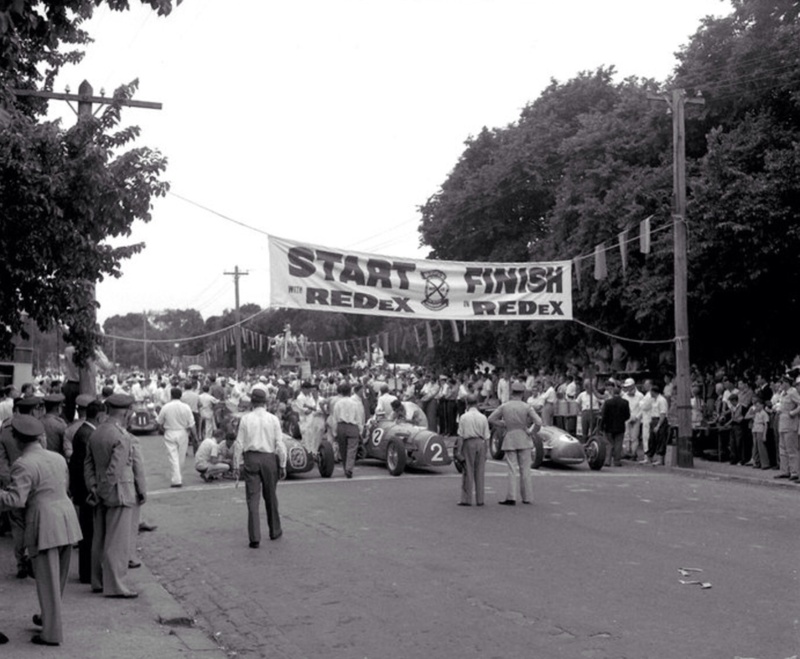 The Ballot engine was sold and replaced by an Olds 6 cylinder engine and ‘box. The chassis was shortened by 2 feet and narrowed by 6 inches, the chassis also lightened, you can see the holes made in its longerons to do so. 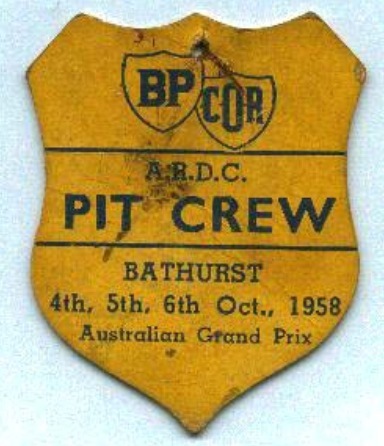 A body was made by Bob Baker in Melbourne, he built many racing bodies at the time, this Ballot credited as the first. 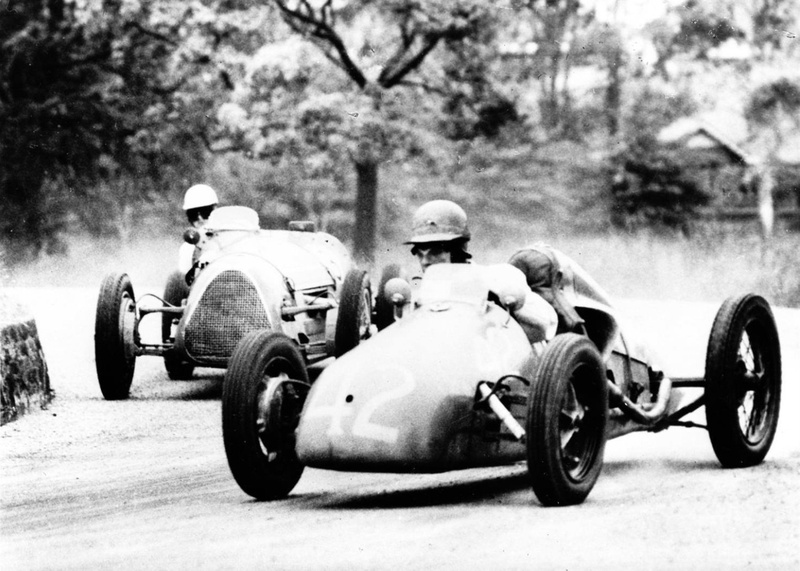 The sports 2 seater was registered and commenced racing in 1946. 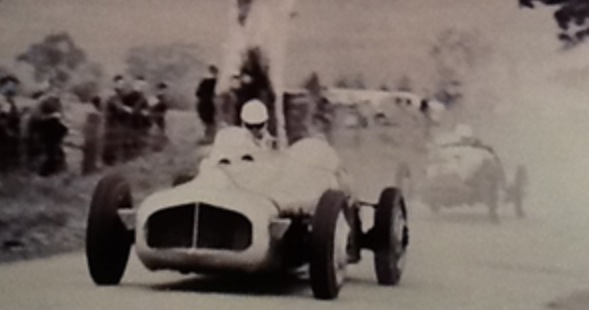 It won the 1950 AGP handicap class as above. 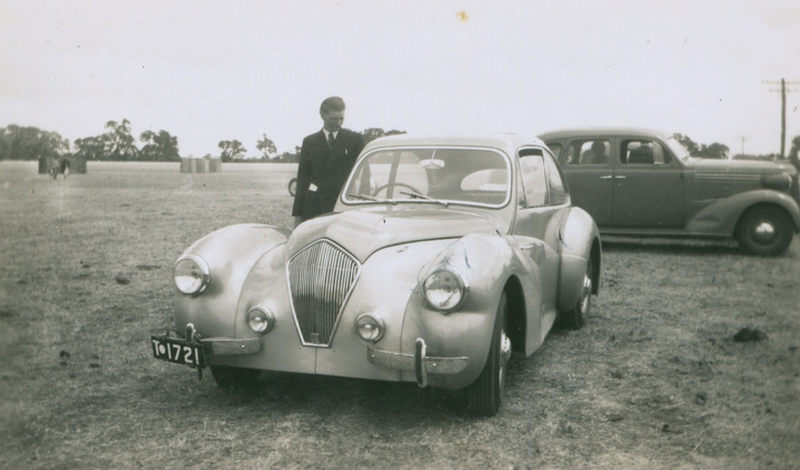 Noted journalist and historian Ray Bell wrote about this car on ‘The Nostalgia Forum’ here is his detailed account of the construction and development of the car. 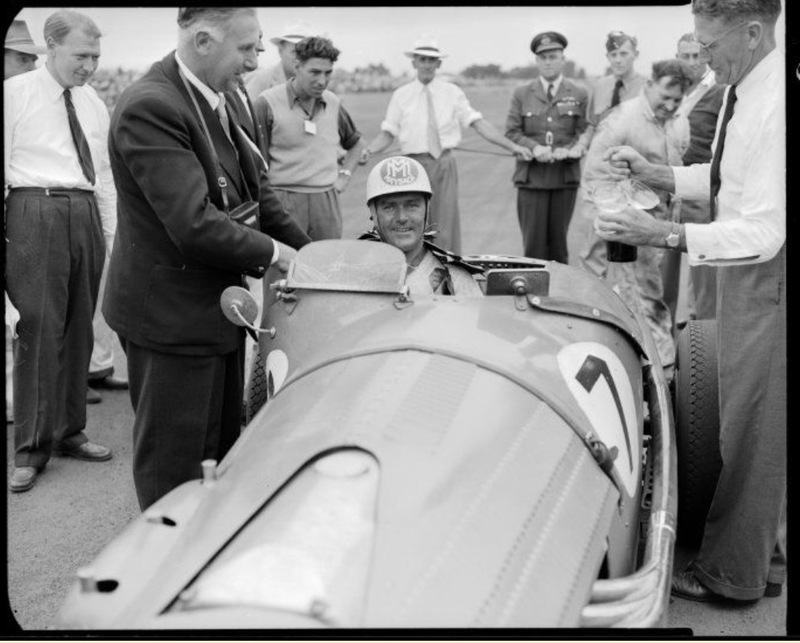 ‘The car was bought in 1944, almost on a whim, it seems, after Gullan had sold the Indianapolis Ballot (by now fitted with Ford V8) early in the war. 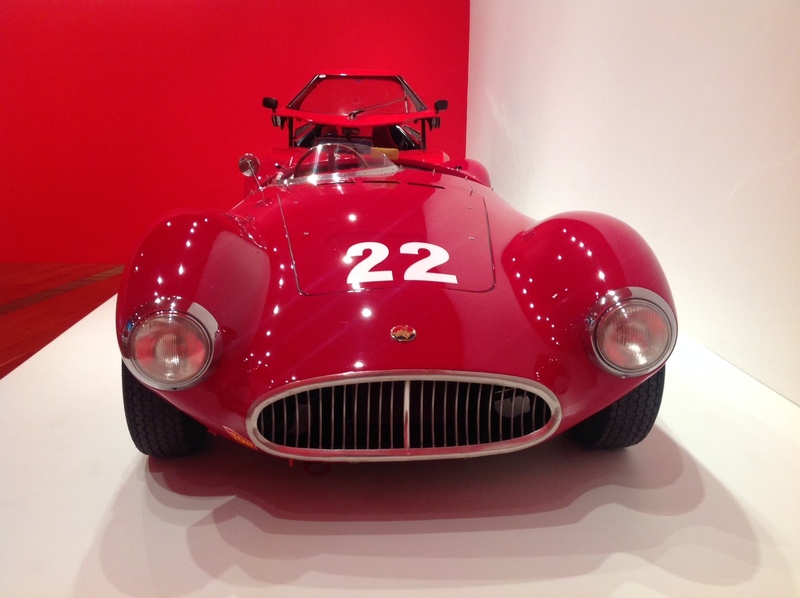 A 2-litre model with sohc engine and knock-on wire wheels (more important, according to Gullan), it had a poor body. He mentions 4-wheel brakes with Dewandre servo, making it a 1926/28 model 2LT. 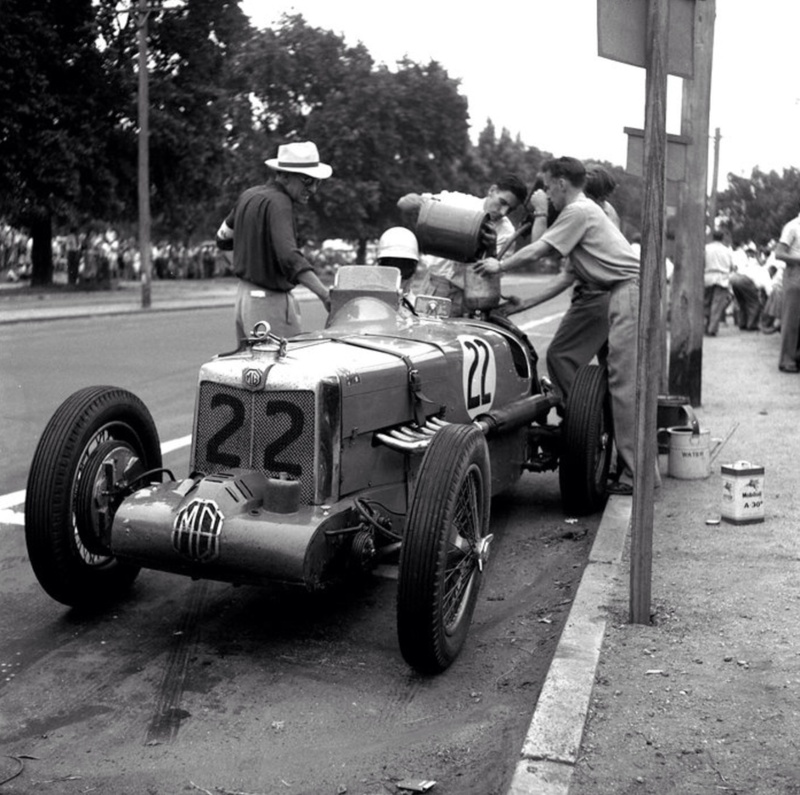 Soon after buying it a workmate offered money for the engine, gearbox and radiator to fit into a Bugatti chassis. 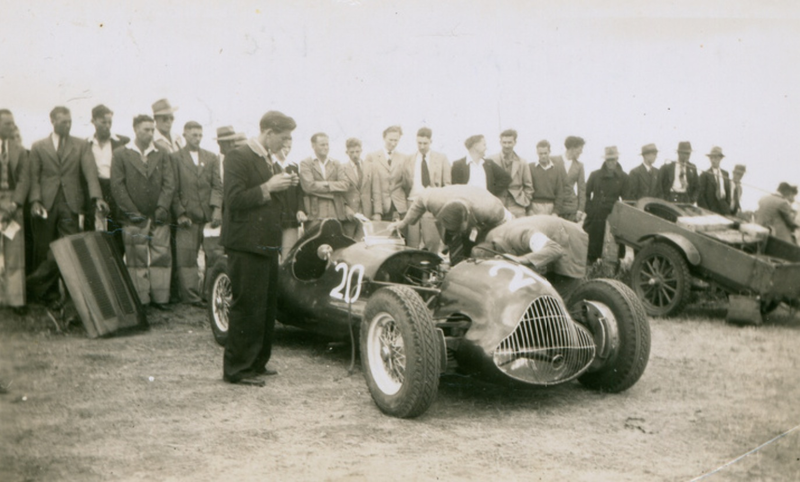 Said Gullan: “I suppose any engine was better than none..’ Having just the chassis left, he thought he’d build a copy of his favourite car, the ERA. He was reluctant to go for another Ford, having had bad experiences with the V8, so an ad for an Oldsmobile engine and box (unused spares purchased for a Taxi) overcame his problems. It was to have triple Ford carbies and extractors. 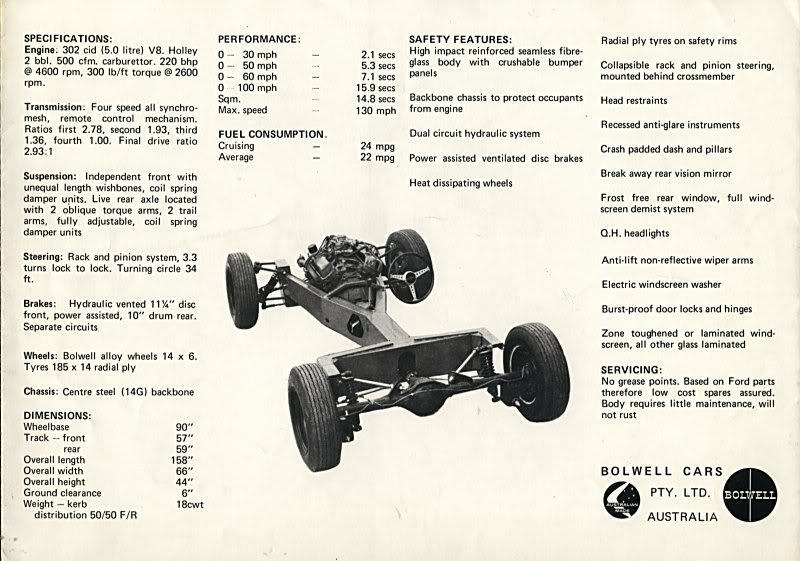 ‘Bob Baker built the body round an angle iron frame, which was screwed to the chassis with small reject aircraft bolts. 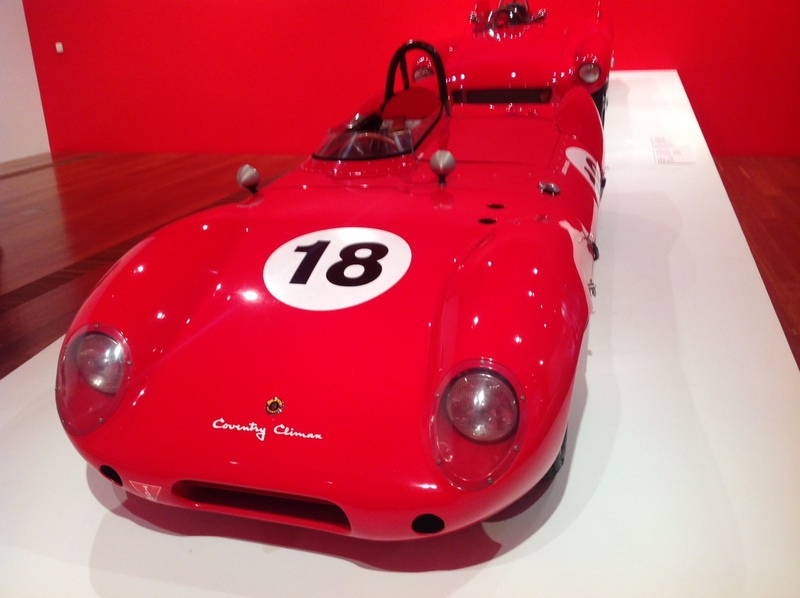 A deliberate effort was made to reduce frontal area, hence the car’s low appearance. Quick-fill petrol and radiator caps were fabricated and instruments (like the carbies) came from army disposals’. 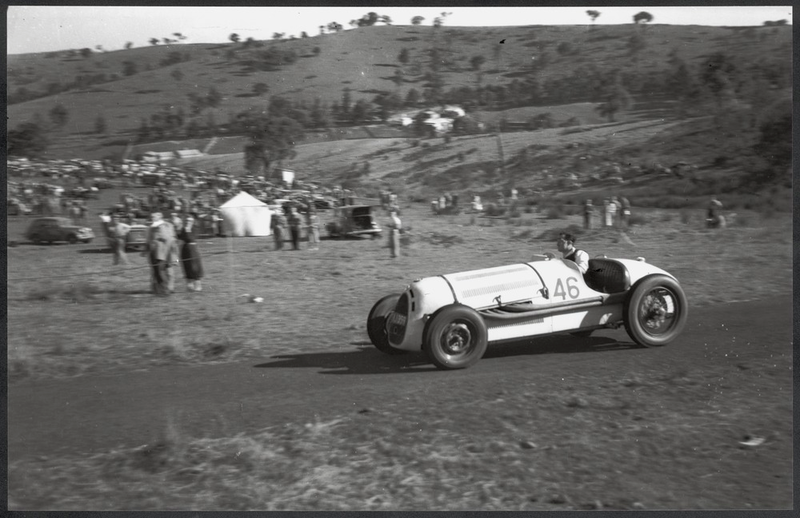 ‘Gullan was in business with one of his major opponents on the track, Doug Whiteford, and when Doug imported an Edelbrock cam and heads (he’d melted a pair of alloy heads at Lobethal in 1940!) 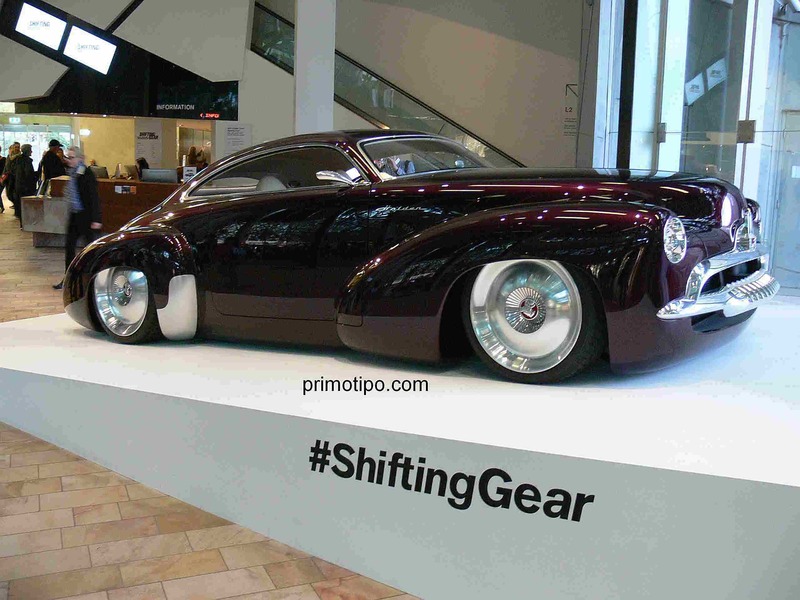 Bruce Rehn copied the cam profile and lift for the Olds. 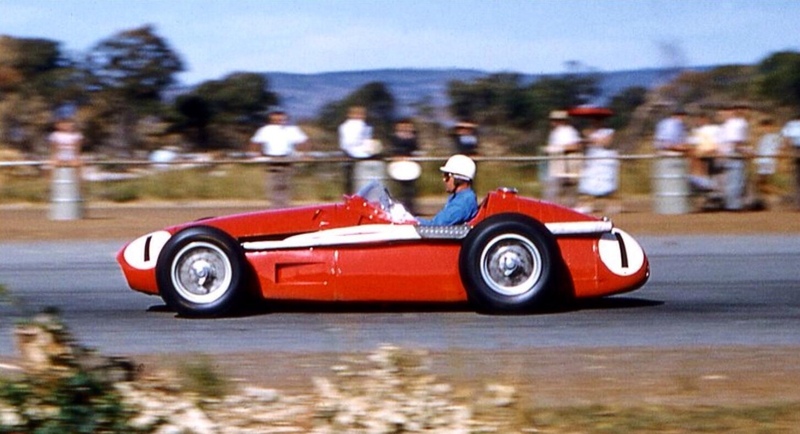 By the time of the Point Cook AGP (1948) there was yet another higher lift cam and special ratios in the gearbox. 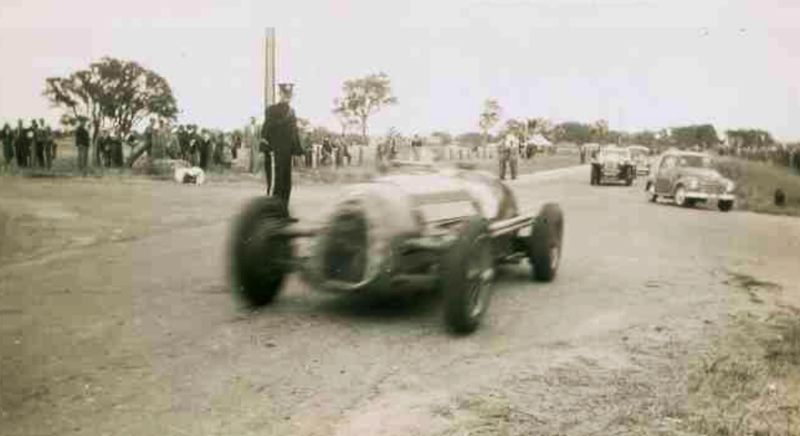 As a result of the heat at Point Cook, with the Olds running so cool and well, the engine was bored 3/16”, while both cars were fitted with enlarged sumps with cooling tubes fitted. 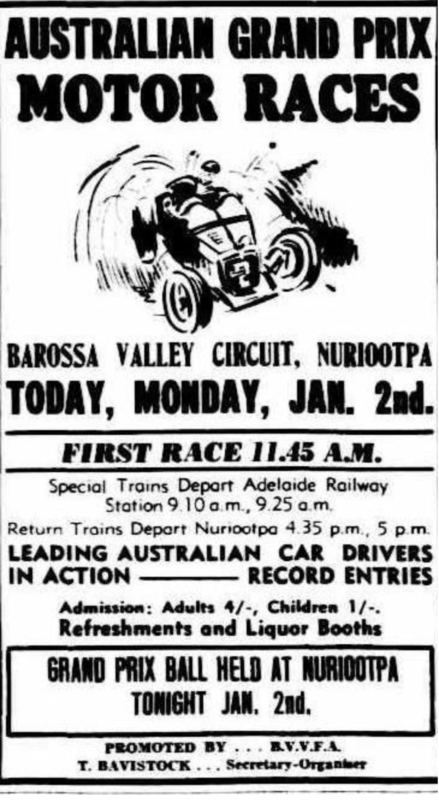 Then for Nuriootpa’s opening meeting in 1949 PBR made up special alloy brake shoes and backing plates. These were found to be bending the chassis, so some more work was required’. 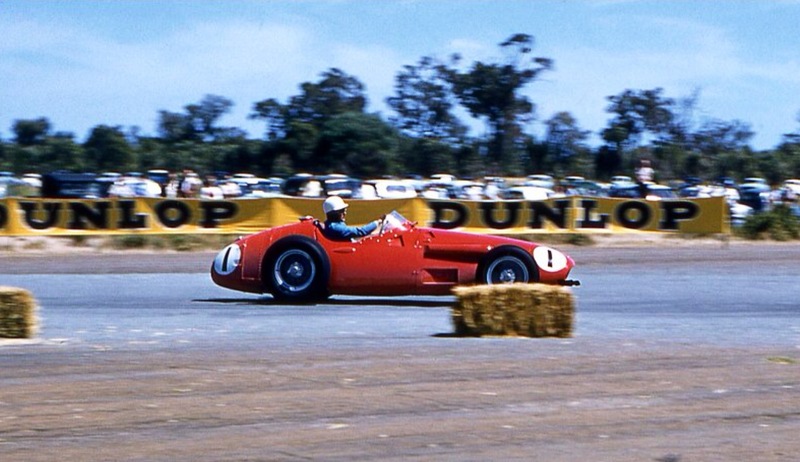 The car passed through many hands over the next 20 years, raced as late as 1963 at Calder, Victoria. It has been used since 1970 in historic events, is still alive today, i believe in Frank Moore’s Collection of Australian Specials in Queensland. The following truncated account of this car is by ‘theotherharv’ from ‘The Nostalgia Forum’. ‘In 1946 Eldred was purchasing ex-army vehicles left behind by the Americans and selling them in Adelaide. While visiting Papua-New Guinea , he acquired a war-surplus Dodge weapons carrier chassis along with a host of Jeeps and Blitz trucks at an auction in Port Moresby. 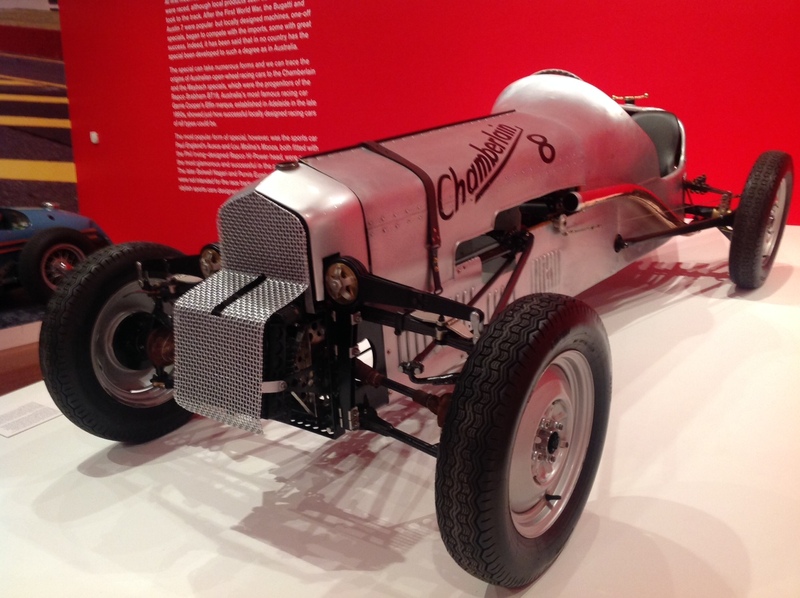 Eldred used the Dodge to construct a race car – the ‘Double Bunger’, or more commonly ‘Double V8’. 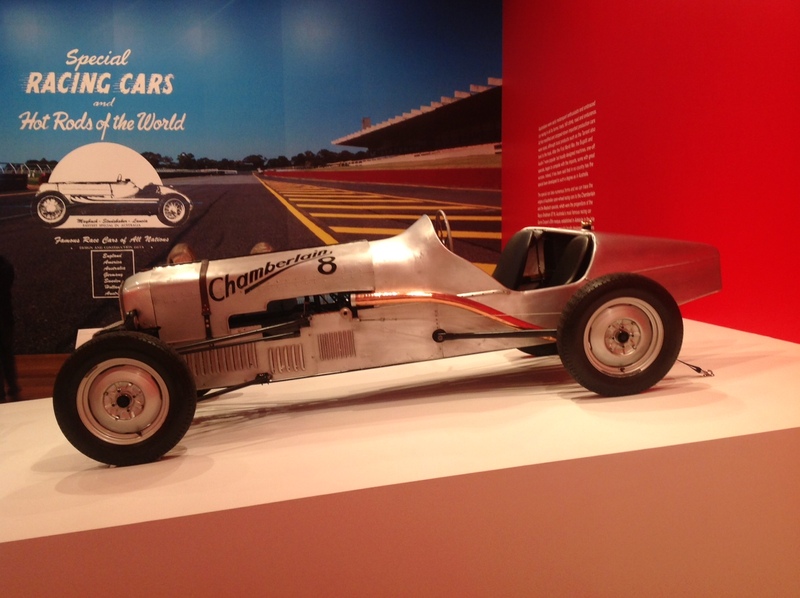 The Double V8 was built from bodywork from aircraft and a tubular steel chassis. 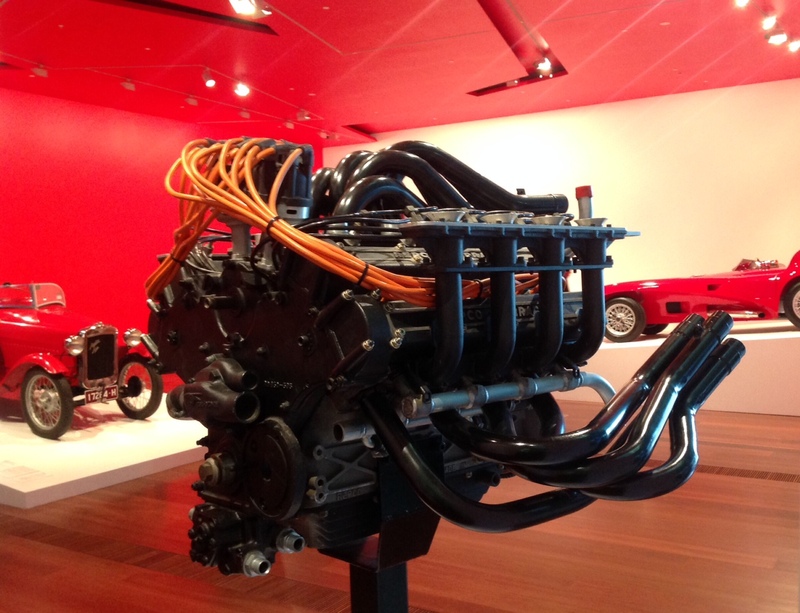 Power came from two Ford Mercury 239ci flathead V8 engines for a total capacity of 7,800cc. These engines were good for 100-110bhp each when run independently, giving Eldred some 200bhp in the Double V8. 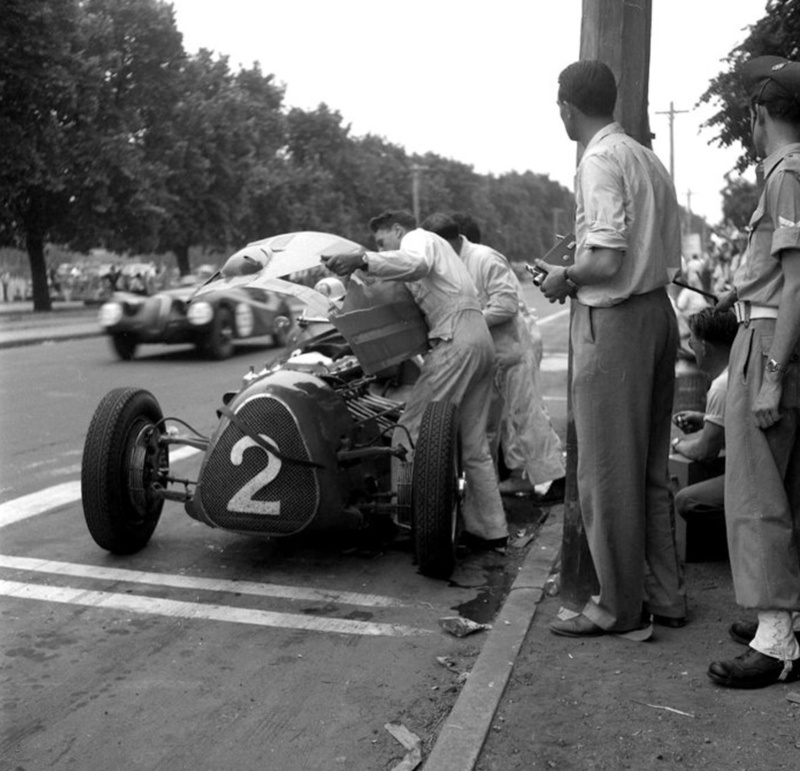 Engine cooling suffered, despite radiators both in front and behind the driver, with a tendency to overheat on long races. The engines were coupled flywheel-to-crank snout with a four-row chain drive. The engines were timed to fire as a V16, with a Scintilla magneto providing the spark. This large 2500 lbs machine had independent suspension and water-cooled drum brakes supplied by 4 US made Toronto fuel pumps. The drum brakes produced spectacular clouds of steam as he applied them, despite being undersized for the task. 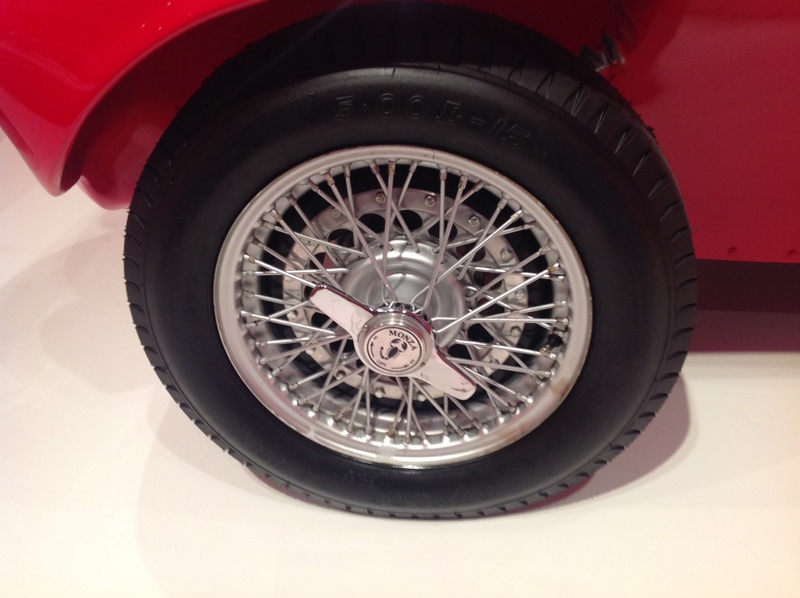 The rear brake drums were built inboard, operating on the back axle and additionally cooled by a fan worked by the tail shaft. 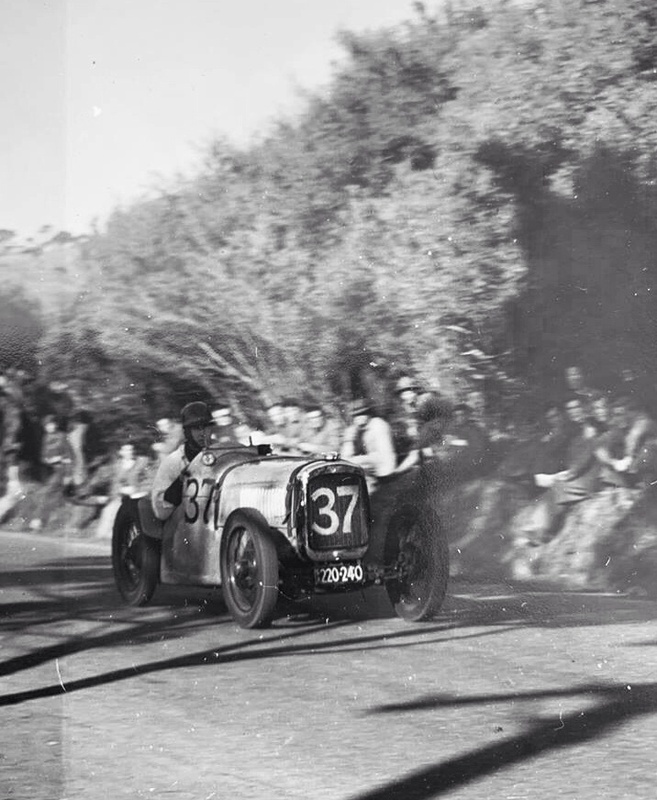 Road-registered, Eldred was frequently seen driving the Double V8 around the Adelaide hills, with trade number plates tied with string or a strap around his neck. 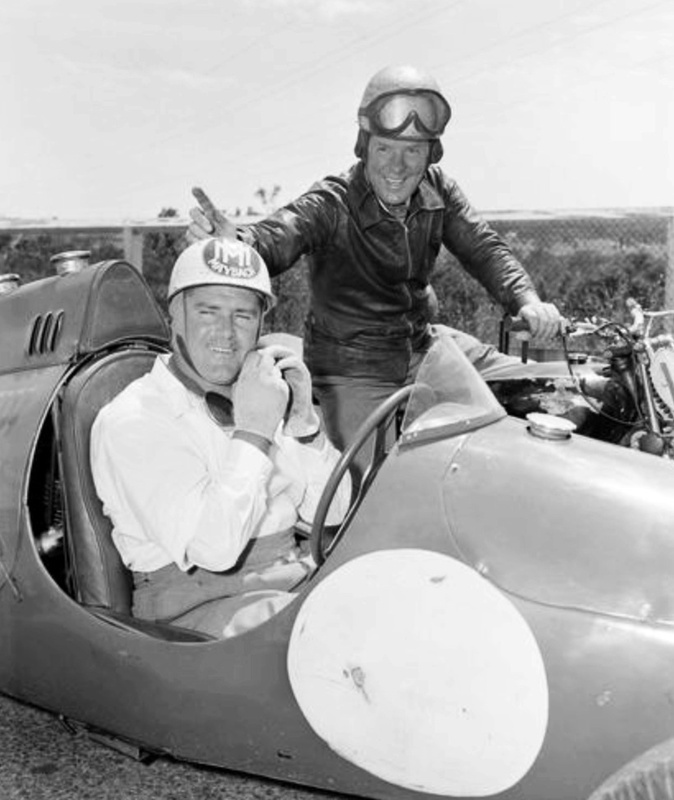 Between 1948 and 1951 he drove the car successfully in hill-climbs and various race tracks in three States. 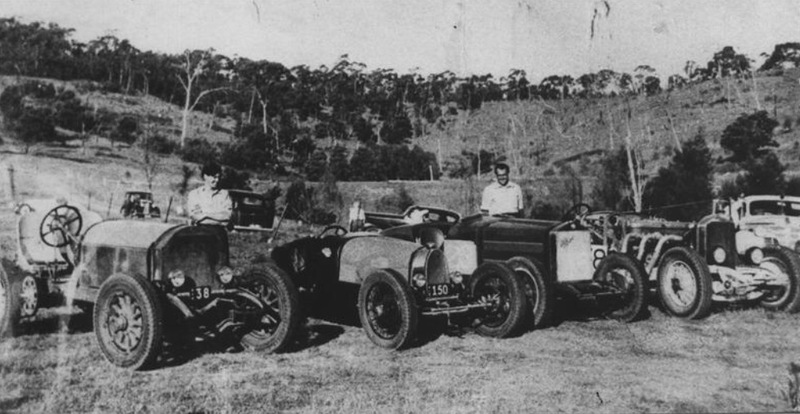 The vehicle was also driven long distances to compete at tracks such as Fisherman’s Bend, Victoria, a 900-mile round trip journey sans mufflers. 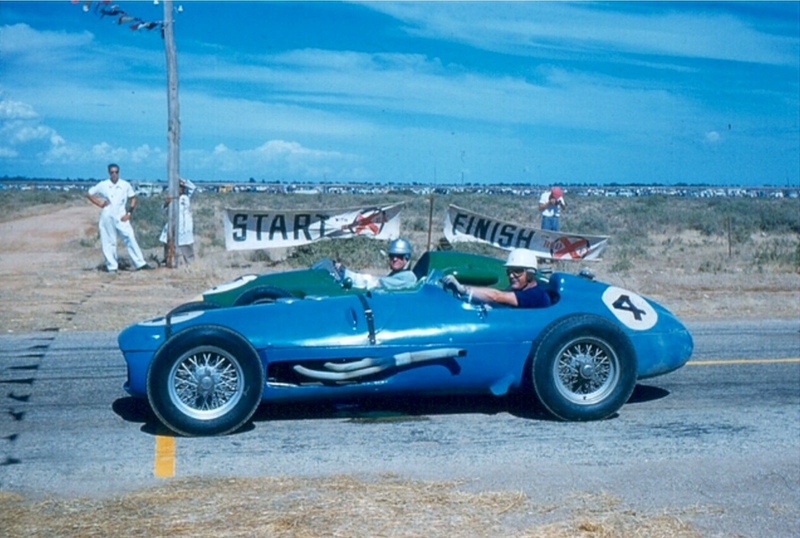 In addition to circuit racing, Eldred also raced the it at Sellick’s Beach, South Australia where racing was undertaken between mile posts. 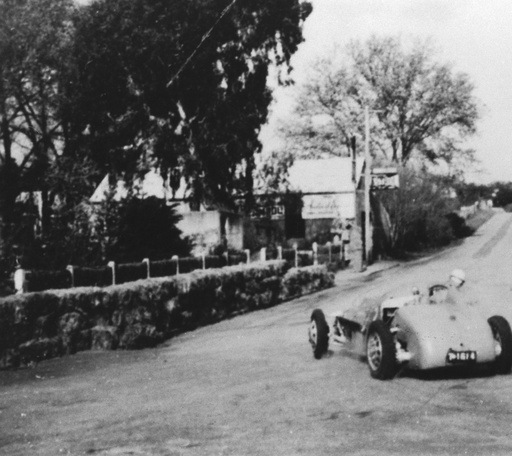 An annual speed trial and motorcycle races were held on three kilometres or more of sand along Aldinga and Sellick’s Beaches up to 1953. 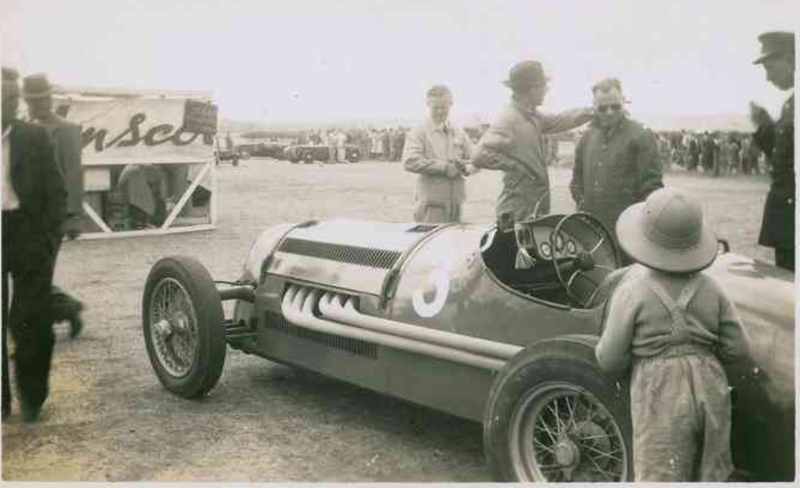 The Double V8 won both the unlimited scratch race and over 1500cc handicap race held at the beach by the Racing Drivers Association of South Australia in April 1950. This event drew more than 5,000 spectators. 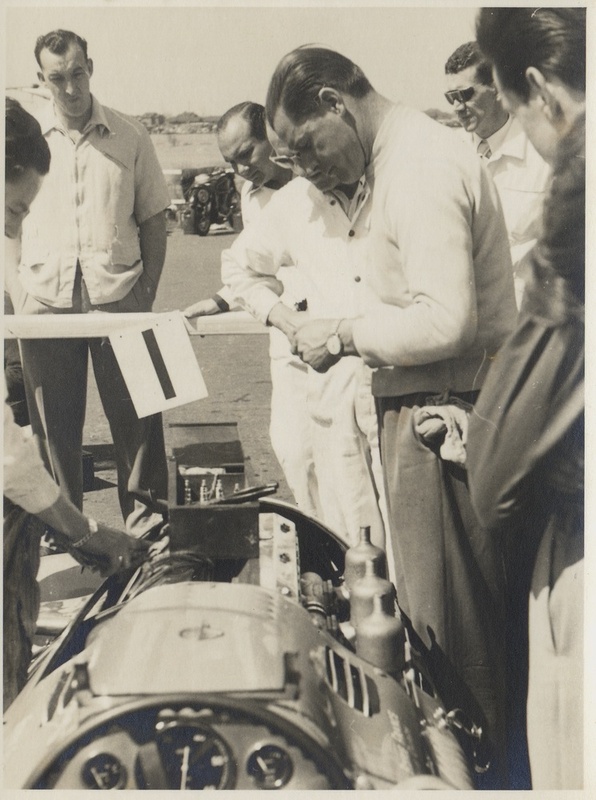 One incident with Harry Neale at the wheel of the Double V8 ended with the Double V8 deposited into the sea, ripping off the bodywork and leaving Harry sitting on the chassis, wet but unhurt. 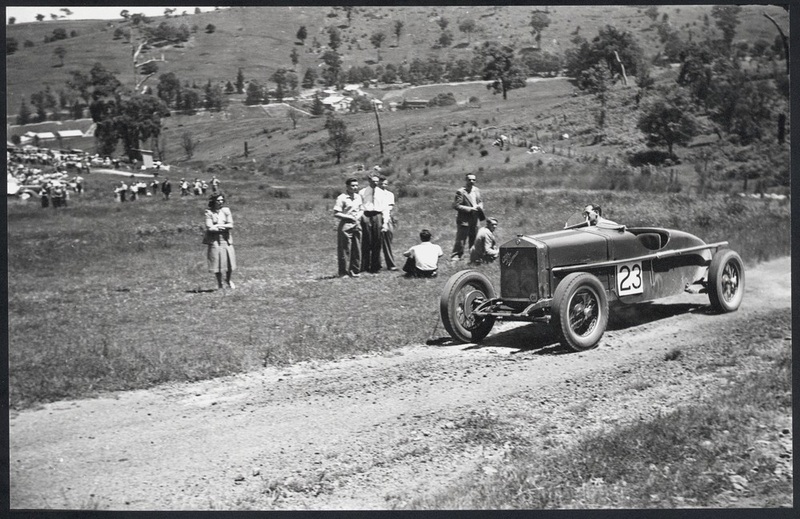 Eldred’s can do, larrikin spirit was also evident in the way he once retrieved the telephone cables laid out for communication between officials at each end of the Sellick’s Beach strip… by fitting a bare rim to the Double V8 rear axle and firing up the twin V8s to power what must have been Australia’s most powerful fishing reel. 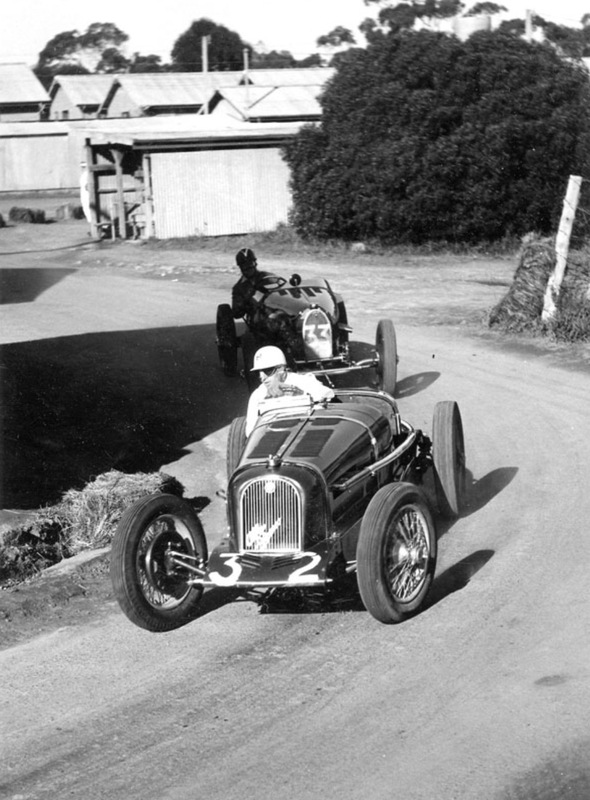 The Double V8 marked the start of Eldred’s entries into the Australian Grand Prix. 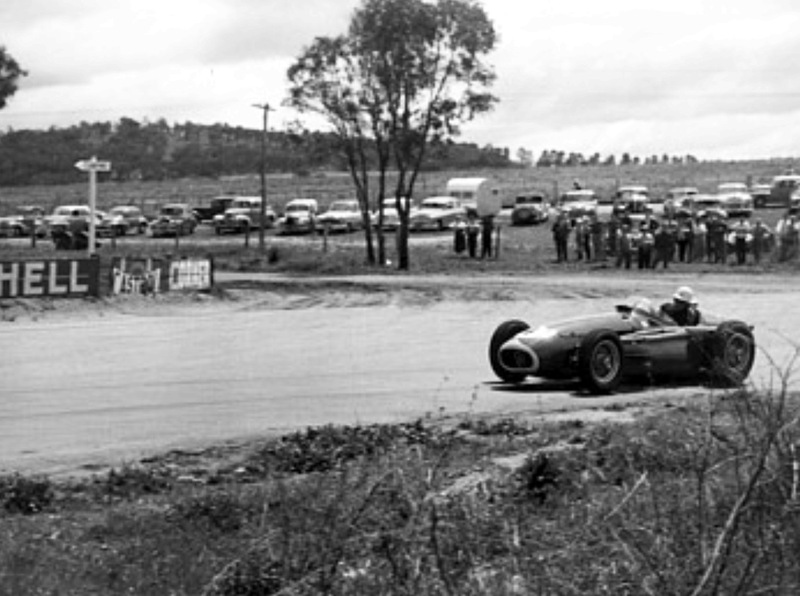 The January 1950 Nuiootpa Australian Grand Prix, Eldred’s Double V8 retired after only two laps. 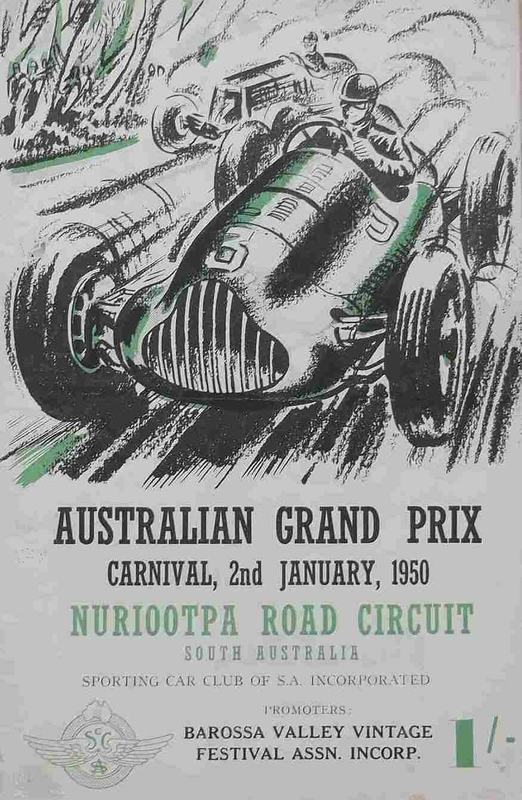 The 1951 Australian Grand Prix was again run as a Formula Libre event in March at a 4.4 mile ‘around the houses’ road circuit at Narrogin, Western Australia. Eldred entered the Double V8. While leading on lap 7 of 24 it again broke down (this time due to suspension failure), leading to Eldred’s retirement from the race. 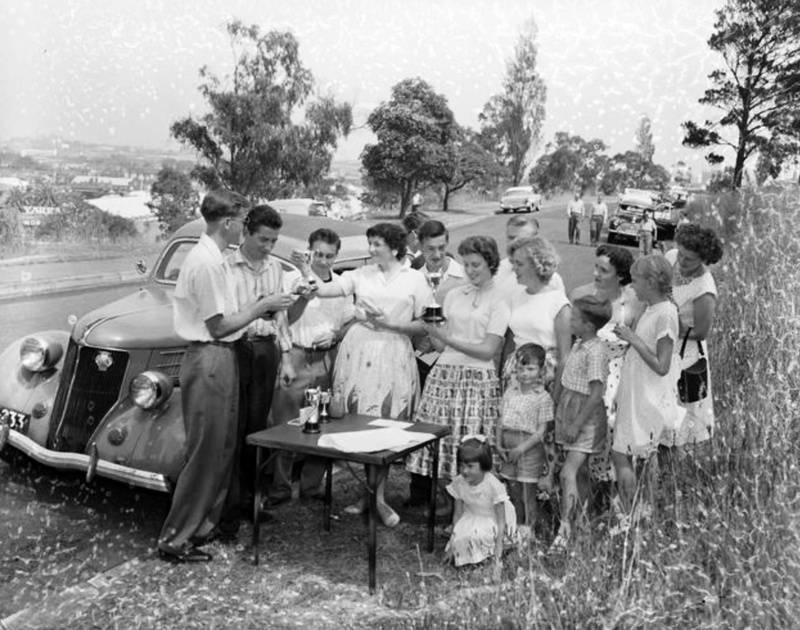 The car was sold in 1951 to Syd Anderson, proprietor of the Sydney Anderson Automotives used-car dealership in William Street Western Australia. 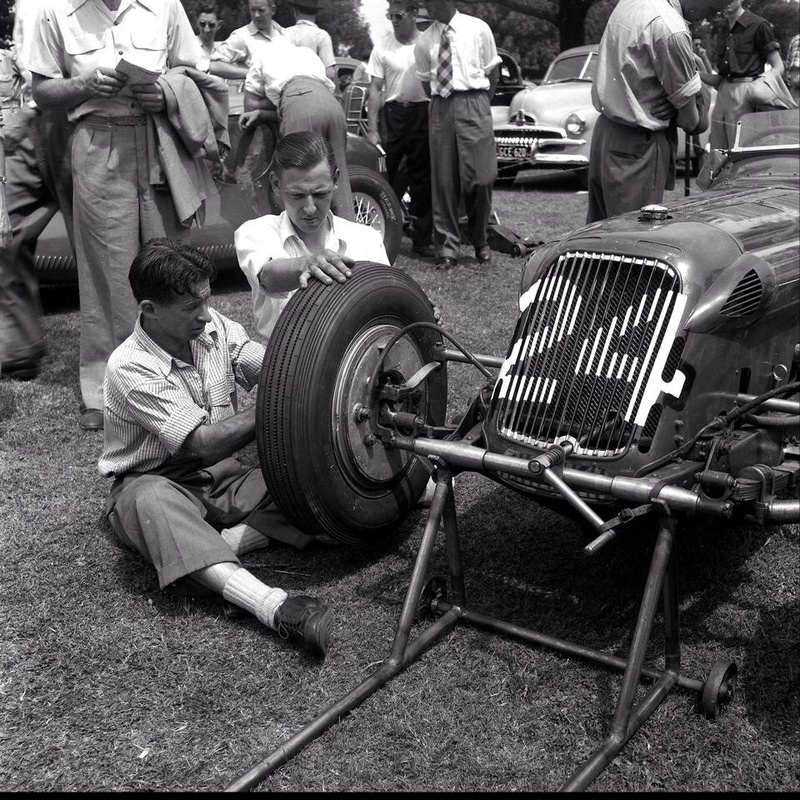 During both Anderson’s and subsequent ownerships the car was modified repeatedly. 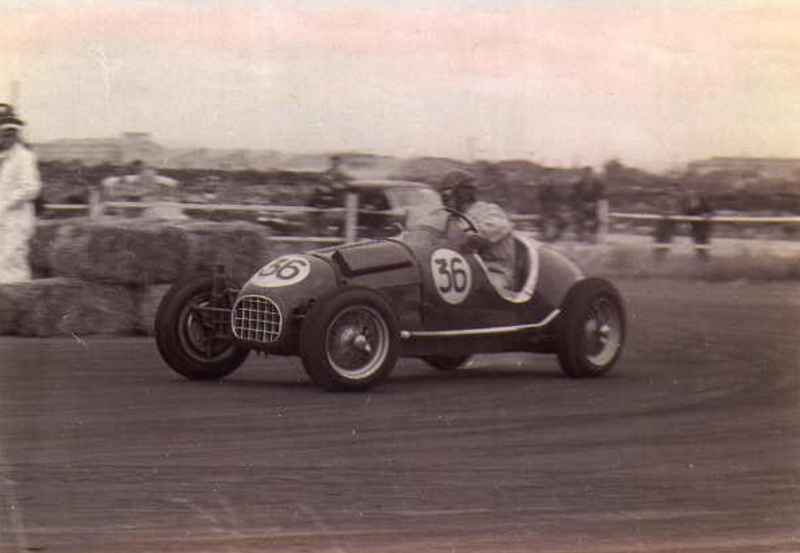 Anderson raced the Double V8 extensively, including the following West Australian meetings; The Great Southern Flying 50 meeting at Narrogin in March of 1952, winning the scratch race for over 1500cc.The Northam Flying 50 meeting at Northam in April, winning the three-lap scratch race for over 1500cc. 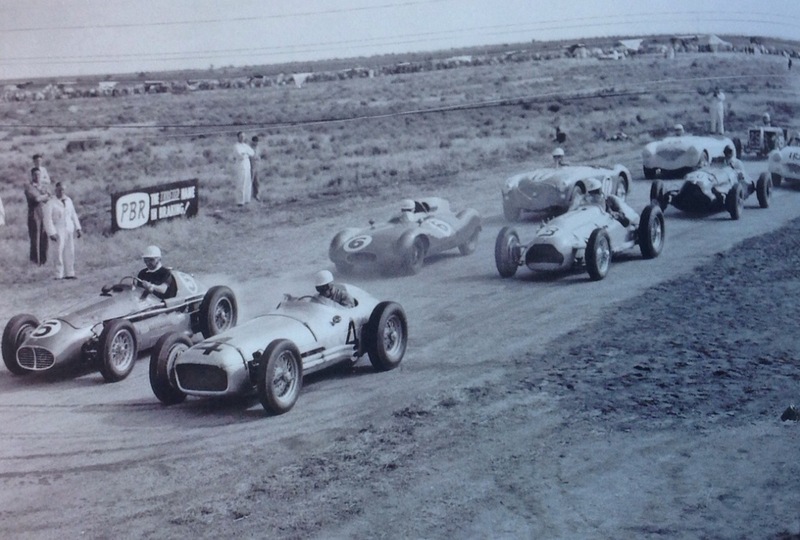 The Goomalling Speed Classic at Goomalling road circuit in June. 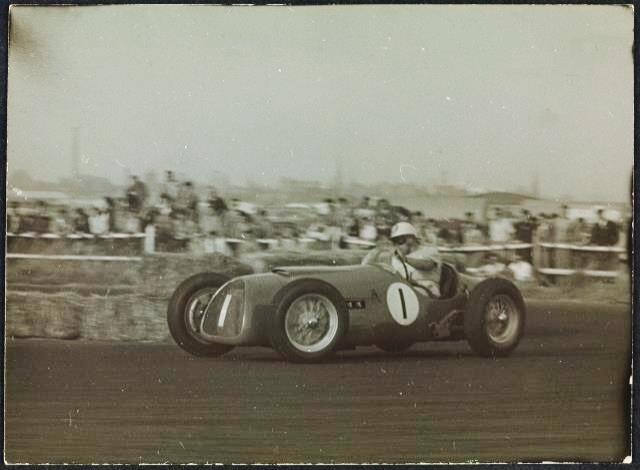 He was 4th in the 15 lap handicap for Racing Cars, 1st in the 3 lap scratch race for Racing Cars over 1500cc and 1st in the 5 lap handicap race for Racing Cars. 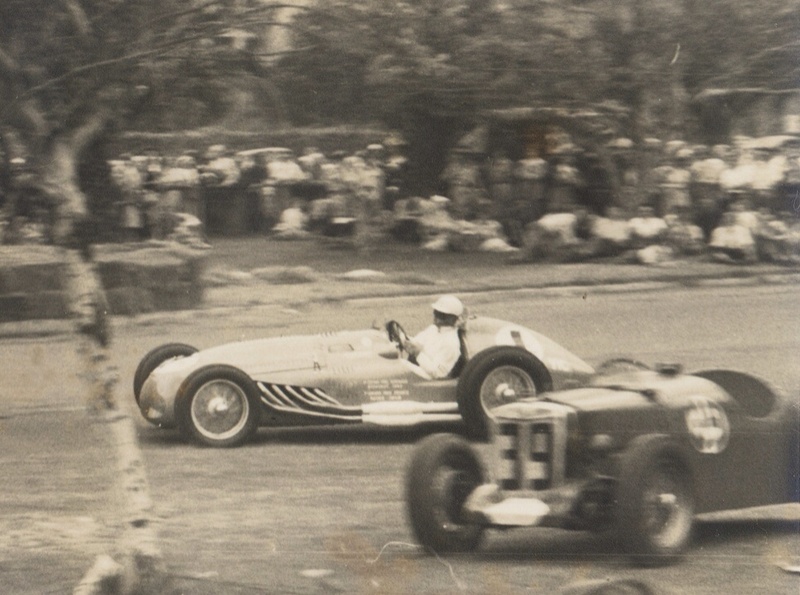 Anderson entered the Double V8 in the 1953 Johore Grand Prix in Malaya. He retired from the race due to overheating. 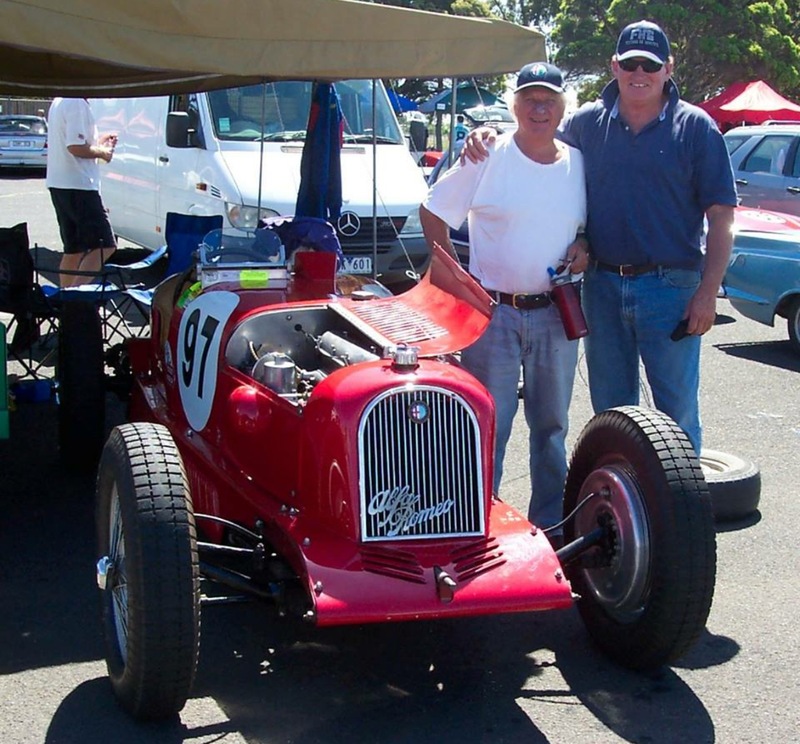 The Double V8 was then sold by Anderson to James Harwood, a navy veteran, musician and motor enthusiast in Perth. Harwood tossed a penny with Anderson to decide the purchase price – either £50 or £100. Harwood won. The vehicle was then towed to Harwood’s business premises where Bill Strickland removed the two Ford V8 engines, which were sold. 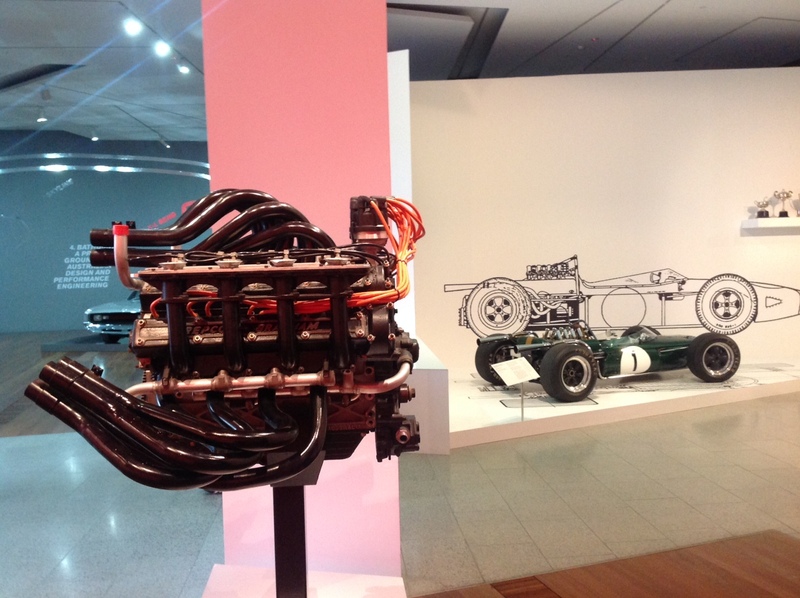 The Double V8 body was then placed outside James business as advertising, though was removed a few days later at the request of Perth City Council. 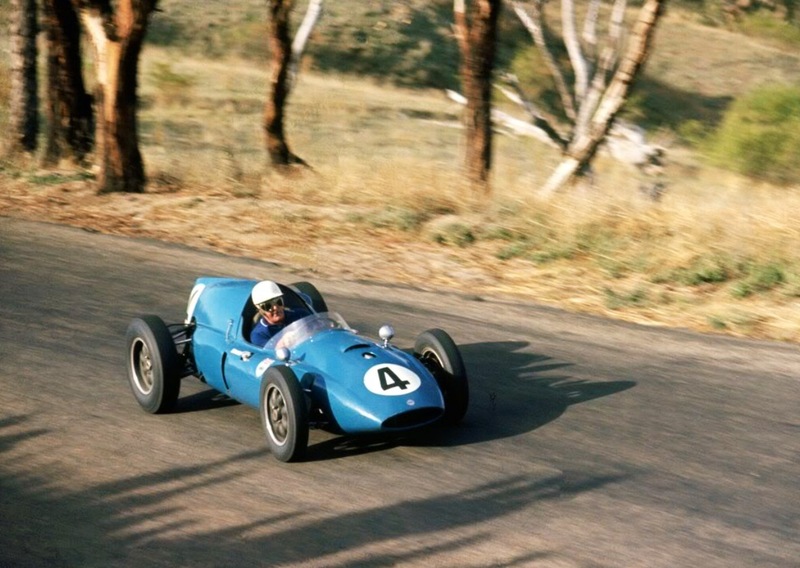 In the period of 1955-1957 Toby Carboni raced the car extensively in Western Australia. 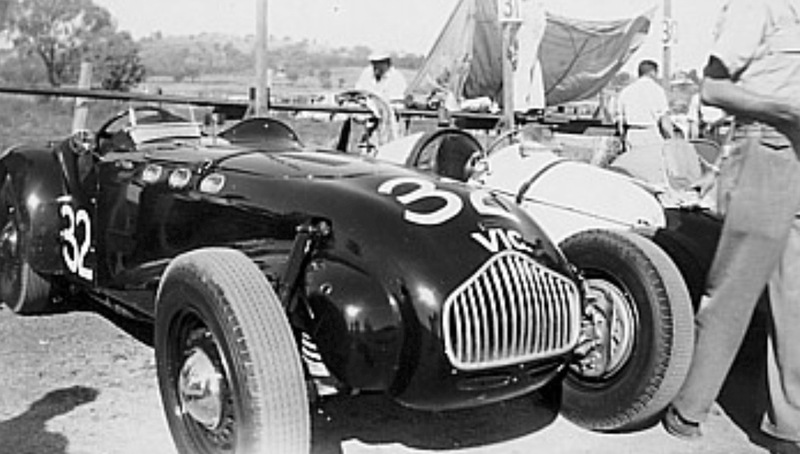 Keith Windsor bought the Double V8 body in 1957 and installed a V12 Lincoln Zephyr. 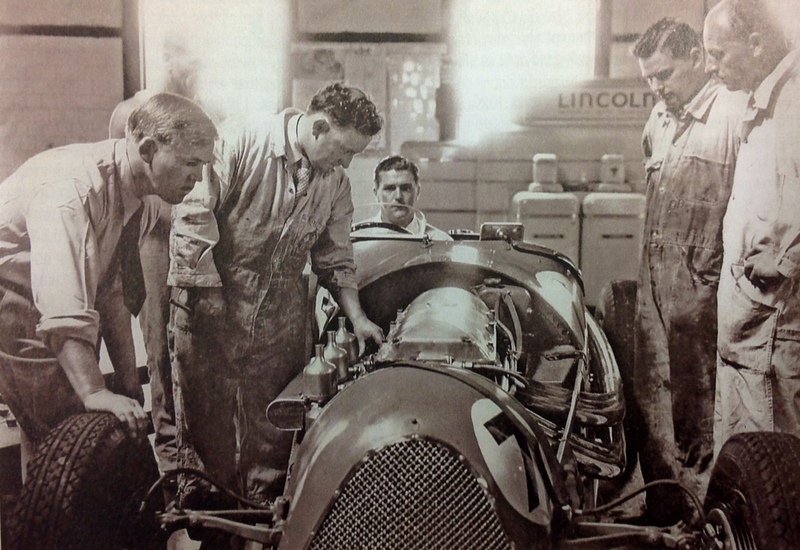 Lincoln produced these engines from 1936-1948, ceasing production nearly a decade before Windsor’s repowering of the Double V8. I’m not certain if Windsor used the 267ci, 292ci or 306ci engine (110-130bhp), though in any case was a marked reduction from Eldred’s 478ci (~200bhp) double V8 powerplant. 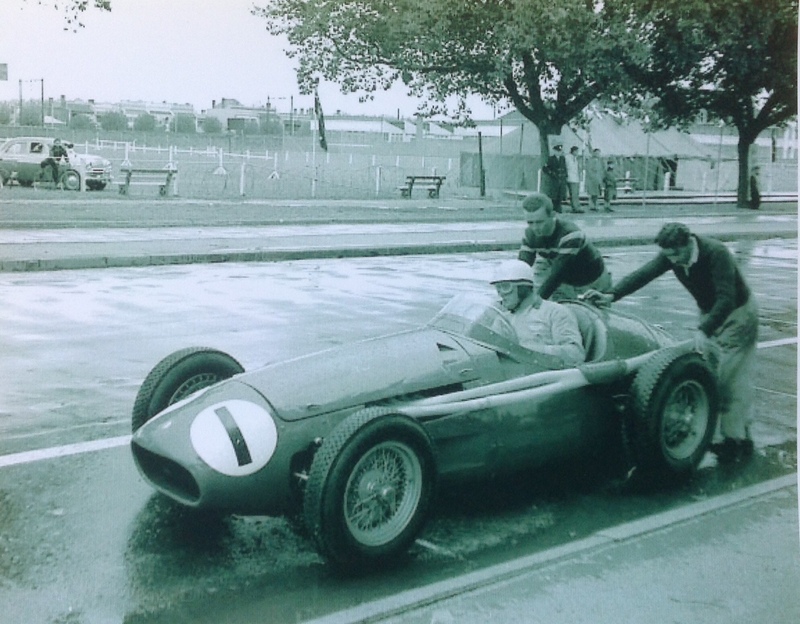 Windsor debuted the V12 Double V8 in the Christmas Cup at Caversham in late November 1958, competing in the five-lap racing car scratch race for over 1500cc, though did not place in the top three positions. Sadly, Windsor found the V12 vehicle was not manageable and subsequently scrapped it. Such a shame that this amazing car did not survive. 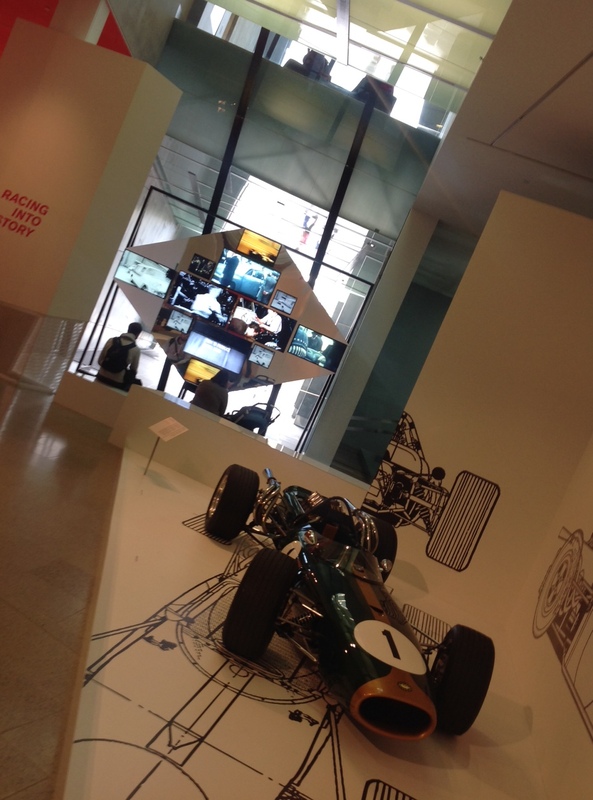 Another State Library of SA shot, its not clear from the caption if the car is competing or otherwise. Car behind is a Nash Ambassador. 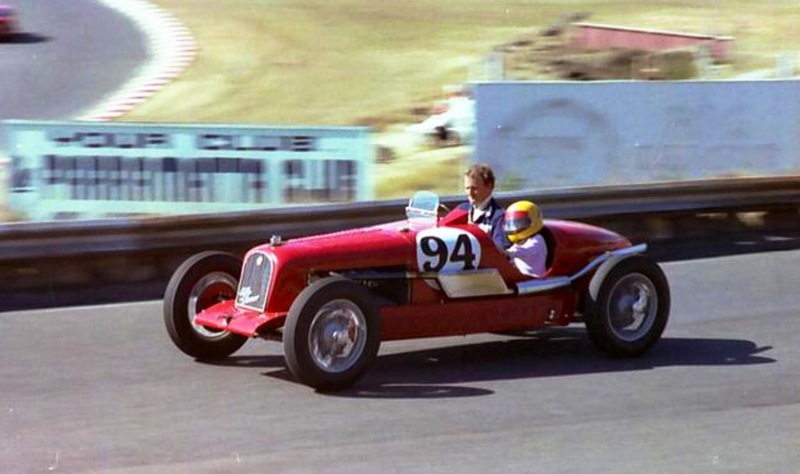 Donald Healey built 101 of these cars, Elliott refers to the body builders, Healey provided the ladder frame chassis to that firm to clothe, engine was a Riley 2.5 litre pushrod 4, the car for a time the fastest 4 seater in the world. Built from 1946 to 1950. Suspension trailing arms at the front and live axle at the rear, coil springs front and rear. ‘The Adelaide Advertiser’ 3 January 1950. 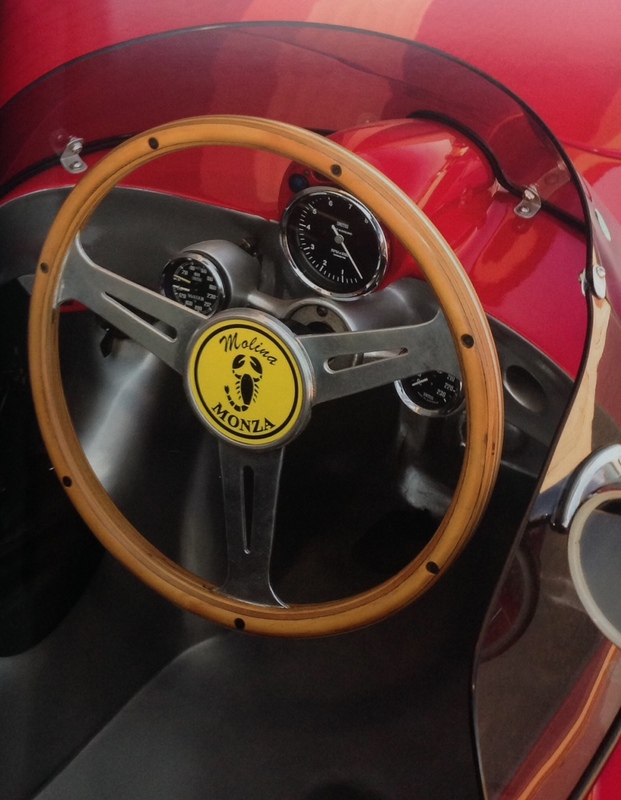 The Italians have had a long tradition of art worthy cars for many to aspire. 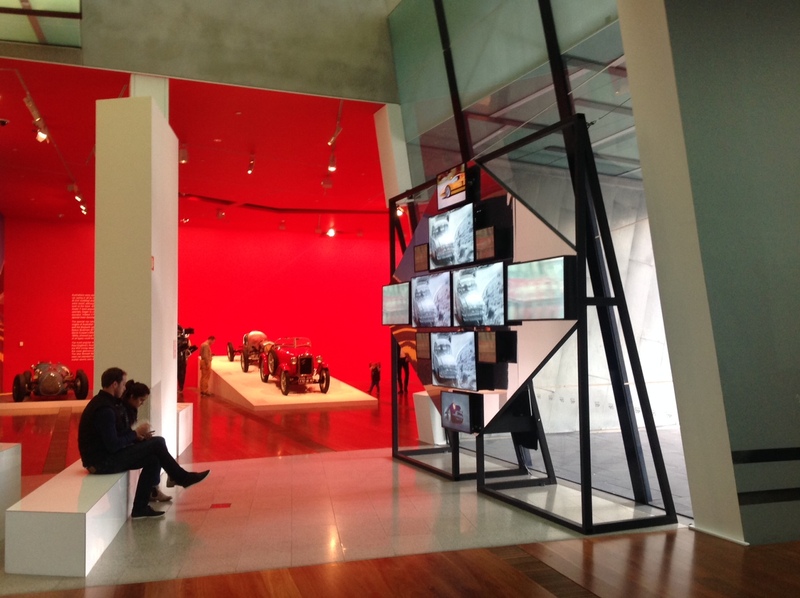 So what happens when the Art World decides to pay homage to a predominately Australian automotive heritage? 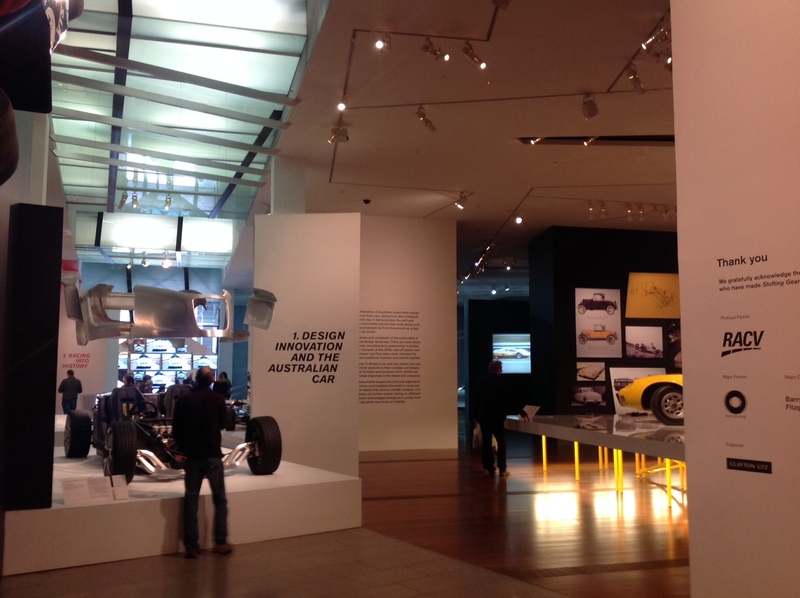 Well you get the National Gallery of Victoria’s ‘Shifting Gear – design, innovation and the Australian car’ exhibition. 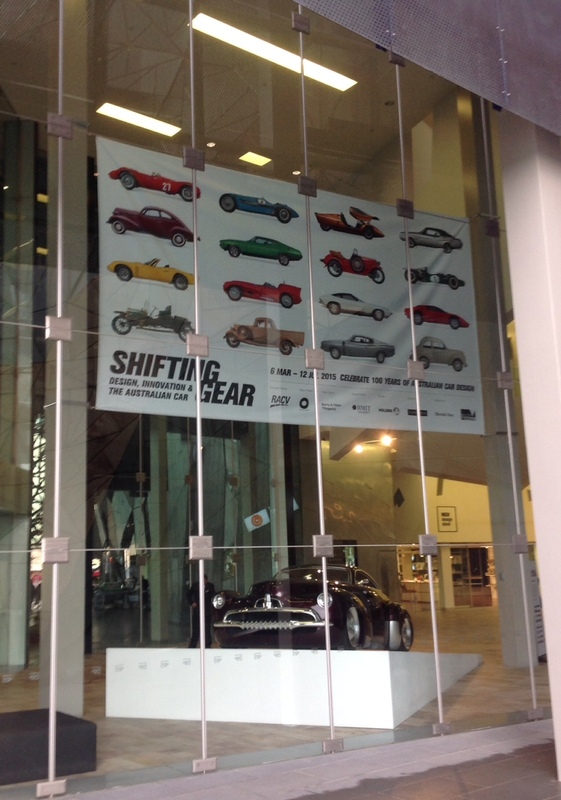 The NGV’s ‘Ian Potter Centre’ in high profile Federation Square, opposite Melbourne’s famous Flinders St Train Station has gone all out to show a variety of Aussie ‘coachbuilders’ art from the roads and the race tracks, ‘a celebration of Australian Automobile design represented by 23 cars dating from the late nineteenth century to the present day’. 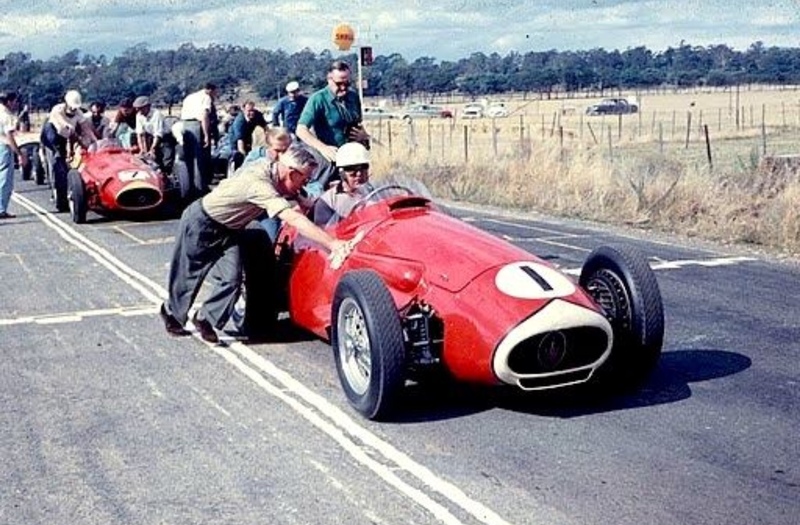 Despite there being a lot of red involved, not one has an Italian sounding car name and only one has bodywork with a close relationship to Maserati. Upon entering the precinct, Holden’s Efijy greets you. It’s long and oh so low stance ready for cruising along Carlton’s Lygon St.
Then an entry fee covers viewing the main exhibition halls with more than enough variety for all to come away with a favourite that wouldn’t look too out of place sitting in your garage or shed. It was a tad rushed when primotipo visited, so give yourself at least an hour to pass through and enjoy. 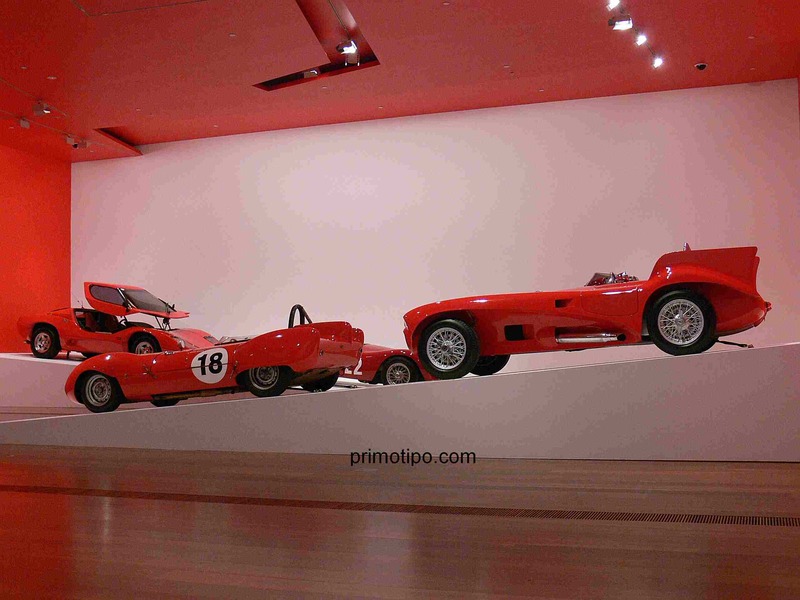 Several of the cars have long standing Australian Motor Racing Heritage, so it’s interesting to see how the Art World perceives them. Certainly different to the bitumen they usually frequent! And indeed, substantially different to seeing them at the likes of Phillip Island or Sandown. And remember not to get told off by security for using a camera flash! 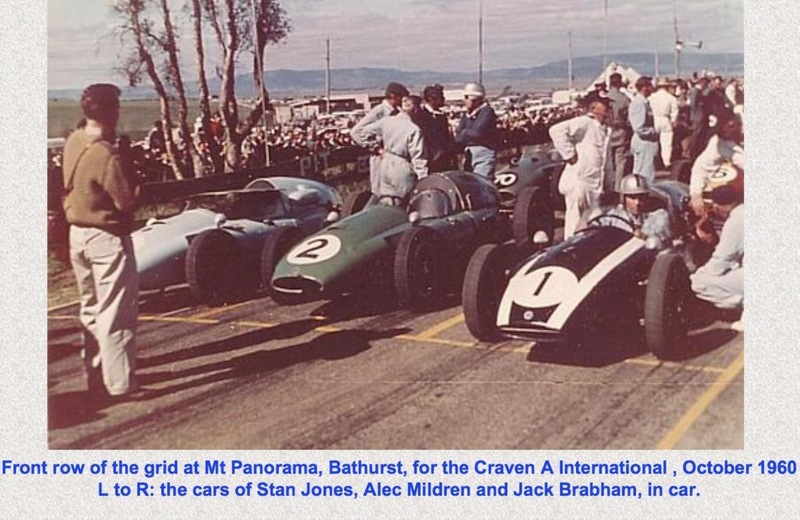 A Unique arrangement that allowed some smart, capable Aussies to take on the world, Brabham BT19 Repco. 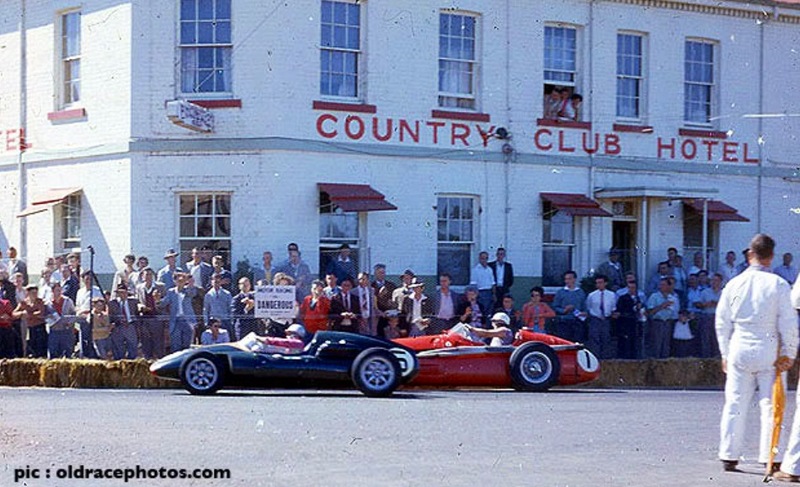 Brabham and Tauranac based in the UK collaborated with Repco in Melbourne to gain a head start on the new 3 litre F1 Grand Prix rule changes for 1966. 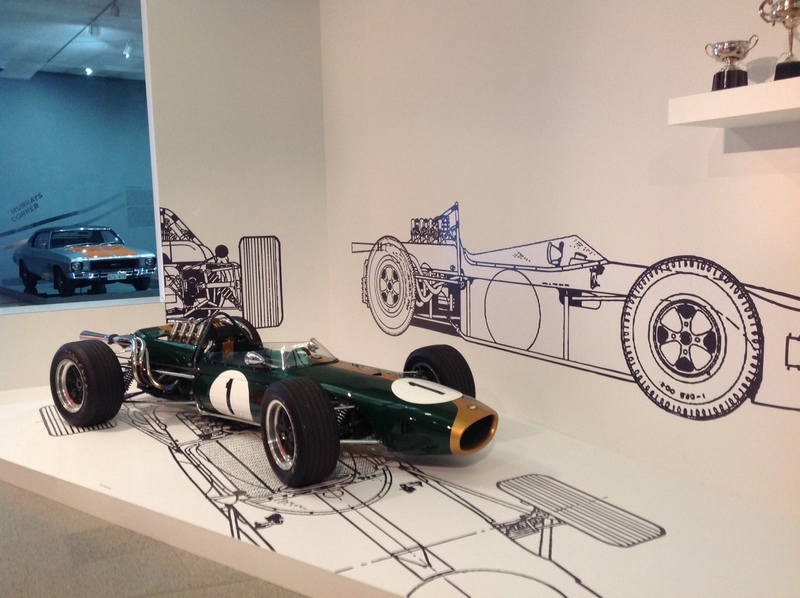 Jack and this Brabham successfully taking on the ill prepared other teams within the F1 paddocks and grabbed both Drivers’ & Constructors’ Titles in 1966 and 1967. 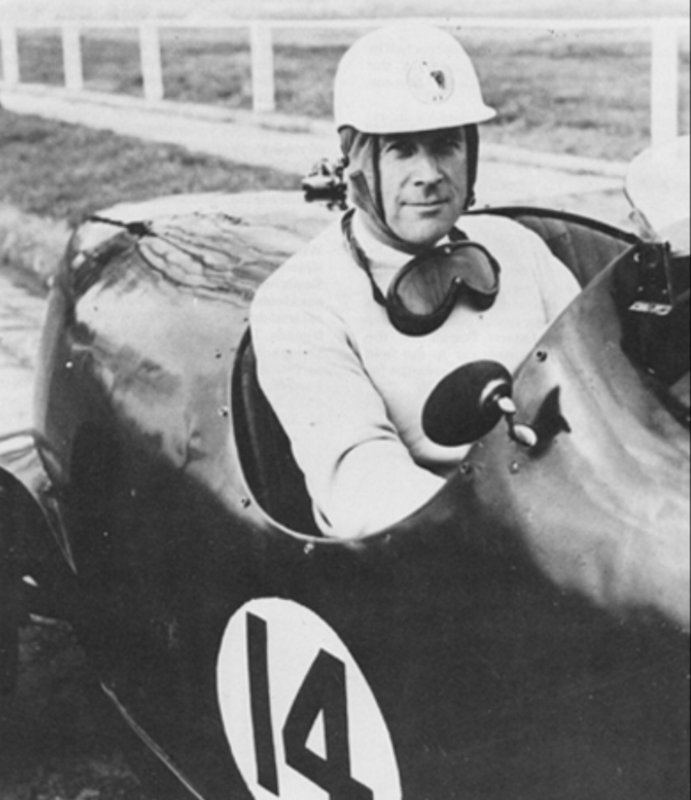 (Denny Hulme grabbed the Drivers Title in 1967). 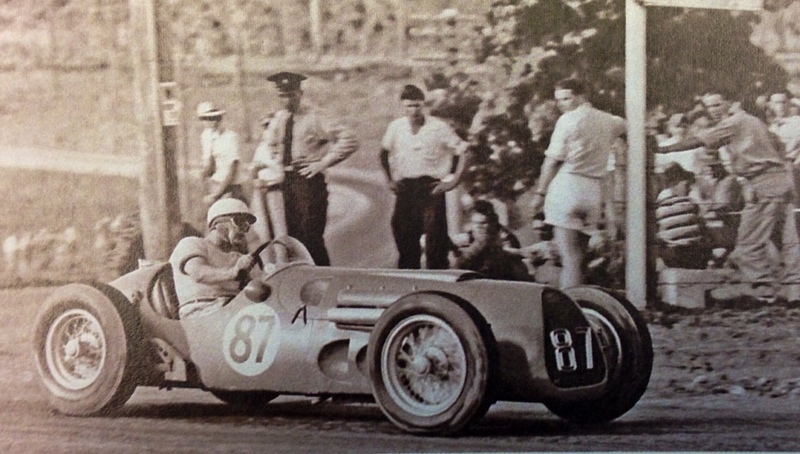 Garrie Coopers’ Elfin concerns first production racing car was the Elfin Streamliner, like many other designers he took a long look at Chapmans’ Lotus 11 and was consistent with many elements of it in his own interpretation; multi-tubular spaceframe chassis, slinky, light aluminium body and a range of engine configurations to suit customer choice. 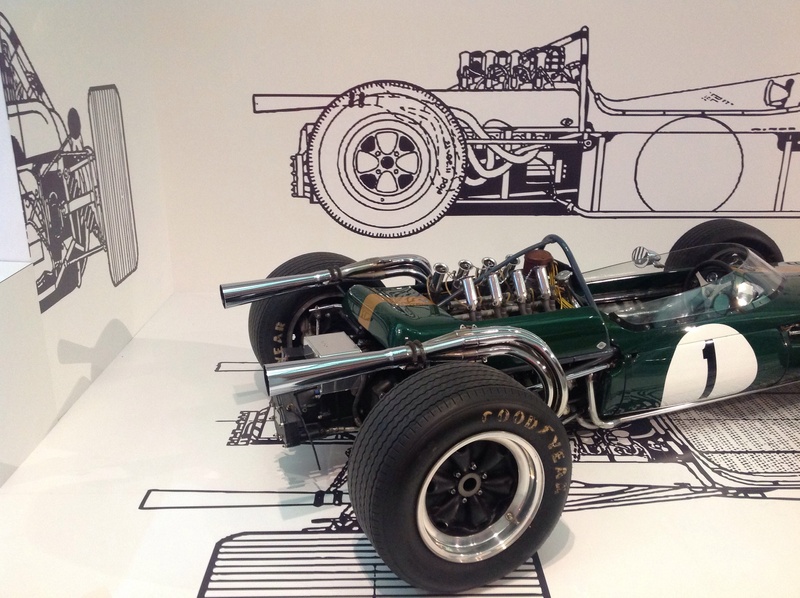 The car on display is the ‘ducks guts’ with Coventry Climax FWA engine and front wishbone, as against split front axle setup. 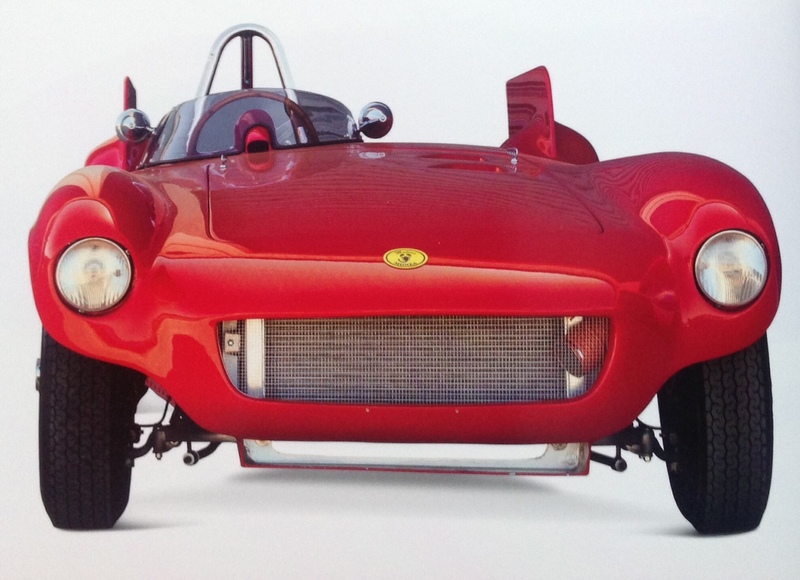 Elfin built 23 of these cars from 1959 to 1963, Cooper setting the foundations for high standards of design and manufacture which were his hallmark and sustained commercial success. 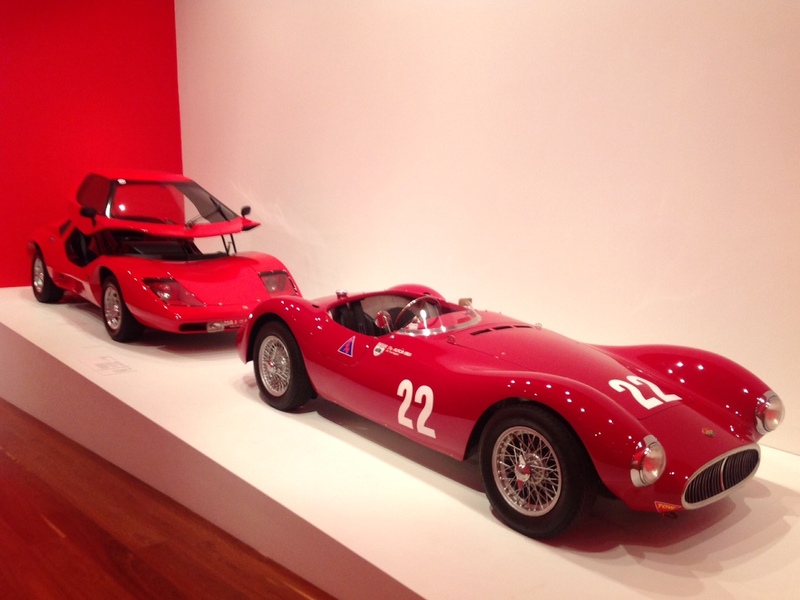 When Ausca met Eureka; Nice juxtaposition of the 70’s Wedge with the curvaceous 50’s. 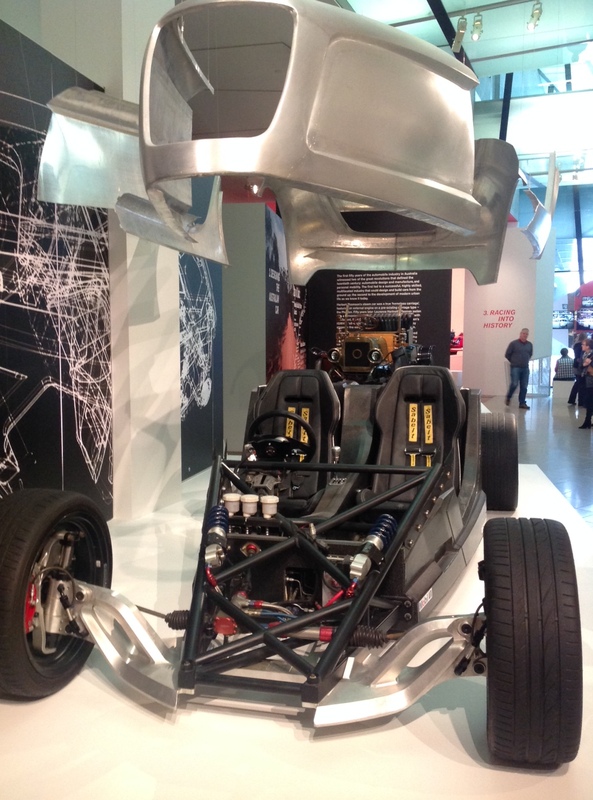 Not many cars have been built with full canopy door openings. 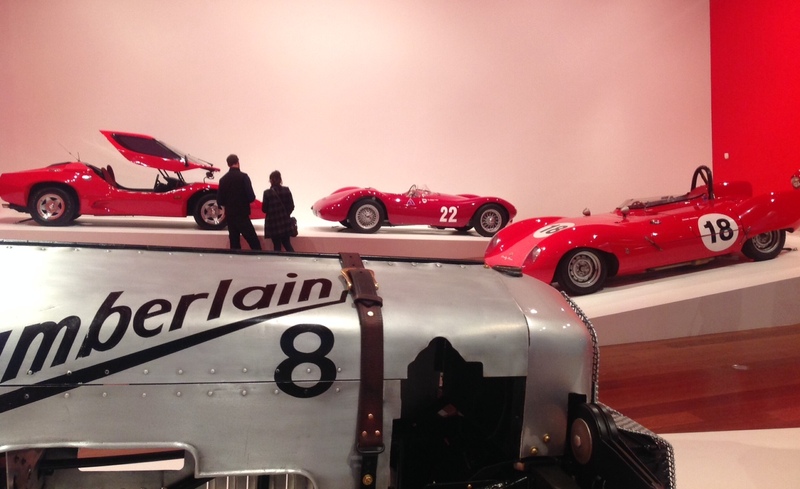 But with the Purvis Eureka and Holden Hurricane this exhibition has two. 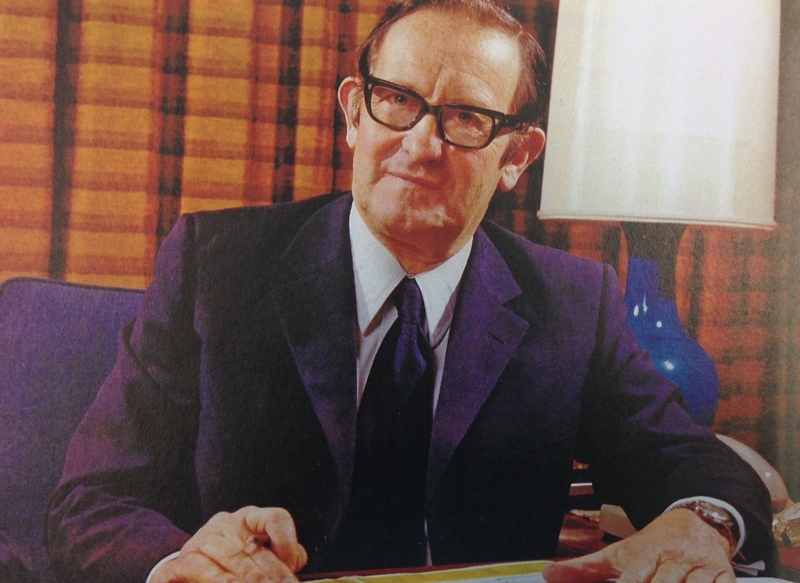 Allan Purvis, an advertising executive, obtained the rights to the English developed ‘Nova’ building over 650 cars in Melbournes’ Dandenong between 1973 and 1989 considerably improving the design as he went along. 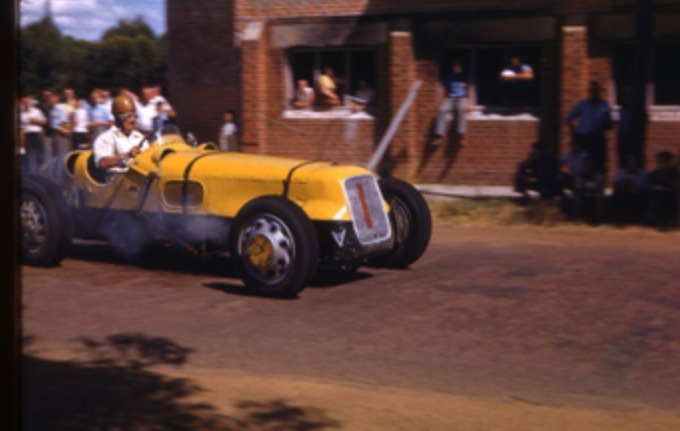 The car was based on VW Beetle chassis and mechanicals although Purvis built some cars with the Ford ‘Kent’ 1600 engine, a very ‘tunable lump’ with bits from Cosworth, Holbay and the like. 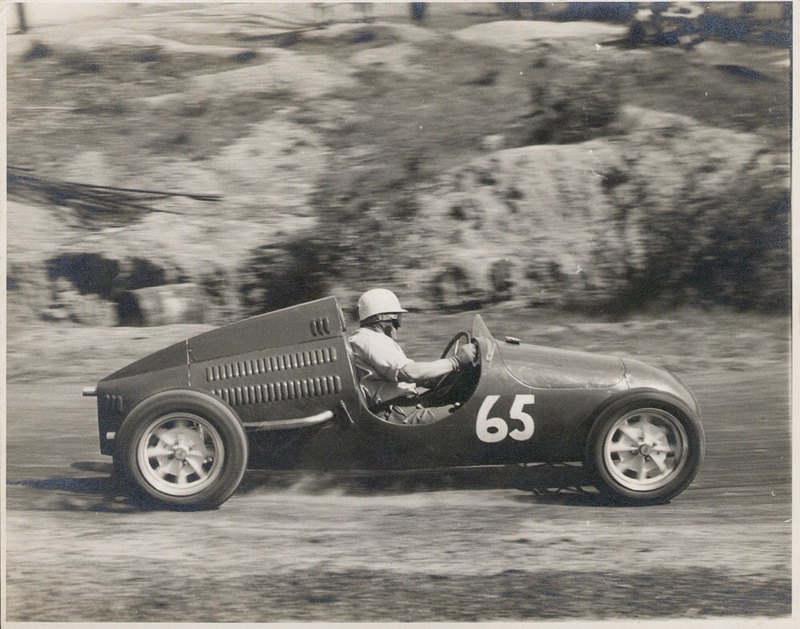 Paul England and his friend Bill Hickey built the Ausca in their spare time at Repco Research in Sydney Road, Brunswick the clever, light car having a ladder frame chassis, a fibre glass body, the pair making the moulds. 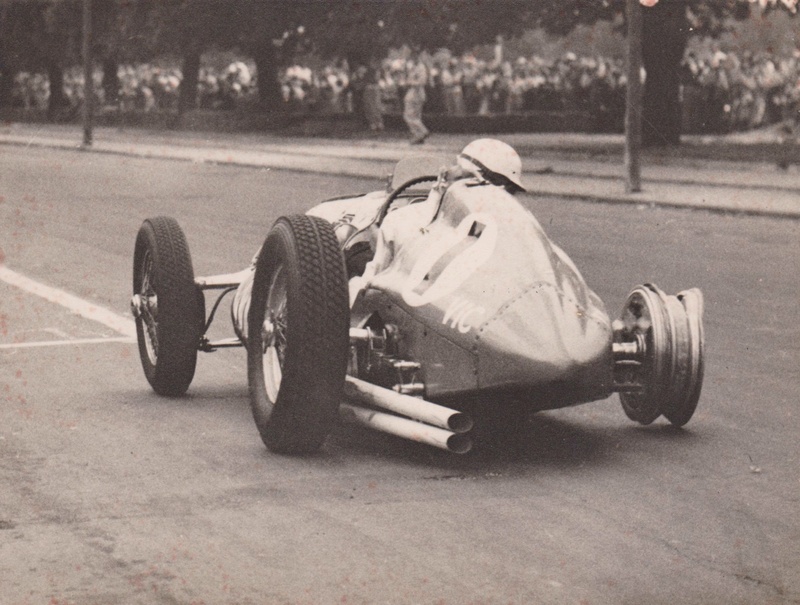 Holden front suspension was used, England narrowing the track by cutting 6 inches out of the middle of the cross-member and a Holden rear axle casing also shortened by 3 inches, suspended by quarter elliptic springs, radius rods doing locational duties. 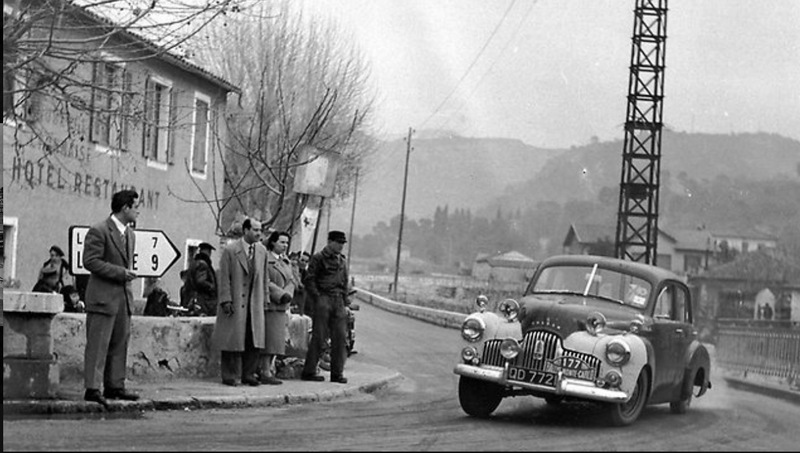 Steering was by Peugeot rack and pinion, Repco subsidiary Patons provided the drum brakes the car powered by the very first ‘Repco Hi-Power’ cross-flow head for the ubiquitous Holden ‘Grey Motor, the engine good for around 115bhp @5000 rpm using 2 1 3/4in SU carbs 1956. 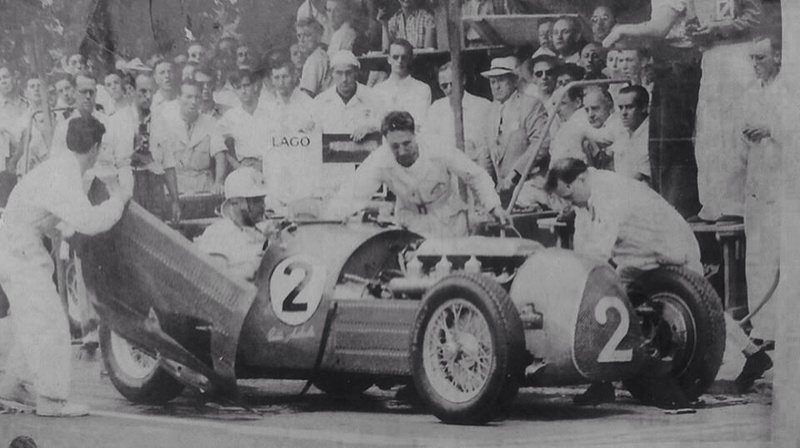 Gearbox was a Fiat 521 using straight cut gears, the car first raced late in 1955. 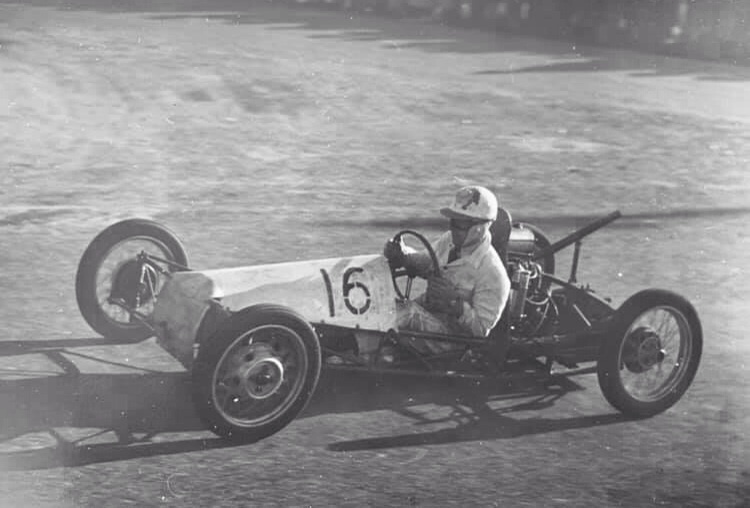 Chamberlains’ as a family had a rich engineering heritage, originally manufacturing ball bearings and later tractors so Bob Chamberlain and his friend Bob Price had access to the toolroom and factory facilities to build their outrageously innovative space frame chassis, independently sprung, front wheel drive car. First completed in 1928, the car evolved over the decades. 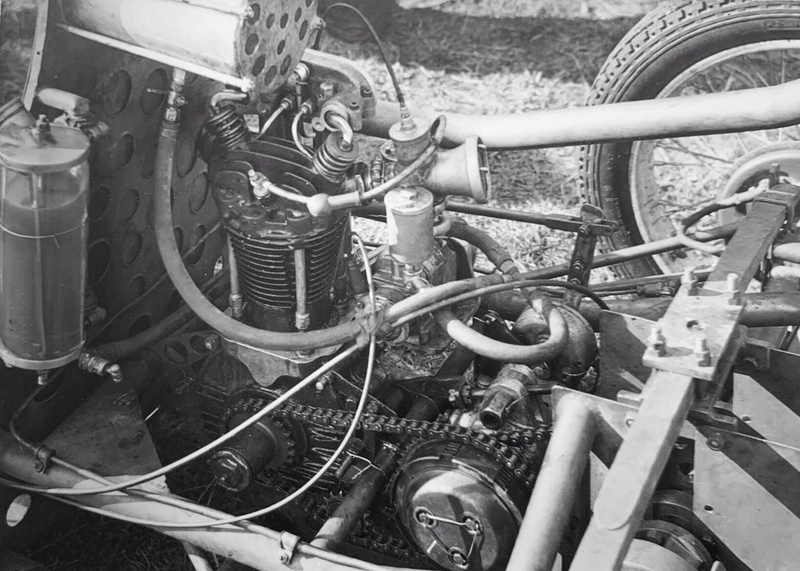 After a succession of unreliable motor cycle engines Bill Chamberlain decided to build an engine himself. The result was a 1004cc 2 stroke with 4 cylinders and 8 pistons, two crankshafts and a Rootes type blower. 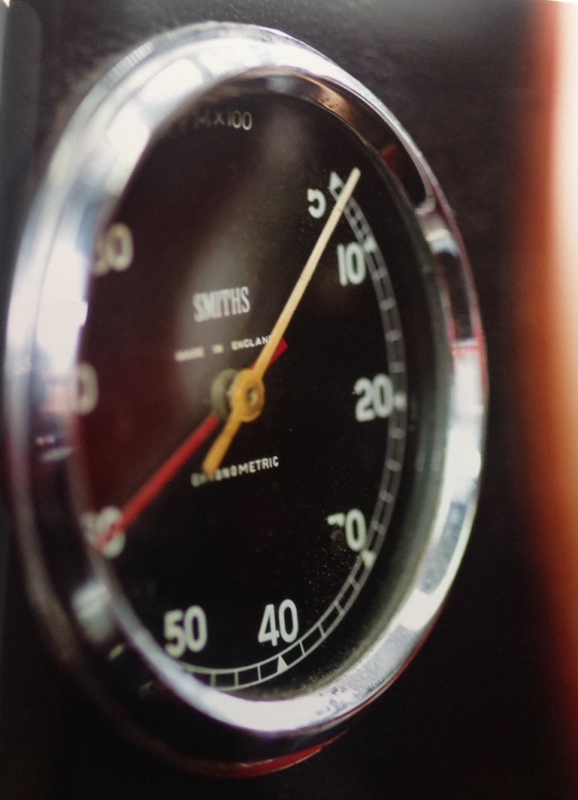 Its scream was its hallmark @ 7000rpm, at a sedate 5000rpm it developed 80bhp. 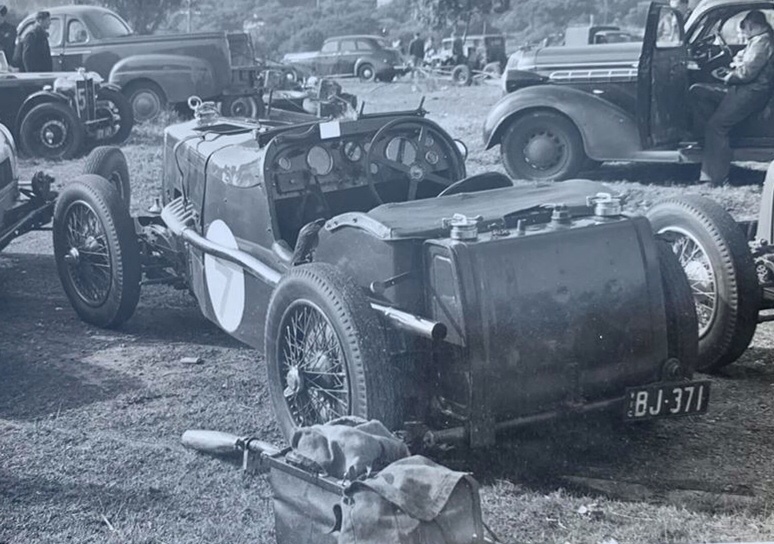 The Chamberlain competed in 3 AGP’s at Phillip Island in the 1930’s coming into its own post war when one of the Chamberlain’s cousins, Jim Hawker built his own spark plugs and improved its electrical system. The car never left the families hands and was restored for the 1978 Phillip Island 50 Year AGP Anniversary, its now owned by John Hazelden after the brothers deaths some years back. He is the lucky custodian of a very important part of our history. One off, Torana GTR-X concept was still a fair way away from Holden’s 1969/70 production vehicles. 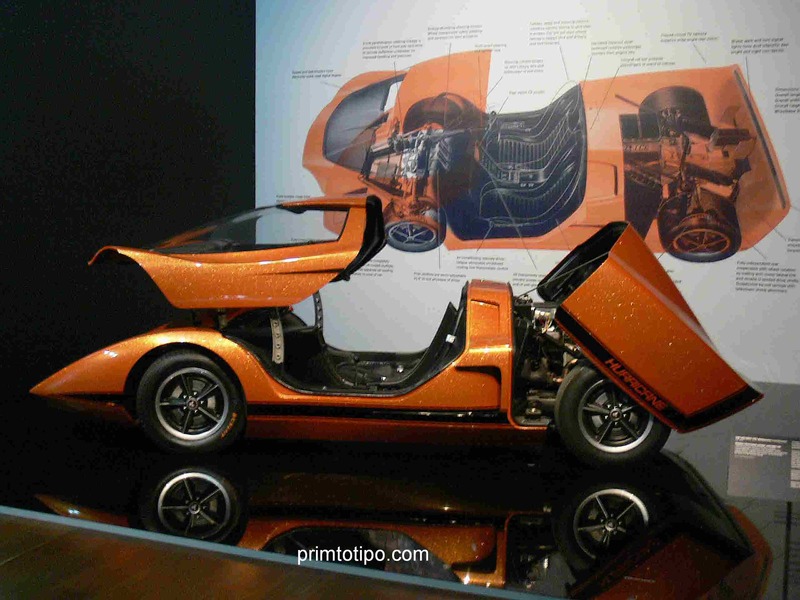 As with most concept cars the economics didn’t stack up to sign off for production. 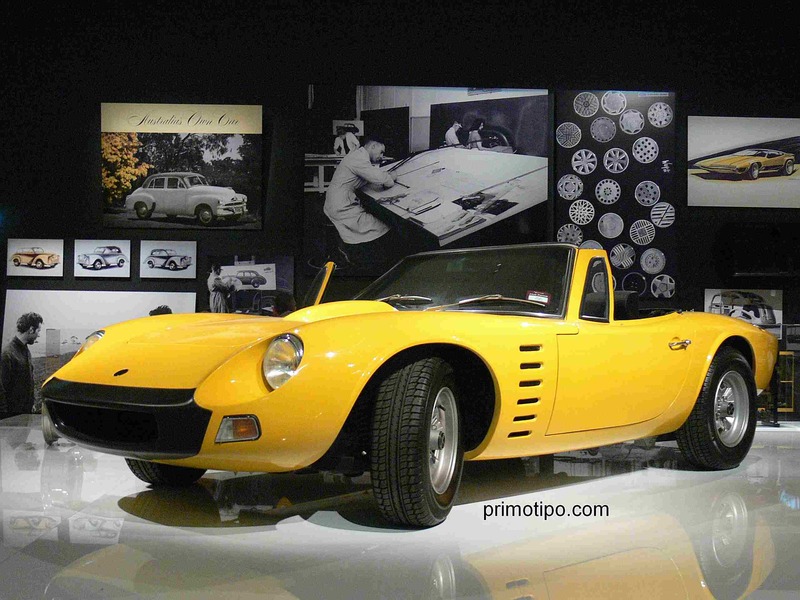 It would have been part of a niche market catered by the likes of Datsun’s 240Z and even the Bolwell Nagari shown below. A stunning car with bullet proof, race proven ‘186’ CID, pushrod OHV, triple Stromberg carbed 160bhp 6 cylinder engine hitting the road through a 4 speed close ratio gearbox…it should have been built and exported. 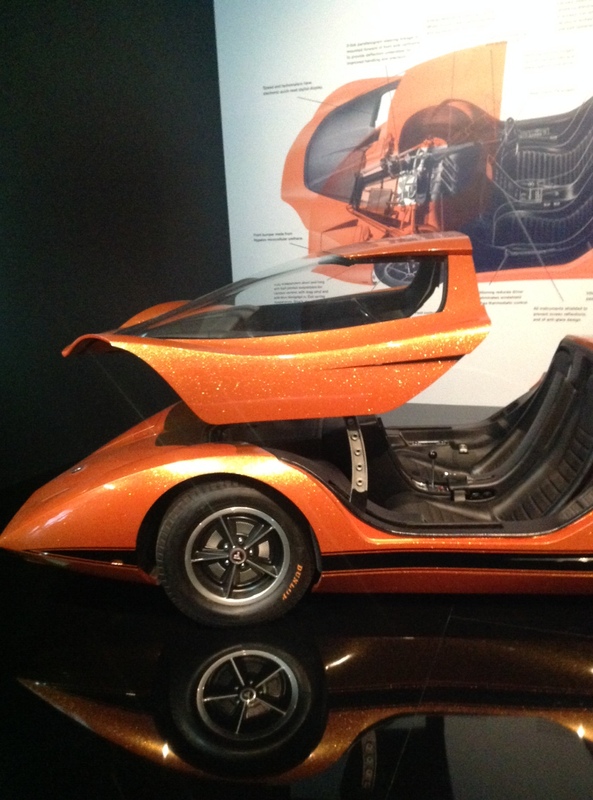 The FR1 Concept Car is a 2011 collaboration between GM Holden Design, the Victorian Centre for Advanced Materials Manufacturing, Boeing, the Victorian Automotive Chamber of Commerce and Marand Precision Engineering Collection. 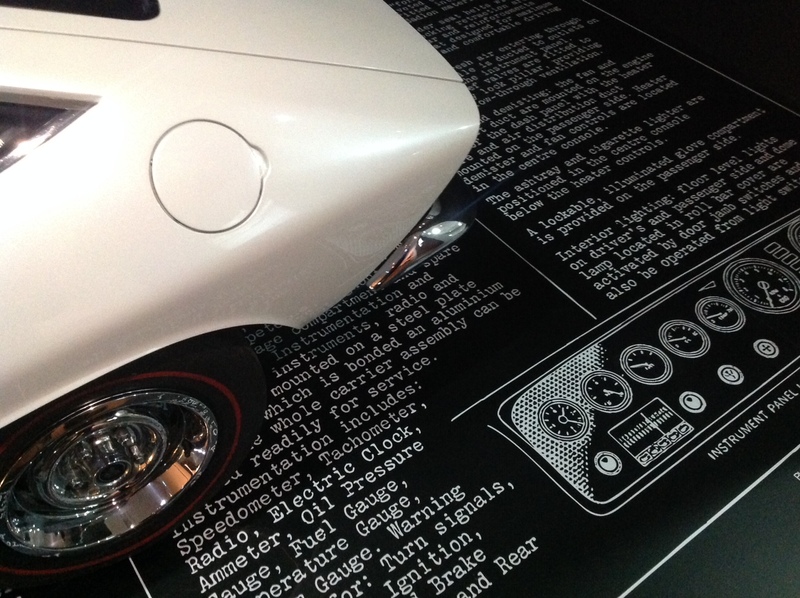 The car is a 21st century concept hotrod, hand crafted and powered by a 362bhp Chev V8 and 6 speed manual ‘box. Repco were a very innovative company, this is the engine developed as an option for the 1968 season and whilst developing good power on the test bench the difficulties of fitting the engine into Ron Tauranacs’ spaceframe chassis Brabhams’ or any other car for that matter are immediately apparent given the ‘spiders web’ of exhausts to be accommodated. 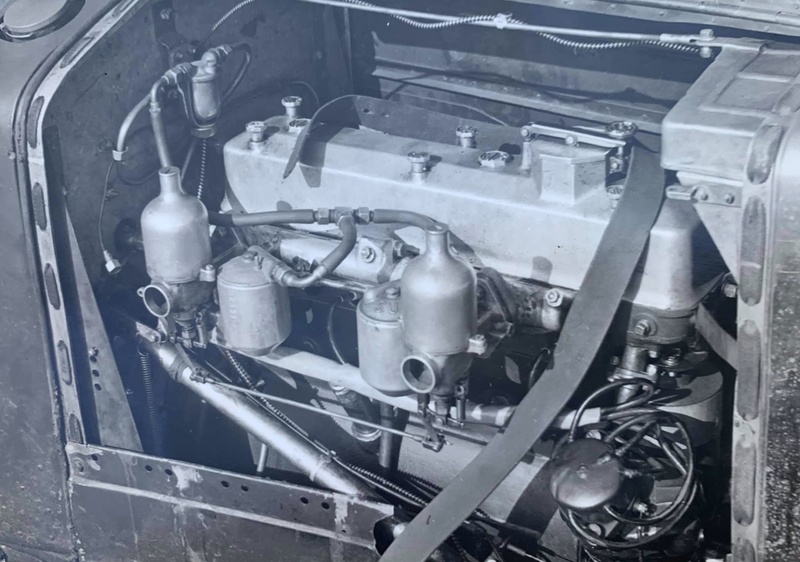 Developments of Repco’s ’30 Series’ heads showed there was a power advantage with cross flow gas paths, the ‘radial layout’ ’50 Series’ heads were aimed at exploiting that. 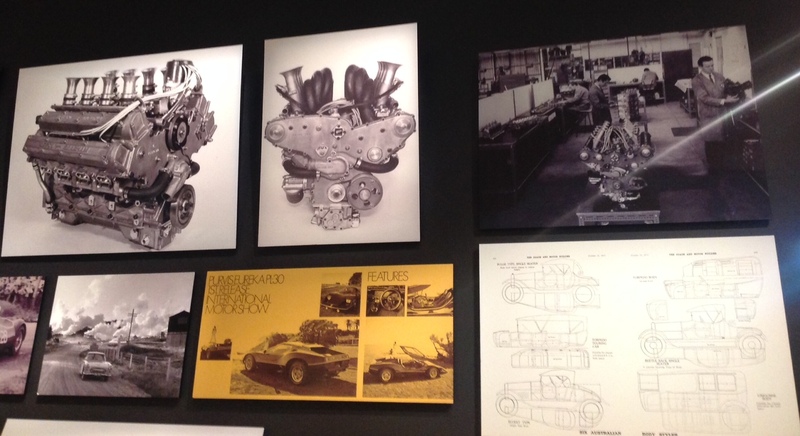 DOHC were used per bank, each one driving inlet and exhaust valves alternately. The valves were side by side in each half of a pent roofed combustion chamber. This layout allowed very simple valve operation compared with the BMW Apfelbeck ‘radial’ heads of the time. 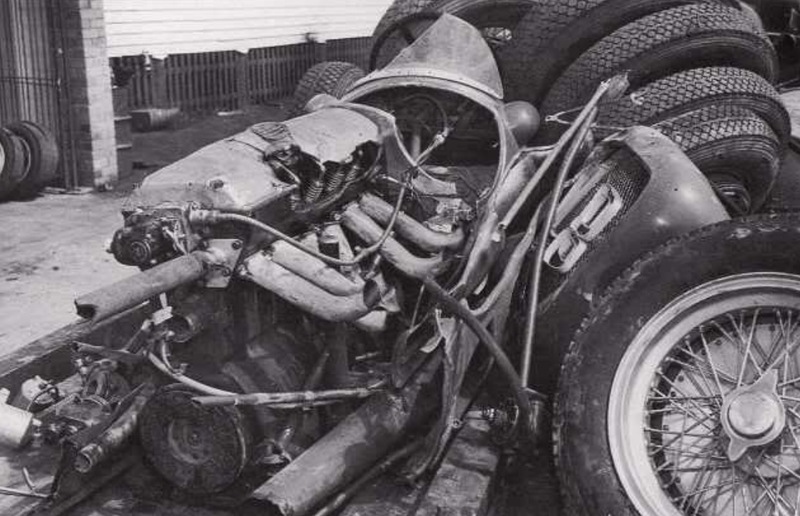 Doug Nye..’ On the Repco test heads exhaust stubs appeared within the Vee as a bunch of 8 small bore pipes, while 4 more appeared below the heads outside the Vee on either side. 8 induction trumpets fought for space within the Vee, and 4 more appeared on each side’. 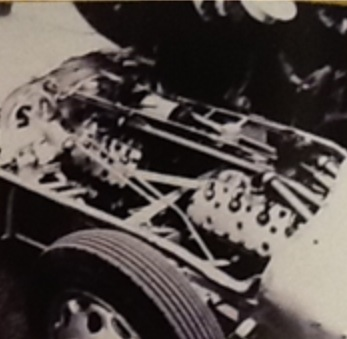 One test engine was built up and the results were ‘encouraging’ but it was a blind alley because of installation problems…So the ‘Type 50′ heads were shelved and the more conventional ’60 series’ DOHC 4 valve heads used in 1968. 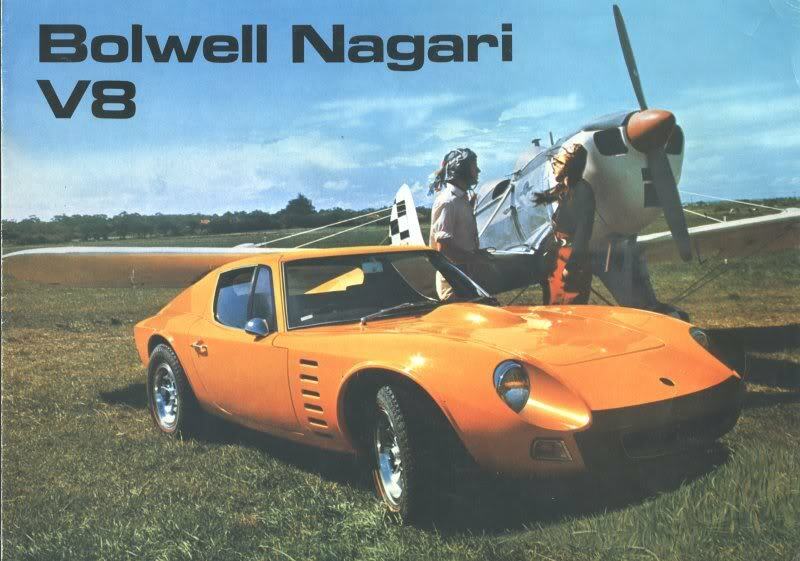 When i was 13 i drooled endlessly over the Bolwell Nagari, it really was ‘as good as it got’ in Australia. 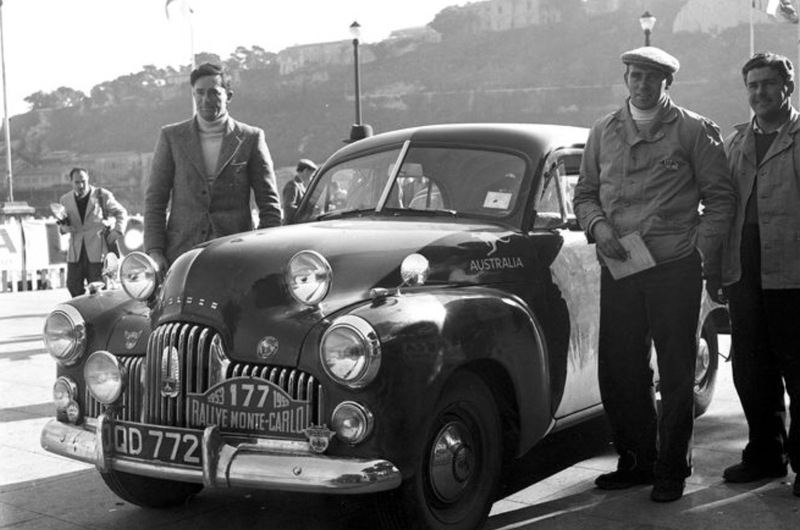 Home grown in dowdy Mordialloc but with Italian looks; the Chapman inspired backbone chassis a lightweight platform for the fibre-glass body and core Ford componentry; ‘302’ Windsor 5 litre V8, 4 speed ‘box and rear axle, live axle but very well located. 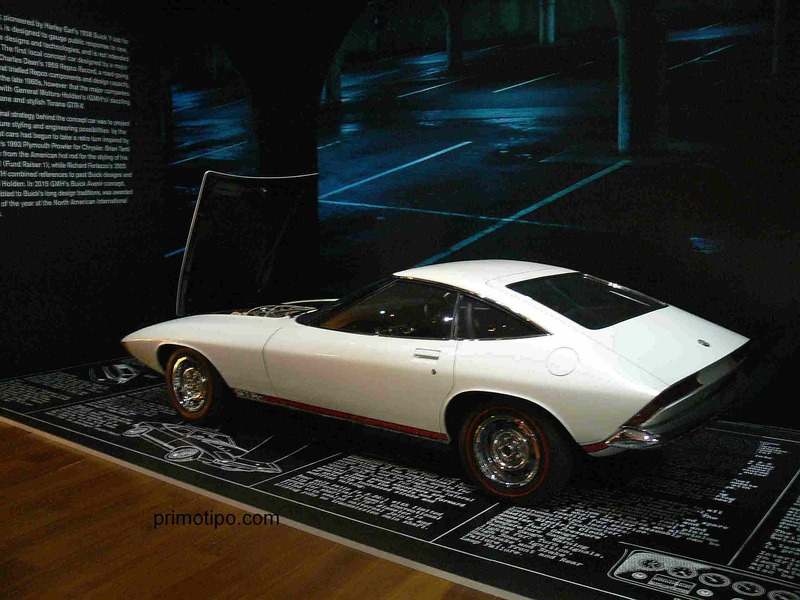 The Coupe version was even sexier than the ‘Spider’, Campbell Bolwell and his brothers were masters of the kit and low volume art…very tricky in a small market like Oz at a time the legislators made life hard for small players. In many ways the MM is the most powerful and beautiful of Australias’ Holden engined specials. 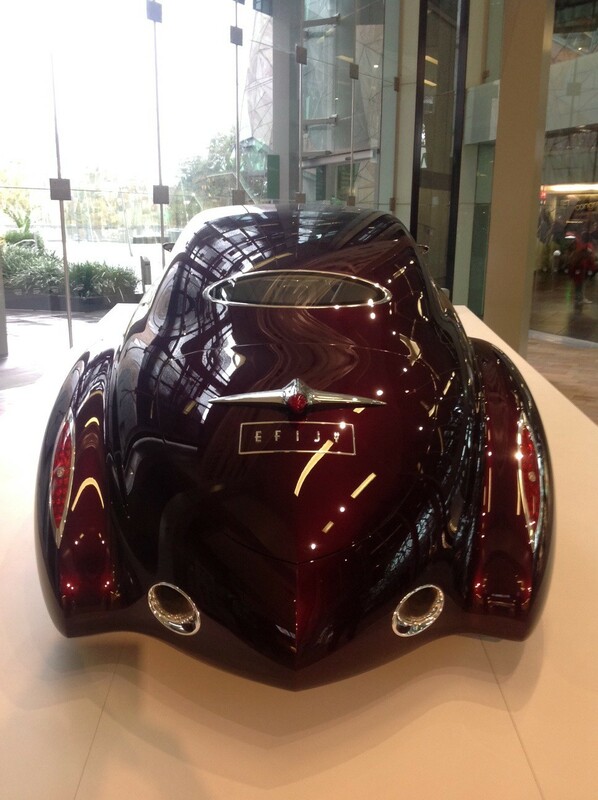 Concepted by Lou Molina, much loved member of Melbournes’ ‘Spaghetti Mafia’ who brought fine Italian cuisine to Melbourne between the wars and Silvio Massola, the car was designed and built by Brian Burnett, who by 1955, had the Maybach bodies in his cv. The car had a ladder frame chassis, an aluminium body that was derivative of many influences but wonderfully distinctive with it. Motive power was the Holden ‘Grey motor’ with Repco Highpower head but also fitted with a Marshall blower fed by a big SU 2 3/16th ins. carb, 199bhp @ 6000rpm the result. Drive was transmitted by a dual plate clutch to a Jag ‘box and then by a short drive shaft to a de Dion rear end utilising Ford components. Front suspension is of planar type using a transverse spring to locate steering knuckles at the top, with wishbones below. Telescopic shocks are used front and rear. Steering is by Citroen rack and pinion, brakes drum using HWM Jag components at the front. 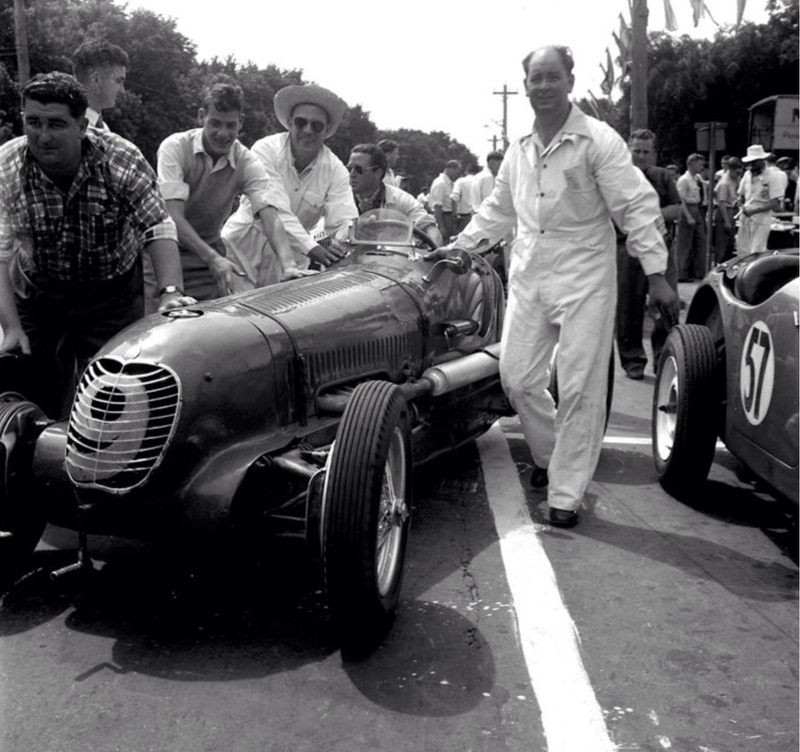 MM made its competition debut at Rob Roy in Melbournes’ Christmas Hills on May 5 1957 and was very successful in Molinas hands against much more exotic cars before slowly passing into obscurity before being superbly restored not so many years ago by Gavin and Bryan Sala. It is a truly fabulous device. 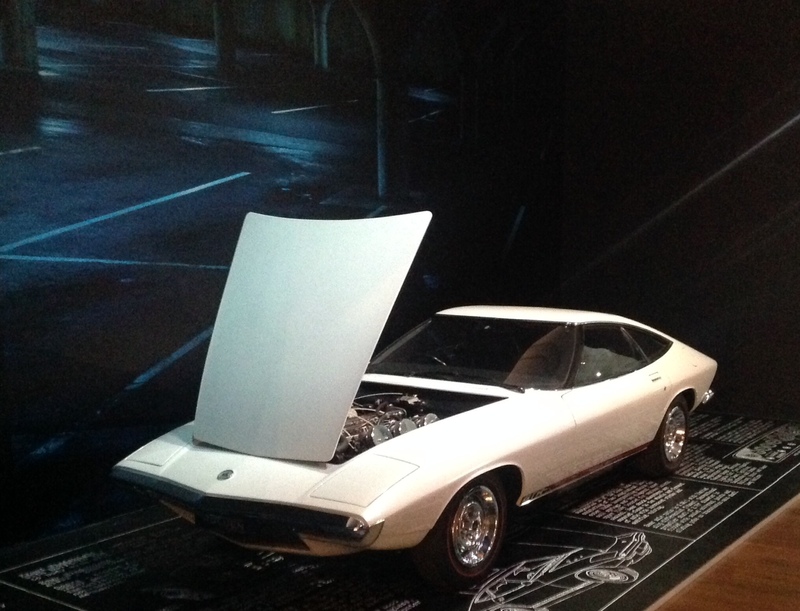 The car made its Melbourne Motor Show debut in 1969 and has a box section steel frame clothed in fibre glass panels. 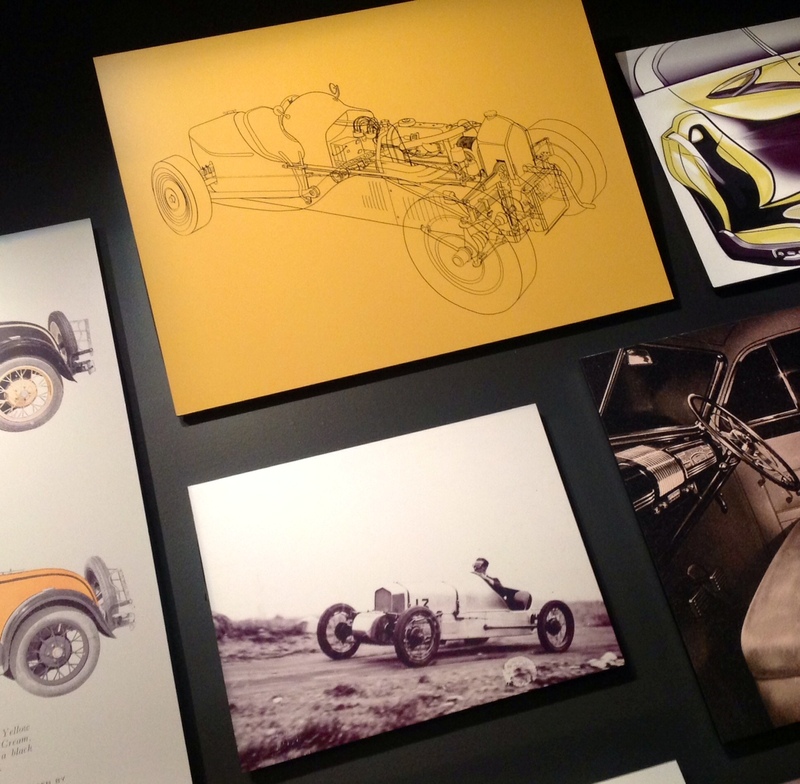 Wishbones, coil springs and dampers were used at the front, rear suspension uses swing axles, trailing arms and coil springs. 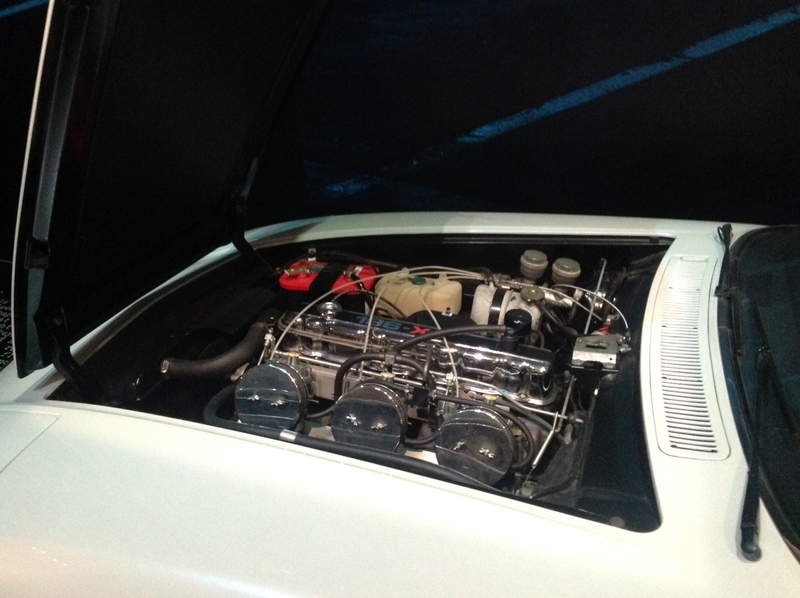 The 4.2 litre pushrod OHV V8 produced 260bhp @ 6000rpm, the car uses a 4 speed manual ‘box and disc brakes on all corners. Height is 39.2 inches. The triple 45 DCOE Weber-fed Chrysler Valiant Charger’s played second fiddle to GTs and XU1s for too many years. But not anymore, they have a strong following and their values have increased substantially. 265 CID, in line OHV 6 cylinder engine, ‘E39’ 3 speed and ‘E49’ 4 speed ‘boxes. 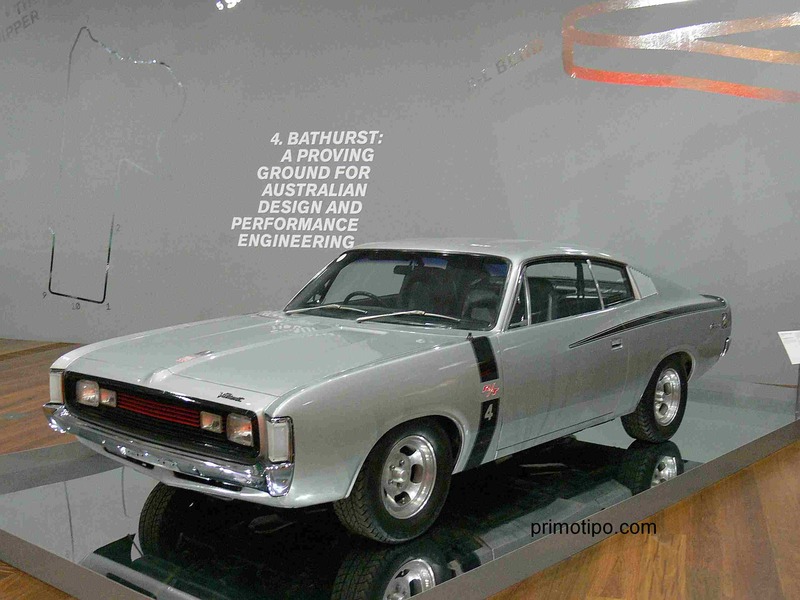 Never really developed as racers as Fords GTHO’s or Holdens XU-1’s but mighty competitive all the same. 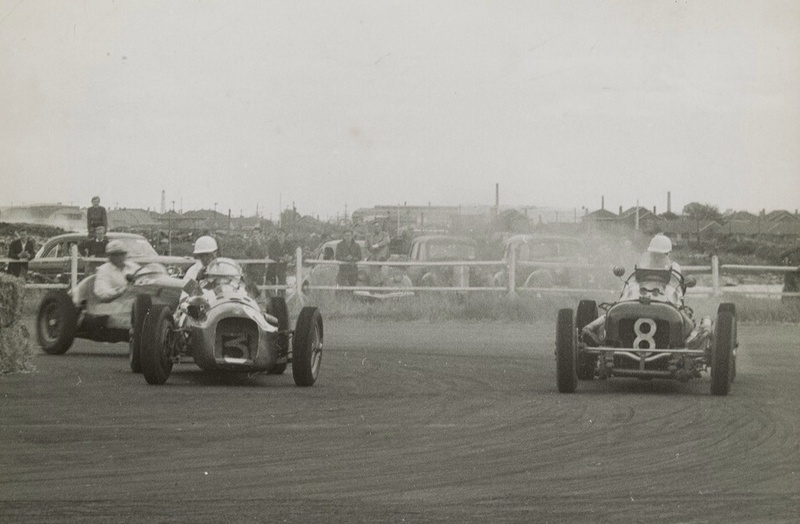 The ‘race meeting’ at Balcombe was a small but historically significant part of Australian Motor Racing history…this wonderful shot is from the Dacre Stubbs Collection. 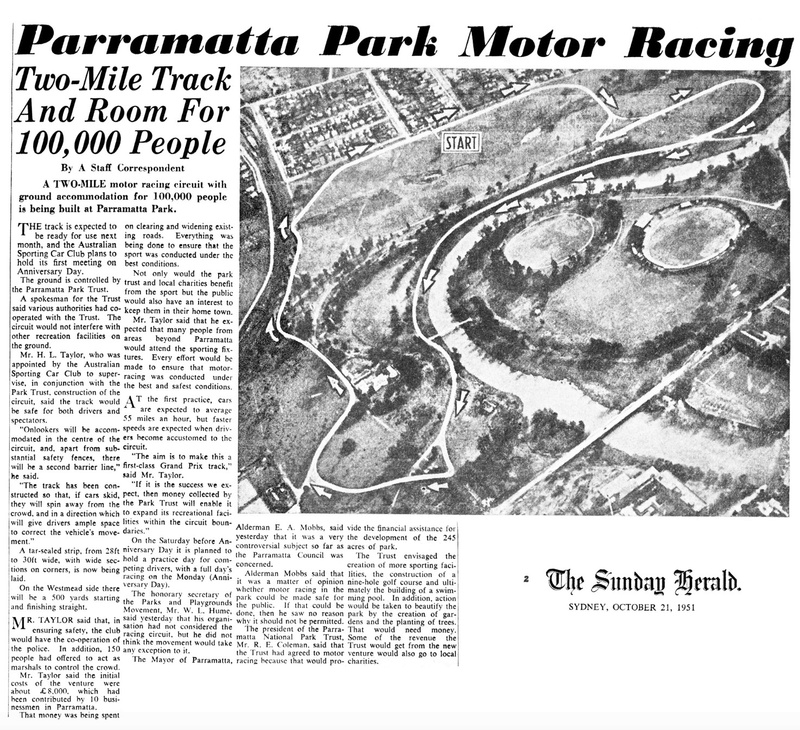 It goes something like this, as reported in Barry Greens fine book ‘Glory Days’ which records the history of Albert Park in the 1950’s. So the Balcombe meeting occurred as more of a sprint meeting, given track limitations, with two cars on the track at a time and a series of eliminations on the day to determine the winners of the various classes. 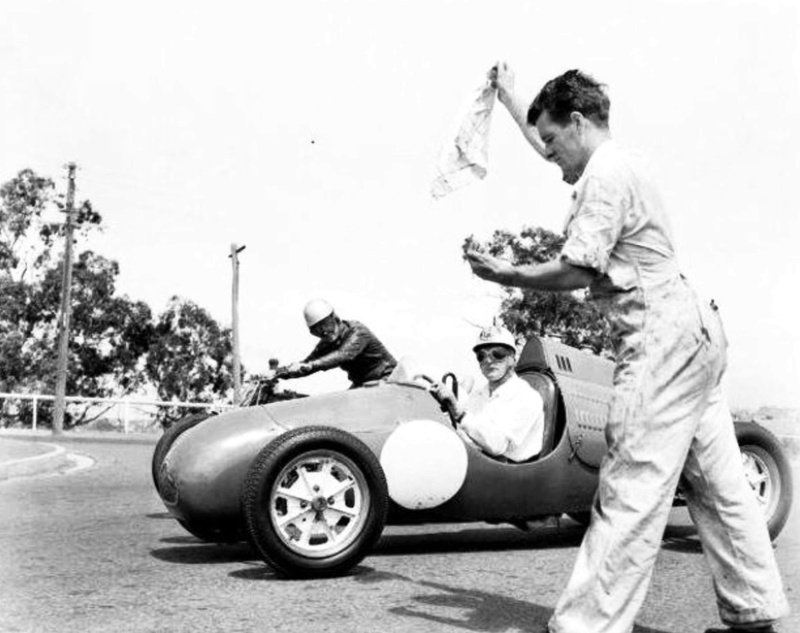 ‘The Royal Australian Signals Corp Sprint’ for under 1500cc, ‘The Survey Corps Sports Sprint’ for over 1500cc and ‘Balcombe Apprentice School Trophy’ for outright cars. Catchy names indeed. 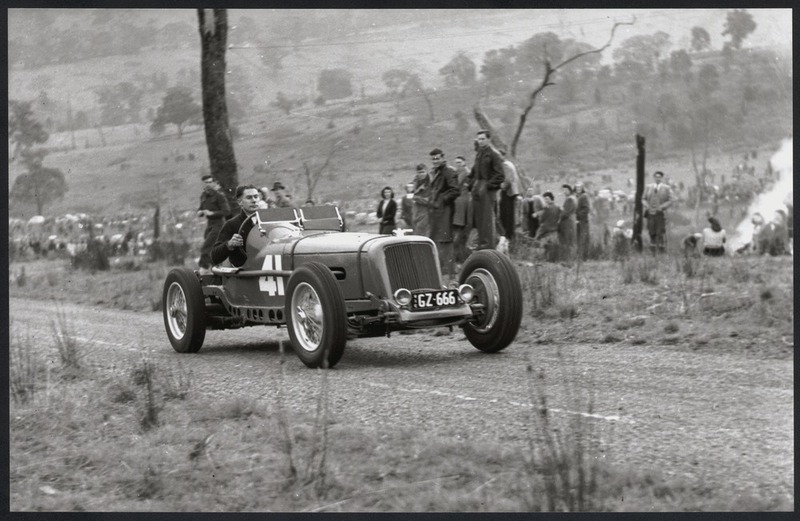 Doug Whiteford won the outright final in his 1950 Australian Grand Prix Winning Ford V8 Spl, ‘Black Bess’, from Bill Patterson’s supercharged MG TC and Stan Jones HRG. 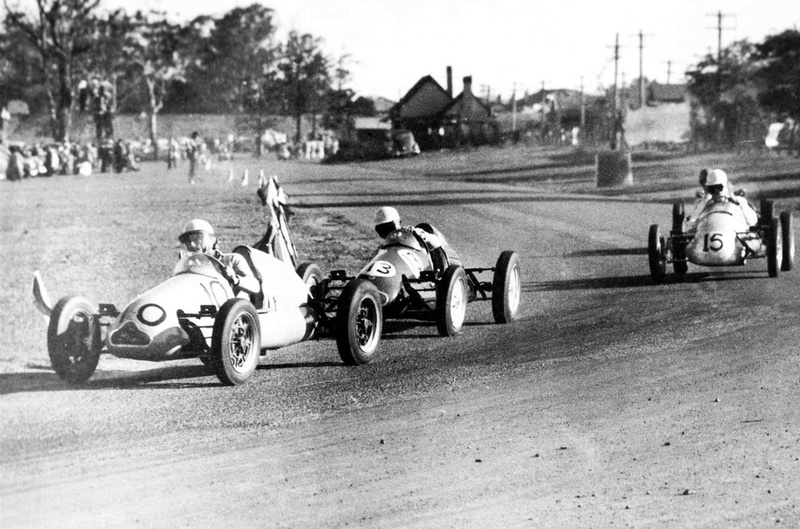 All three were subsequently Australian Champions and AGP winners. 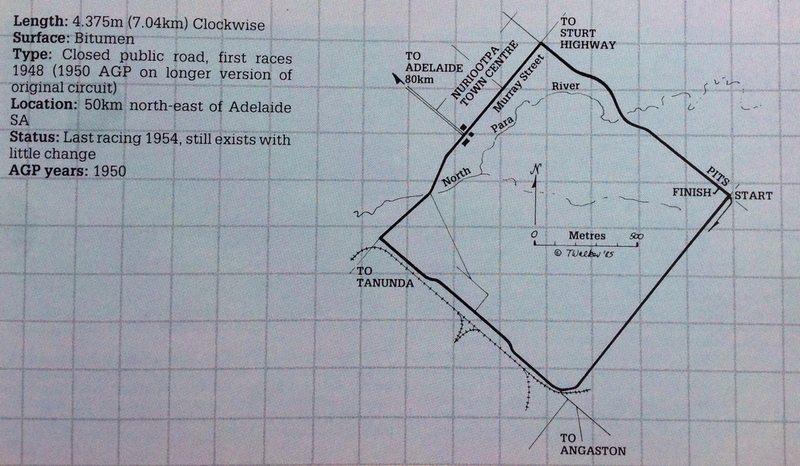 The historically significant bit is that when Bill Leech, lifelong competitor, car collector and LCCA President at the time discussed the meeting and its shortcomings as a circuit, sans Nepean Highway with the Commander of Army Southern Command, he was asked ‘what can we use as an alternative’? Whereupon Leech replied ‘what about here?’. 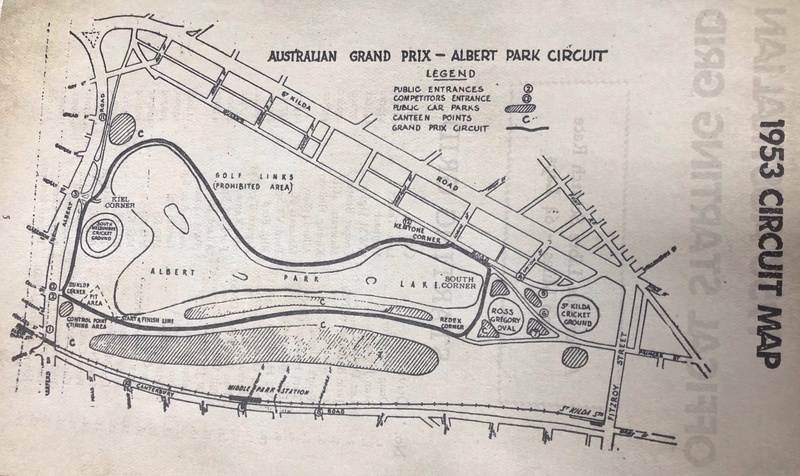 Here being Albert Park where Southern Command were then based…and the rest as they say is history and covered a while ago in another post. 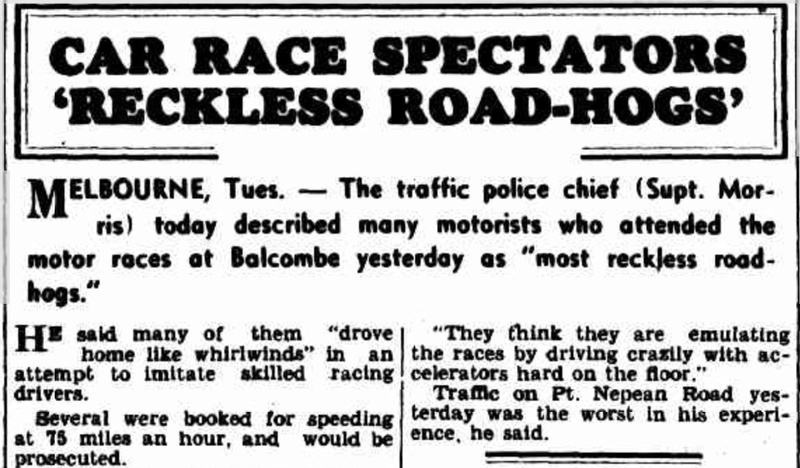 In an amusing end to the weekend the Hobart ‘Mercury’ reported that the Melbourne Traffic Police Chief described many motorists returning from Balcombe as ‘reckless road-hogs’- harsh language indeed. ‘Many of them drove like whirlwinds’ in attempts to emulate the skilled drivers with several booked for speeding at 75 miles an hour. 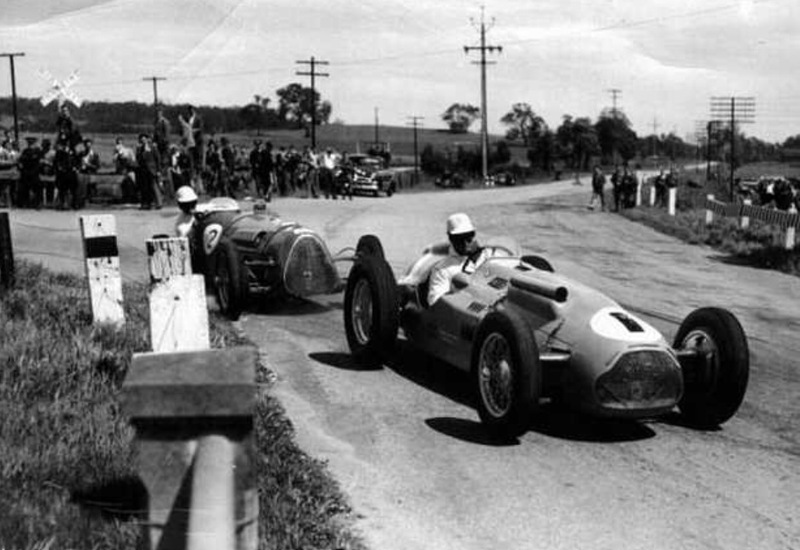 The racers themselves were spared the blame, with perhaps the need for speed the stretch from Mornington and along past Sunnyside to Mount Eliza? I guess Pt Nepean Road is what we now know as the Nepean Highway. It was towards the top of the hill on the Nepean Highway as you leave Mornington and enter Mount Martha and these days is the site of a school, Balcombe Grammar and housing. The last army training units left the area in 1983. 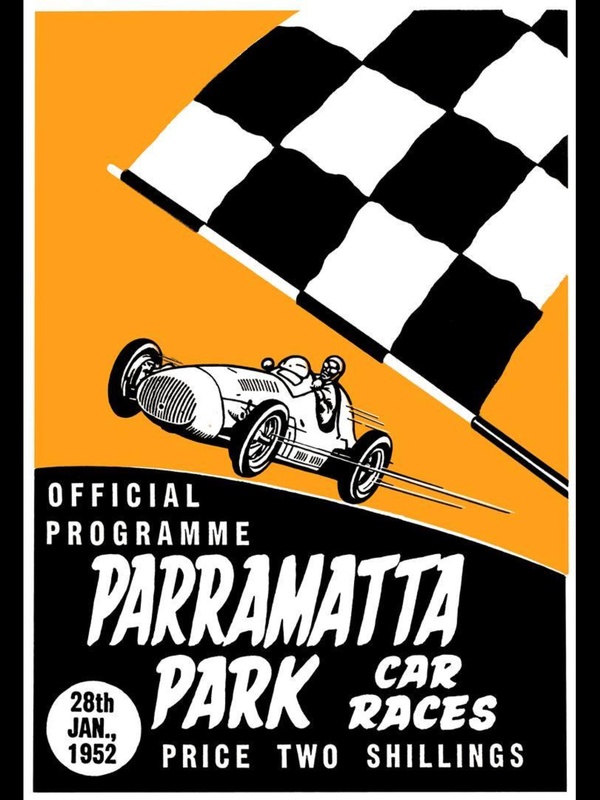 For international readers Mount Martha, of which Balcombe is a part are on the shore of Port Phillip Bay, the vast expanse of water one can see in the distance on the AGP telecasts from Albert Park. The Mornington Peninsula, both it’s beaches and wineries are worthy additions to your tourist agenda when you visit! The US Marines also played a part in construction of the circuit being credited with building both Uralla Road through the camp and Range Road locally to access a rifle range. As World War 2 approached countries globally prepared for the inevitable, the 4th Division of the Australian Army were located at a camp in Balcombe on 209 acres of land compulsorily acquired from local landowners to defend Port Phillip and the Morninton Peninsula. The army presence had a huge local impact, at the time their were 104 houses in Mt Martha- by mid 1940 over 3000 militia soldiers of the 4th division trainees were located at four temporary campsites between the Nepean Highway and the coast just south of Bay Road. Press reports at the time the camp was built said it was the most pleasant site for an army camp in the country, a point not lost on the ‘Army Brass’ one suspects, the Peninsula then as now a popular summer playground. The 1st US Marine Division, relieved from the strategically critical Coral Sea campaign at Guadalcanal, arrived in 1942 and used Balcombe Camp as a rehabilitation centre. It became headquarters for the 1st Division of the USMC in 1942, the corp trained in the area including carrying out beach landing exercises using the ship ‘HMAS Manoora’. Post war the Army Apprentices School was located there until 1983, and once, just once, it was used as a race track! 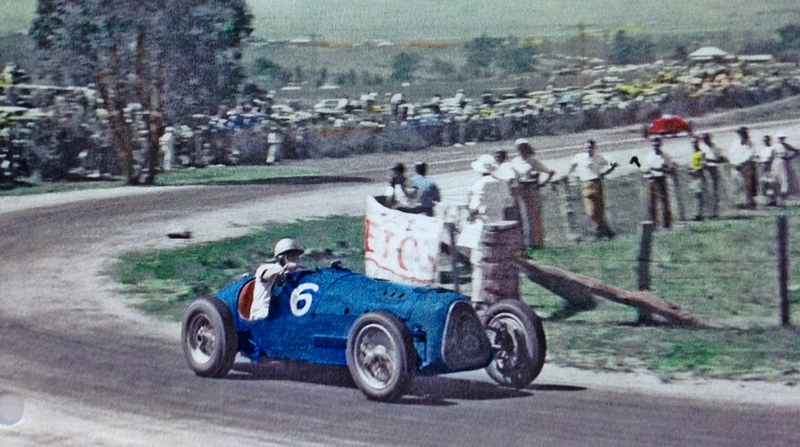 Lex Davison was one of Australia’s greatest drivers, the winner of four Australian Grands’ Prix and father and grandfather of two generations of racing drivers, grandsons Will and Alex are V8 Supercar Drivers, and James an Indycar racer competing currently in Australia and the US respectively. 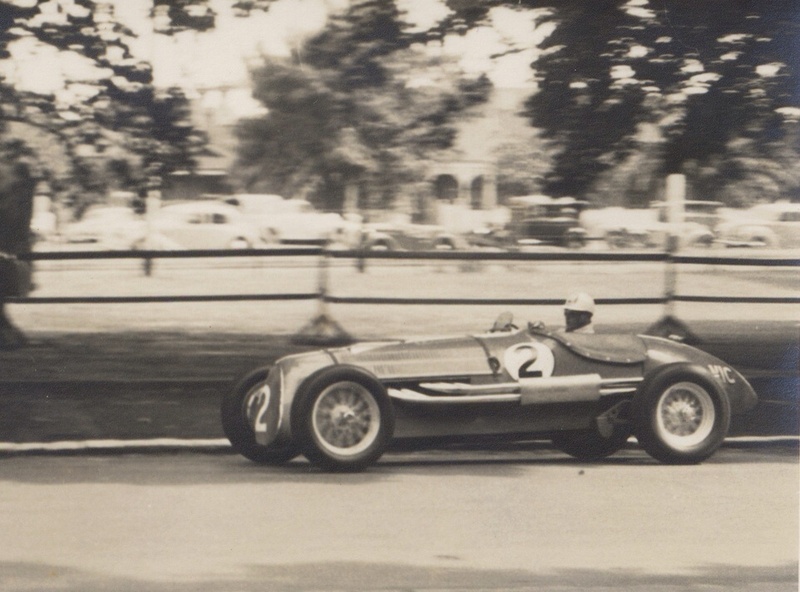 In 1950 he was still four years away from his first AGP win, competed in everything everywhere, and had just acquired an Alfa P3 in a progression which would take him to be a consistent front runner in the decade to come. 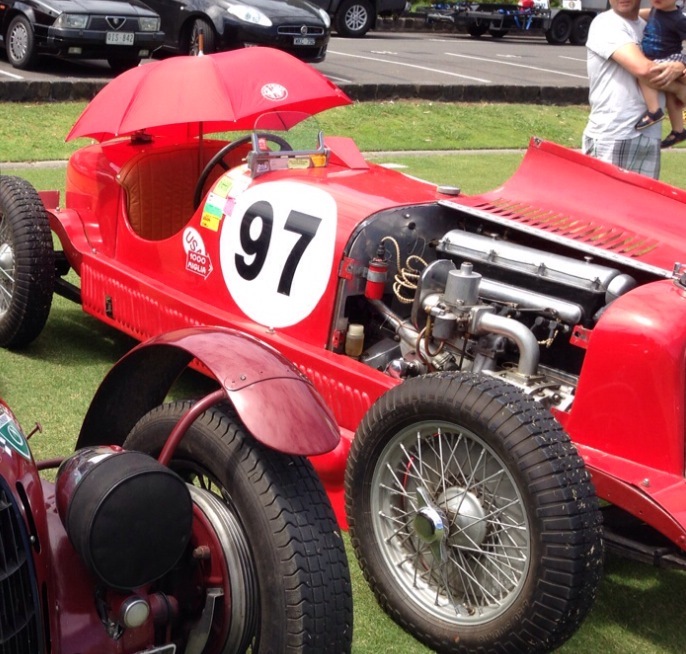 ‘Little Alfa’ started life as a Tipo 6C 1500 ‘Normale’, #0111522 was imported by Lex’ father in 1928 in chassis form as a road car. 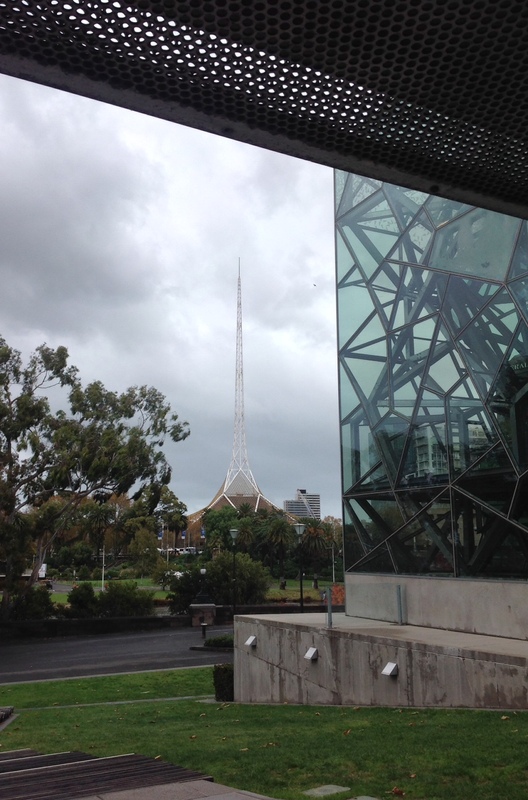 The original fabric body by Martin and King was replaced with a steel body built by Terdichs’ in 1945, both Melbourne firms. 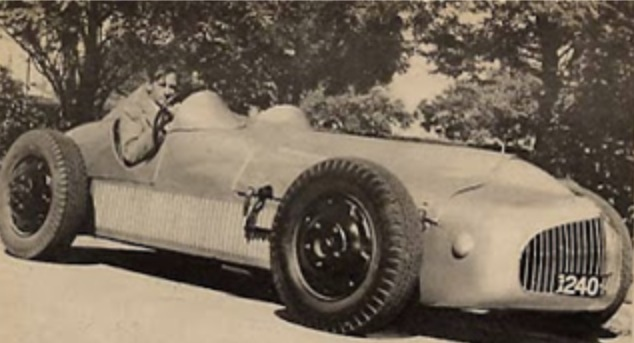 Lex took over the car after the death of his father, Barney Dentry, a top driver of the day himself, stripped it and Kellow Falkiner built a two-seater body. 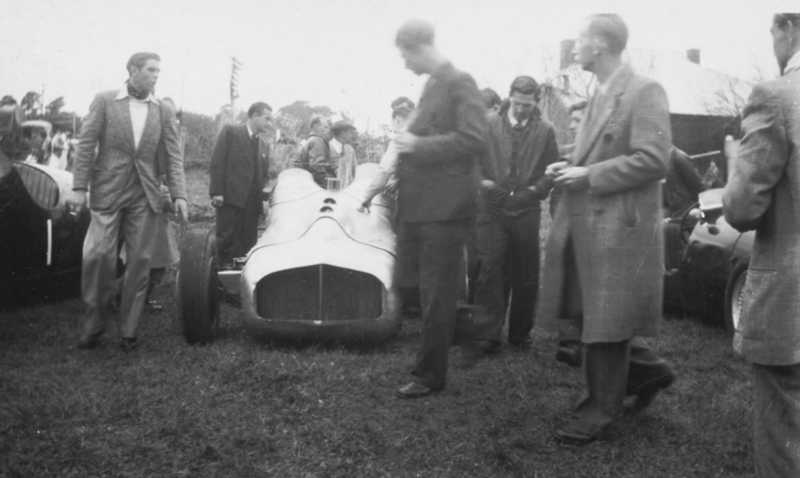 John Blanden records that the car became well known over the following years and was set aside when Davison acquired a Mercedes SSK. 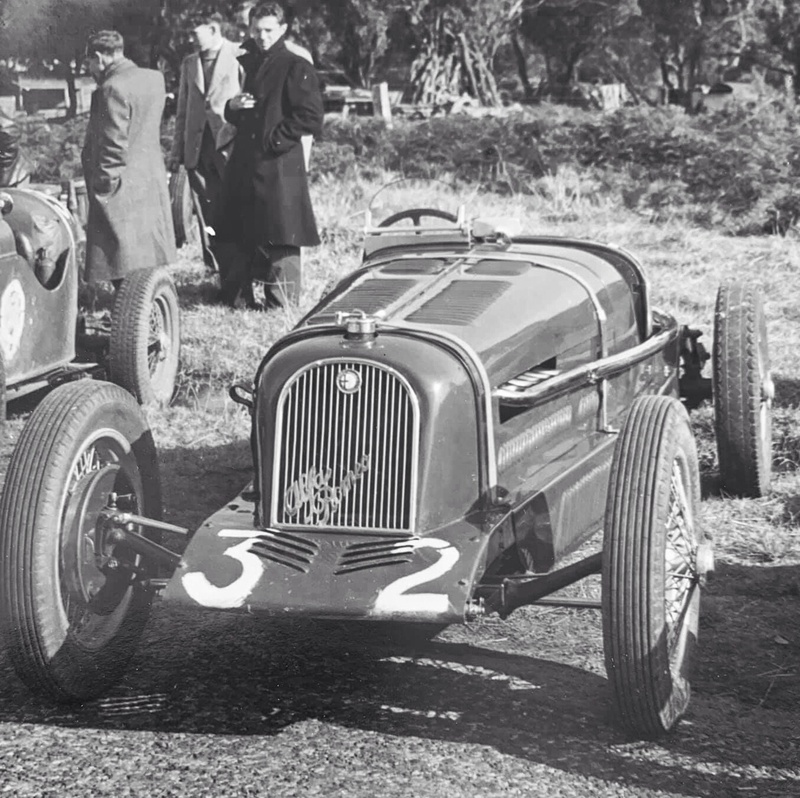 Dentry again ministered to the car and before it was completed the P3 arrived from the UK…as a consequence the 6C1500 car became henceforth the ‘Little Alfa’. 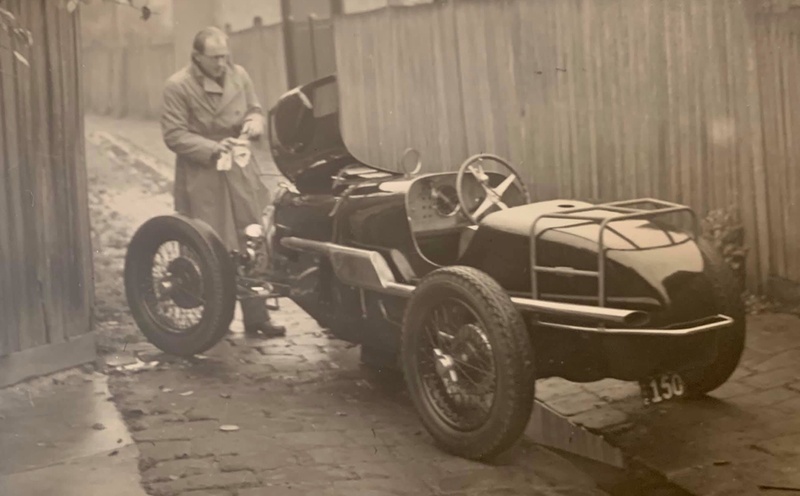 Dentry shortened the chassis, lightened the brakes, replaced the rear axle with one from a 1750 SS Alfa, fitted a Rootes cabin mounted blower and moved the engine back 6 inches. 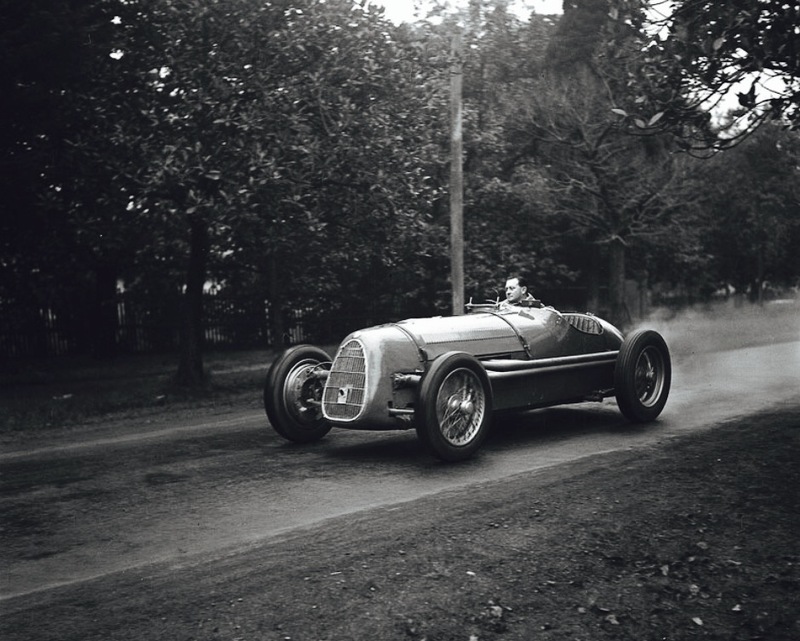 The chassis was then taken to renowned race body-builder Bob Baker who constructed a derivative but distinctive aluminium single-seater body with a pointed tail. 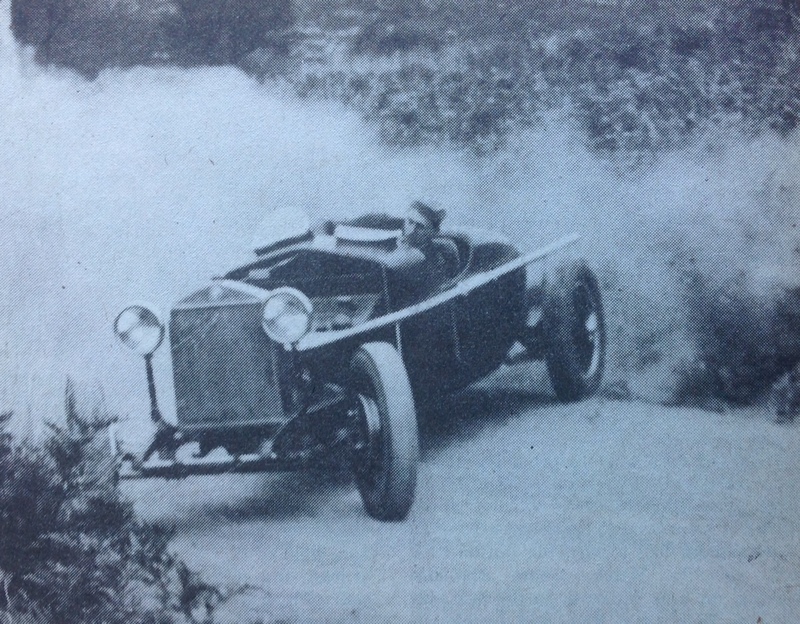 The cars first outing was at Balcombe as recorded above, coming second in its semi-final. 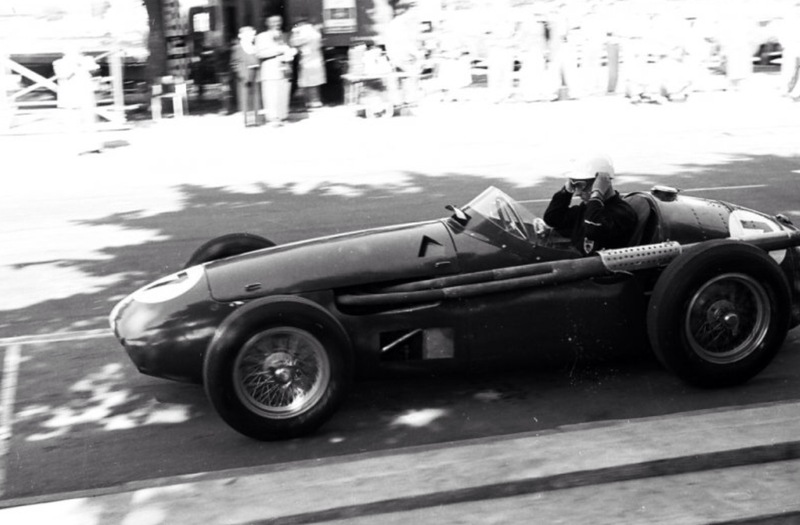 The Alfa didn’t race much, the P3 was the front line car until the AGP winning HWM Jag was acquired/built later. It was retained by the Davison family and moved from property to property before finally being restored by Nick Langford’s restoration business in Castlemaine. It made its debut in December 1979. 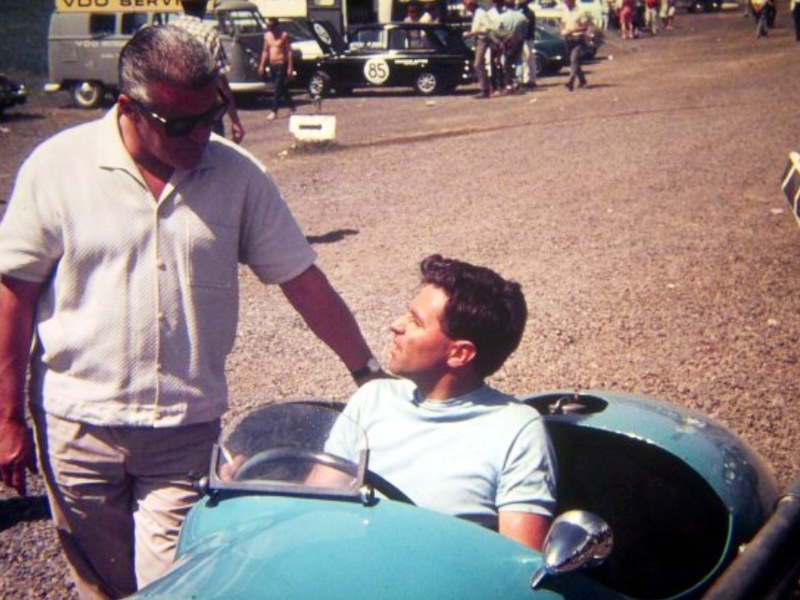 ‘It was a massive honour for me to drive ‘Little Alfa’. The car was purchased by my grandfather in 1928 and used as the family car until his death in 1942. It was only then that Lex got hold of it and started racing it. Of course this is the same car that Lex and Di drove to Bathurst for their honeymoon and also became one of his first racing cars. But he only did a handful of races in it. I am not sure that it was going to be competitive and he got the opportunity to purchase the P3, or ‘Big Alfa’ as it was known in our house. 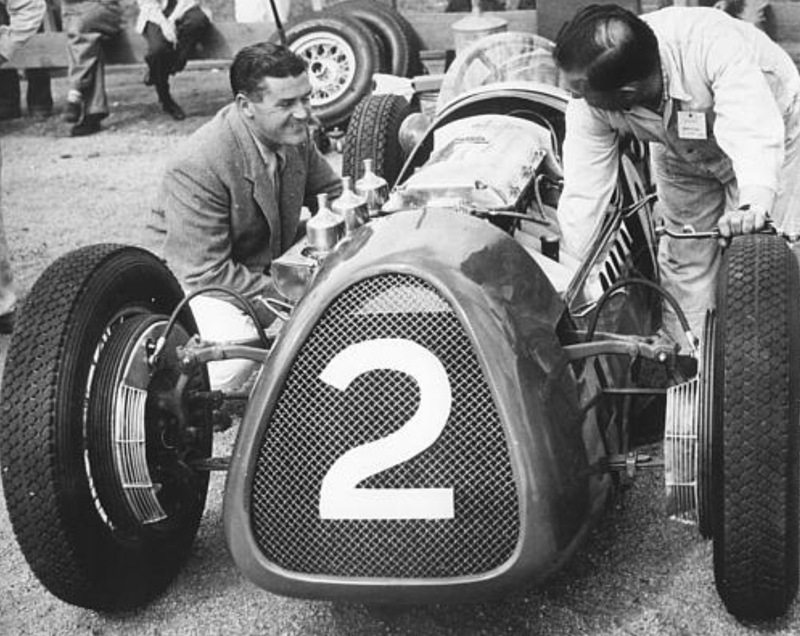 This is why the cars were known as the ‘Little Alfa’ and the ‘Big Alfa’. ‘In terms of actually driving it, i am taller and broader than average so it was a real squeeze to fit in. We took out the seat and I sat on the floor on an old sheep skin. The first thing you notice is that it has an accelerator pedal in between the brake and the clutch, and this does take some time to get used to. With no actual fuel pump, you must ‘pump up’ the air pressure in the fuel tank with a dash mounted pump and if you get busy around the circuit its easy to forget to do this and next thing the engine starts to die from lack of fuel. The alcohol fuel used to cause problems with the supercharger freezing up, so it was very important to get the fuel mixture right’. ‘Being a tight fit in the car, I used to feel the chassis rails flex whenever I went around a corner or hit a bump.With no seat belts or roll bar, driving the car flat out up the back straight at Sandown was one of the most dangerous things I have done in motorsport, especially as I was virtually held in the car by a low piece of bodywork and hanging onto the steering wheel for grim life’. ‘The term ‘brakes’ could be described as an overstatement, ‘restrainers’ more accurate. 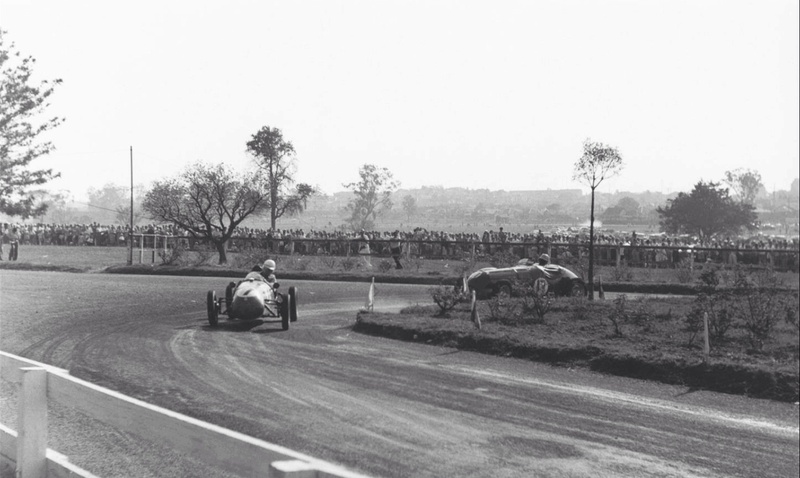 The car weighed 1500kgs and with a blown 1500cc engine on alcohol, you picked up quite a bit of pace down the long straights. 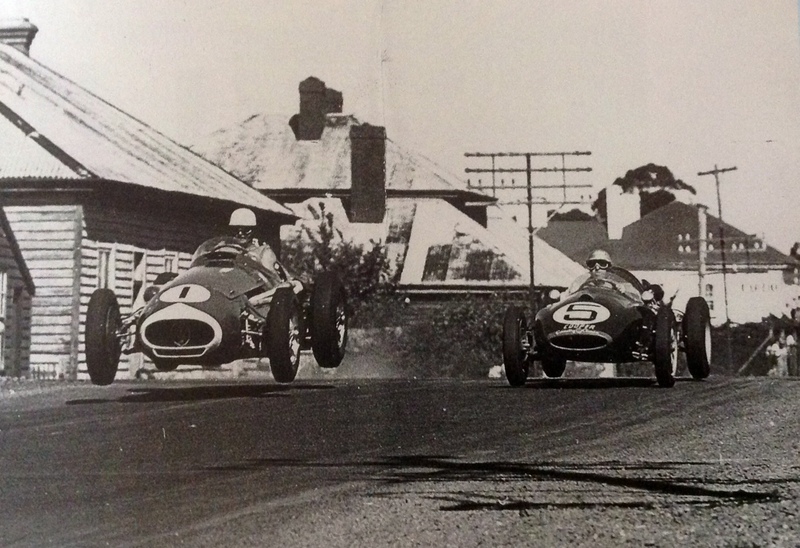 I did give the fence a whack at Sandown once when I arrived at the end of the old pit straight and had ZERO brakes. The mechanic had forgotten to adjust the length of the brake cable and the shoes were barely even touching the brake drums’. 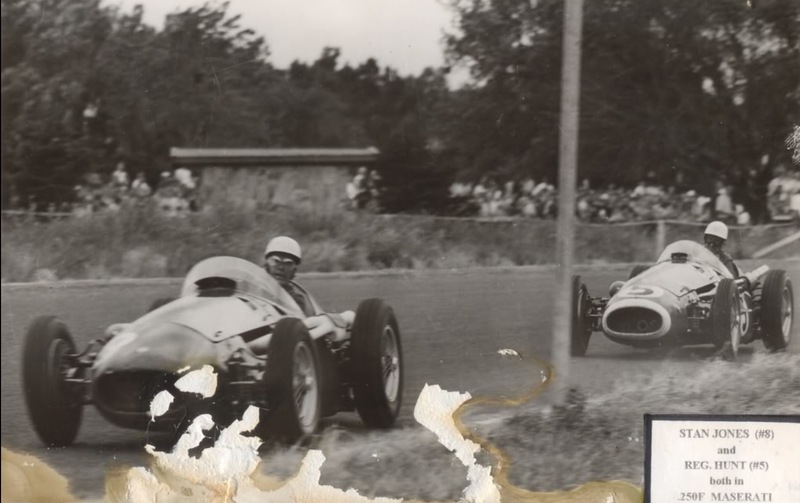 ‘The biggest problem I had at that meeting was once I really got the car going well, the speed up the straight and through the kink was such that both front wheels vibrated very badly, which was a real concern when you were so close to the old quarry wall. In the wet the car was a nightmare with levels of understeer that could only be described MASSIVE. With very old tyres and little adjustment on the car, I used to use the handbrake on turn in to try and get the rear end to generate some changes of direction. But I walked a fine line and really had to get the timing right, requiring a flick into the corner, quick pull on the handbrake to get the rear to slide and power on to keep up some attitude. If you got it slightly wrong it was back to uncontrollable understeer and all I could see from the cockpit was a VERY long red bonnet and two front tyres wasting their time with massive levels of lock’. 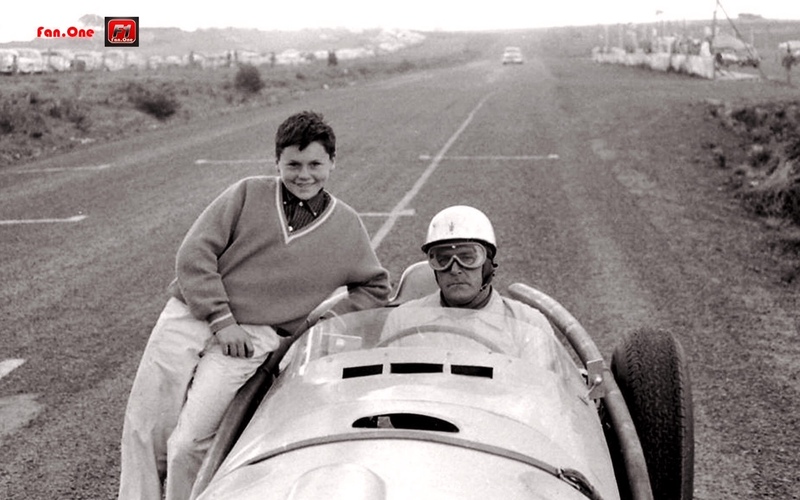 ‘It was fabulous to see Mum and Tony on the circuit in the ‘Little Alfa’ but Mum did find it difficult to drive. 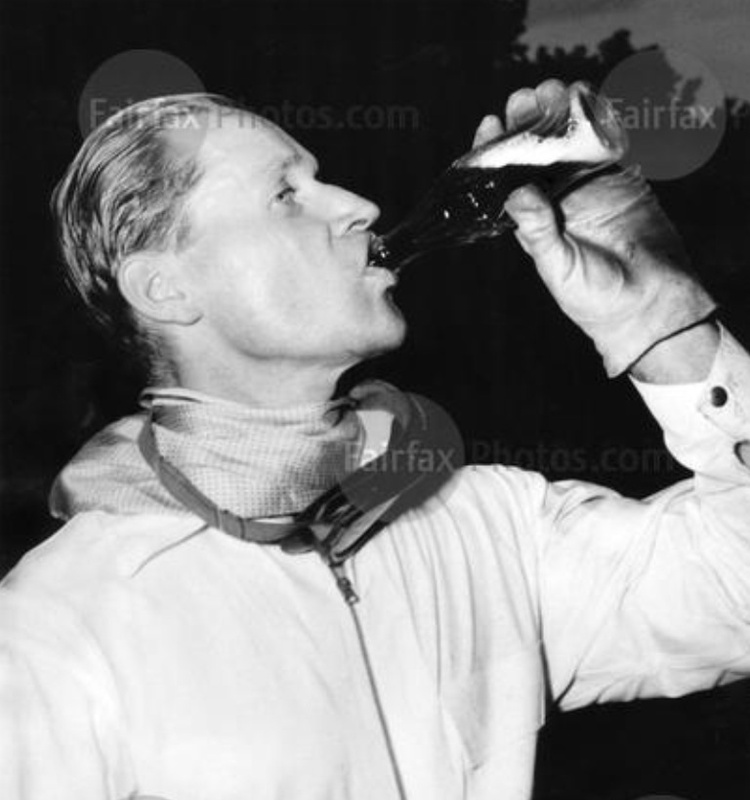 So we ‘retired’ the car after the 1986 Amaroo meeting satisfied that we had actually seen the car fire a shot in anger’. 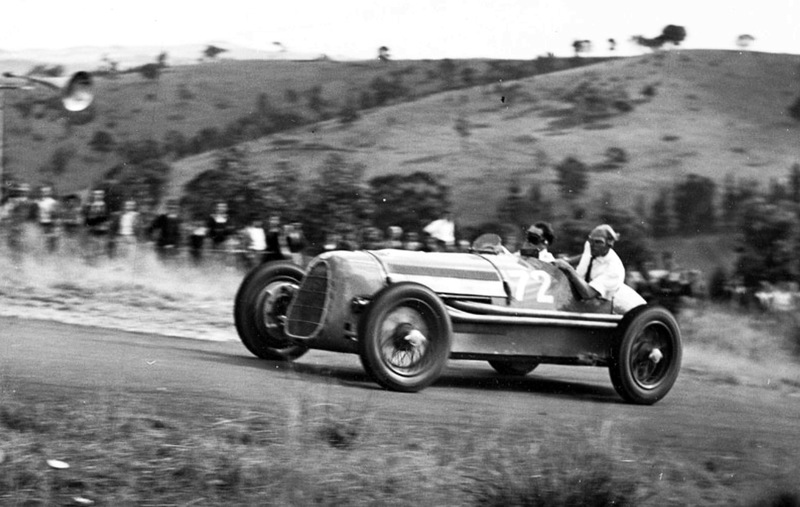 ‘Little Alfa’ remained in the Davison family until sold some years ago but thankfully remains in Australia in the hands of a caring Alfista, the car has an entirely Australian history since it’s departure from Italy in 1928. 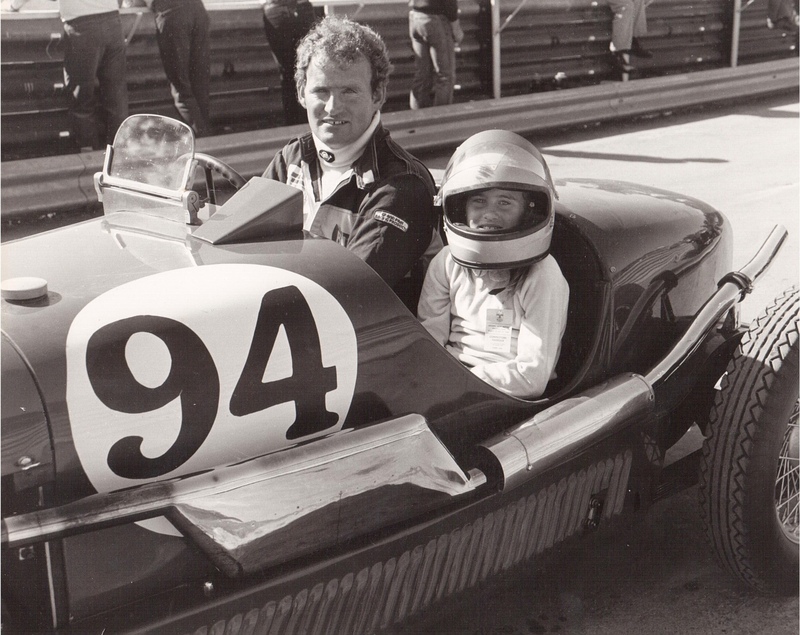 Chris Davison…’I know that all of our family are delighted to see Trevor Montgomery now driving the car at most of the historic race meetings in the south. I feel that he understands and respects our family’s connection to this unique car and unique piece of Australian motorsport history’. 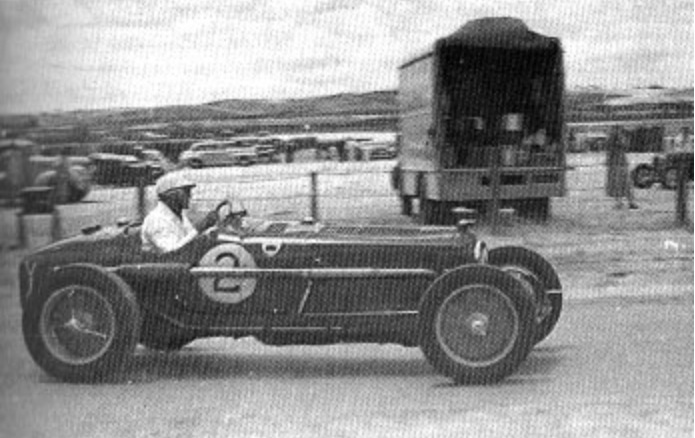 Derek Jolly’s Austin 7 Spl, he later won the 1960 Australian Tourist Trophy- a decade hence aboard an ex-works Lotus 15 Climax. I wrote about he and his cars a while back. 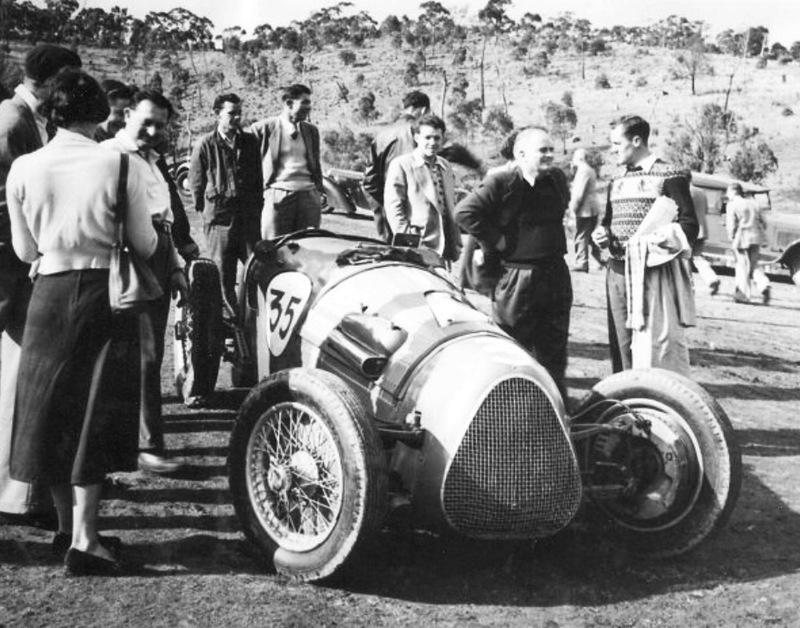 Love these these two shots above of Lyndon Duckett and George McKaige preparing the Anzani Bugatti before the event on a frosty Melbourne day in ‘Duckett’s Lane’- Towers Lane behind Duckett’s Towers Road, Toorak home. Road car is a Rover P3. 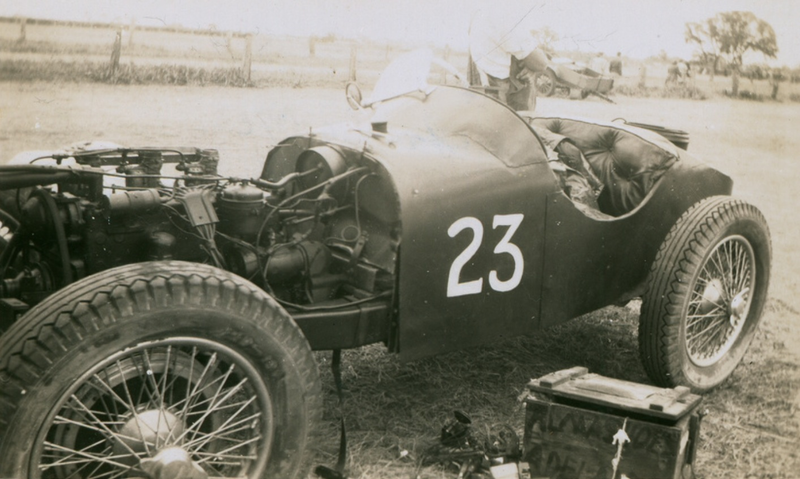 MG K3 and engine above- here unsupercharged. The Keith Martin (John Medley thinks) Cooper Mk IV JAP 1000- which must have looked ‘other worldly’ to the good citizens of the Peninsula in 1950. 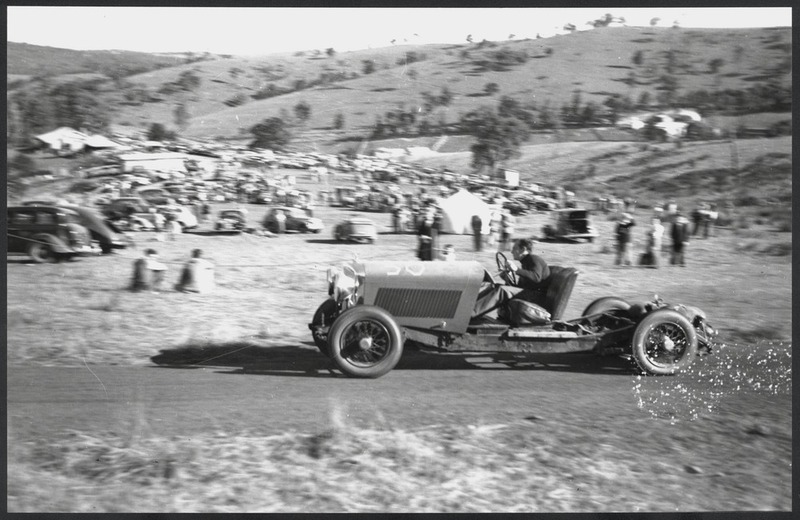 The modern as tomorrow Cooper is nicely juxtaposed with Doug Whiteford’s self-built #4 pre-war ‘Black Bess’ Ford V8 Special which won that years AGP at Lobethal six months before- and on the day at Balcombe. 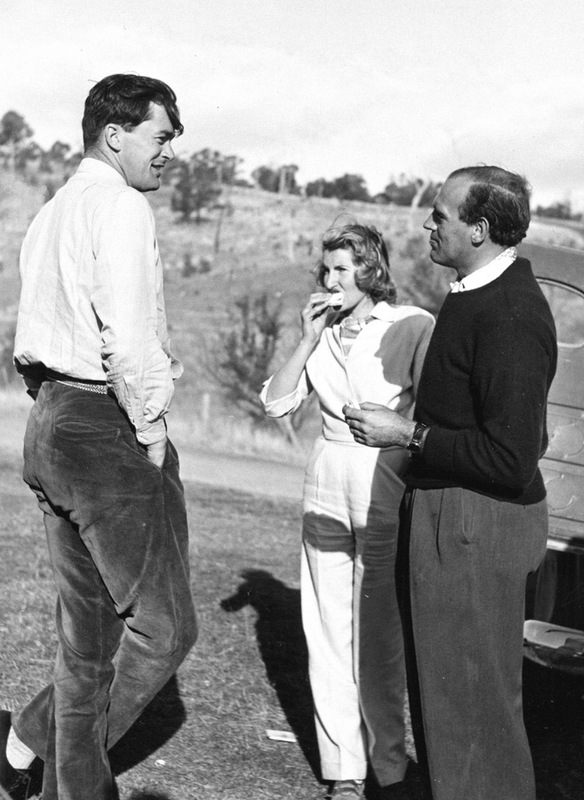 There were no Coopers at Lobethal but two made the long trip to Narrogin, down south of Perth in 1951, Martin’s car and a later MkV driven by John Crouch. 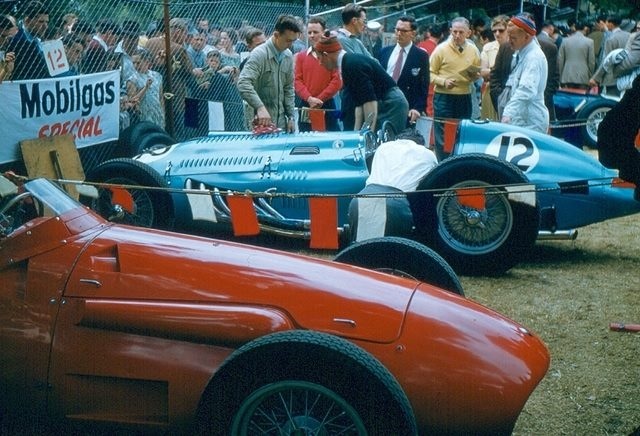 #1 is Tony Gaze’s Alta and to its right Maybach with the bonnet covered- there was plenty of life in the front-engined cars at that stage of course, but the mid-engined era was underway from that little factory in Surbiton.